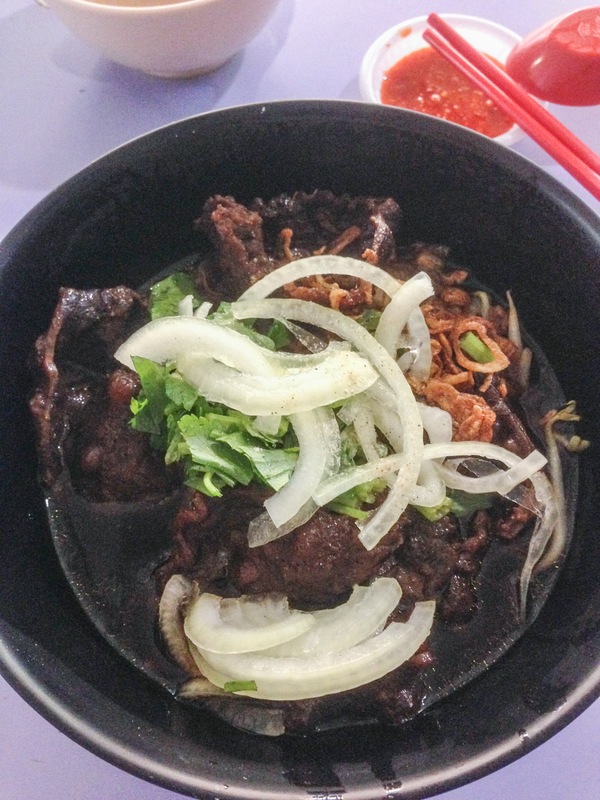 Update: July 20, 1018 – Added Qiu Rong, Ma Bo Lor Mee. 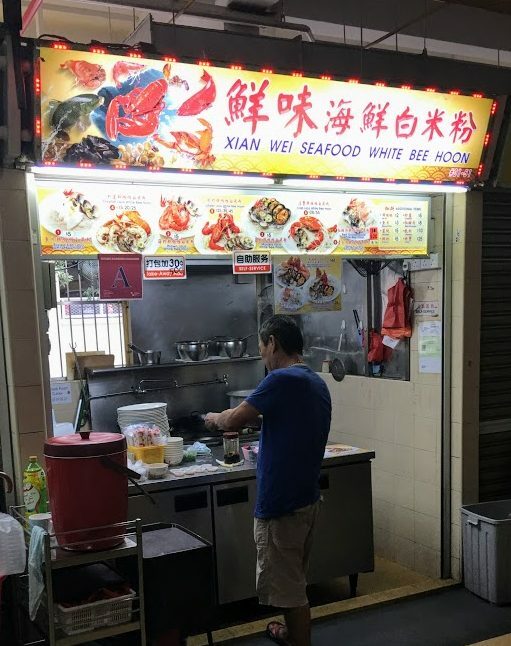 Noted closures of Xin Wei Seafood White Bee Hoon, Dessert Hut, Soo Kee Fishball, Ma Bo Lor Mee and Gin Sen.
Update: March 28, 2018 – Noted closures of Wonderfull Nasi Lemak, Chang Jia Cai Png, Wang Lai Yong Tau Foo. 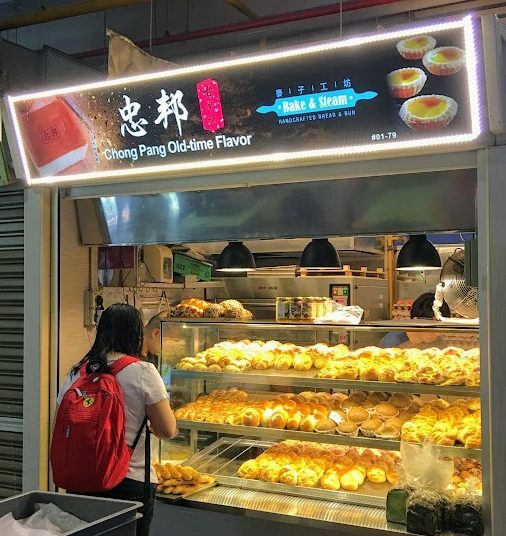 Added Whampoa Soya Bean, Hua Kee Chicken Rice/Char Siew Rice, Tan Beng Otah, Hougang Otah, 727 Bakery, Xin Tian Di Bakery. 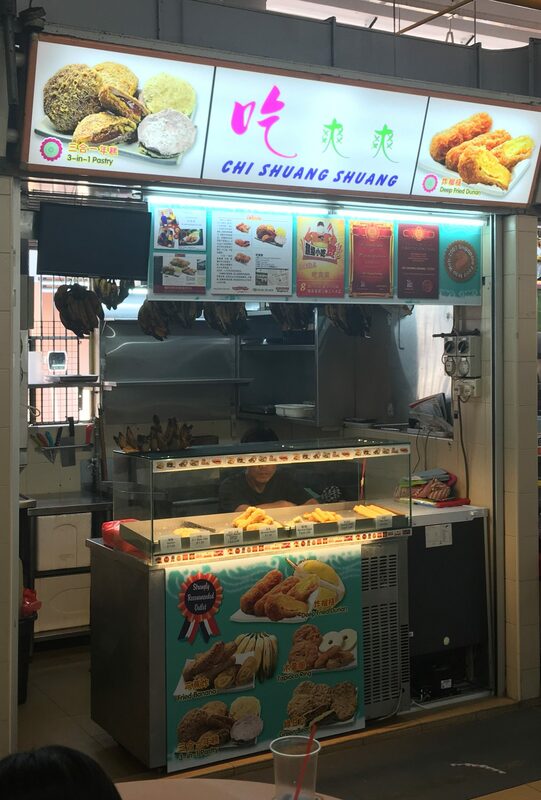 Update: January 31, 2018 – Added Chang Jia Cai Png that took the place of Roti Tiam. Update: January 1, 2018 – Happy New Year! 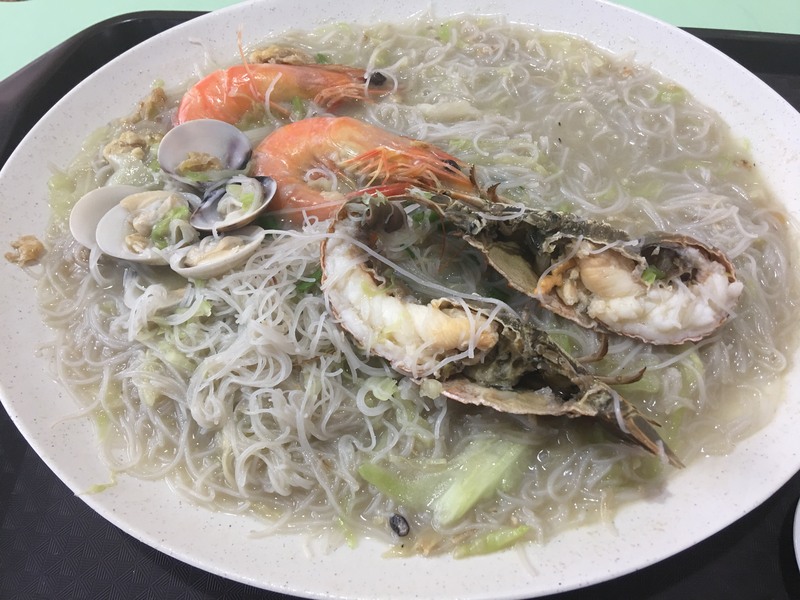 Added Gin Sen, Salt, Roti Tiam, Buppies, Ice and Xin Wei Seafood White Bee Hoon. 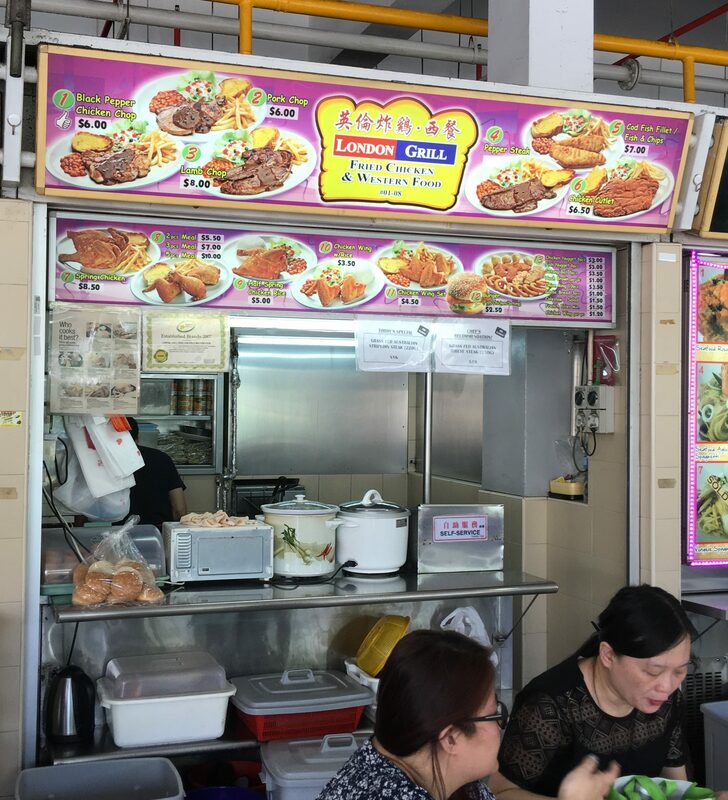 Moved more stalls to the section of closed stalls (Old Airport Road Legacy Stalls (click to go there)). 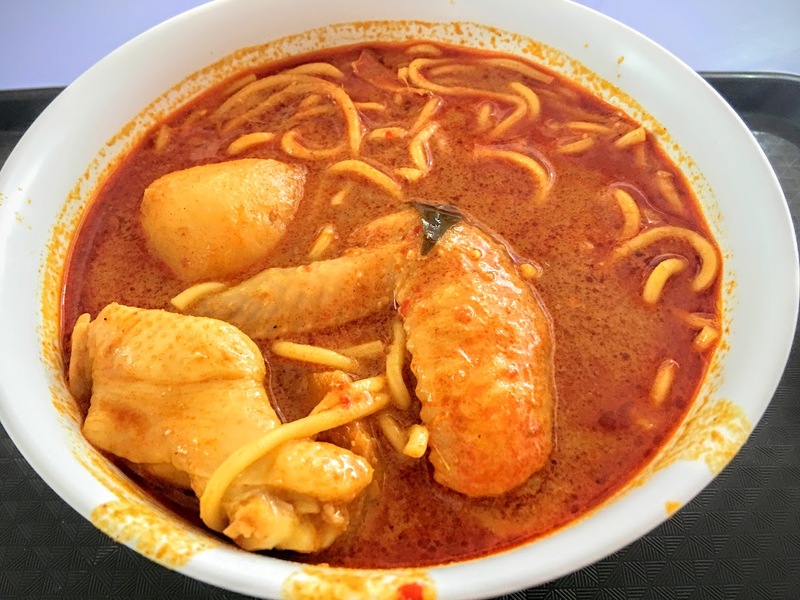 Noted closures of Xin De Shi, Curry Api, Nasi Bakar and Thai Street Noodles. Noted closure of Wen Wen and their move back to Geylang Bahru. 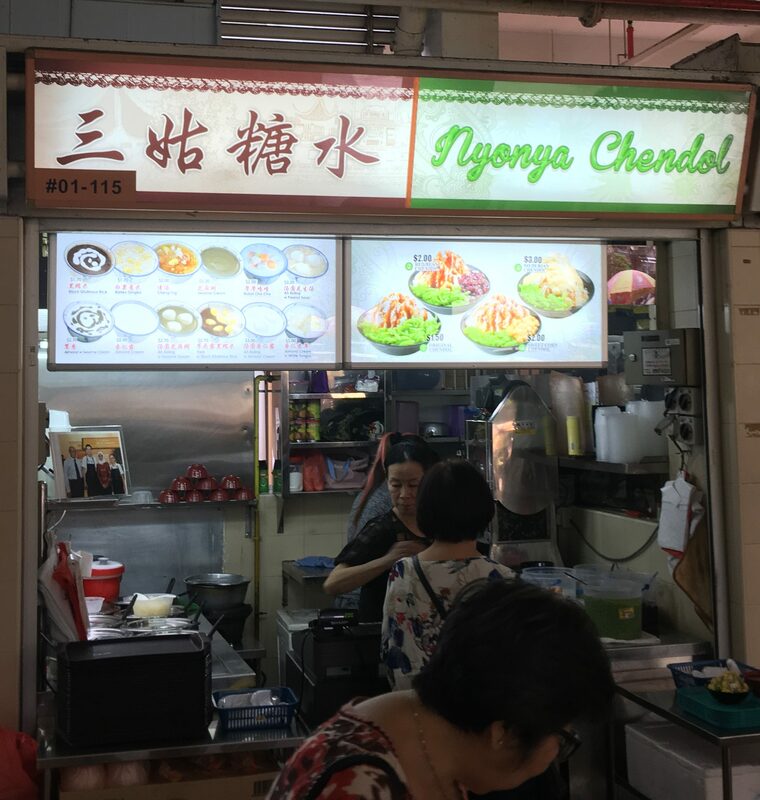 Noted merging of Dessert Hut and Nyonya Chendol. Updated number of stalls in each category. 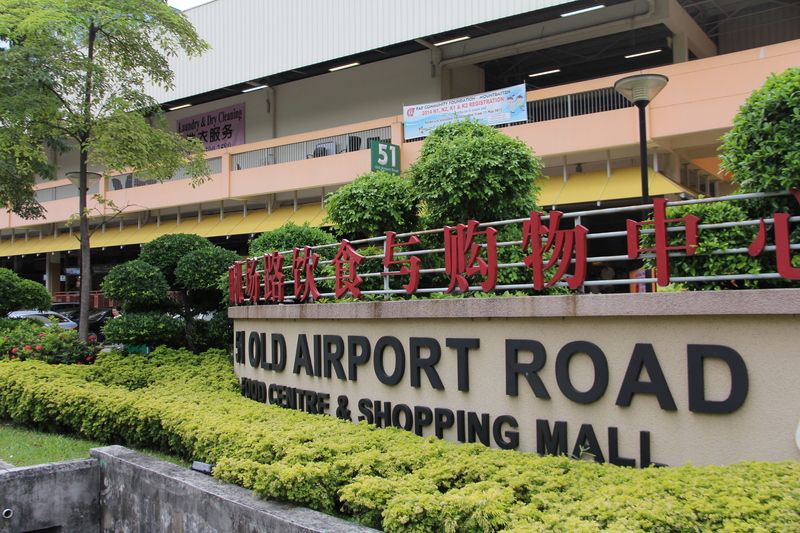 Old Airport Road Food Centre is arguably the best of the hawker centres in all of Singapore. 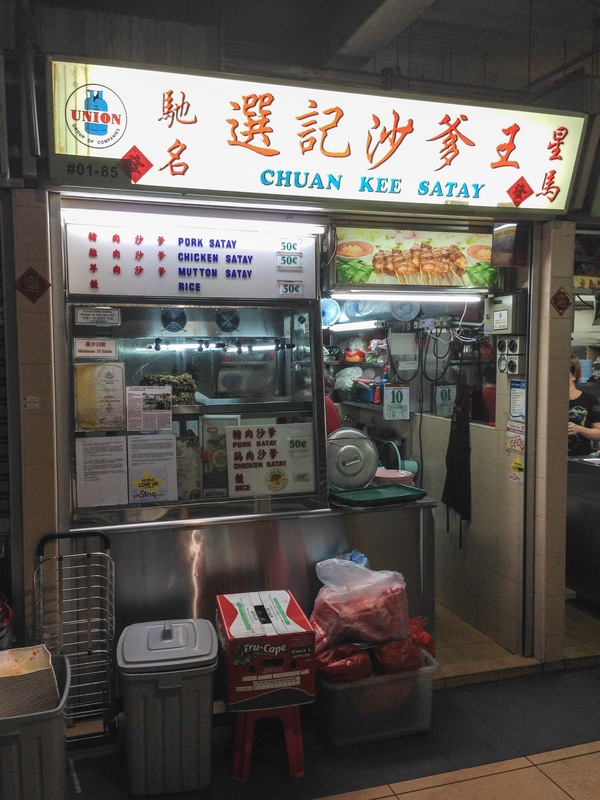 Opened in 1973, it is comprised of 168 stalls, providing one with a cornucopia of delectable Singaporean Hawker fare. 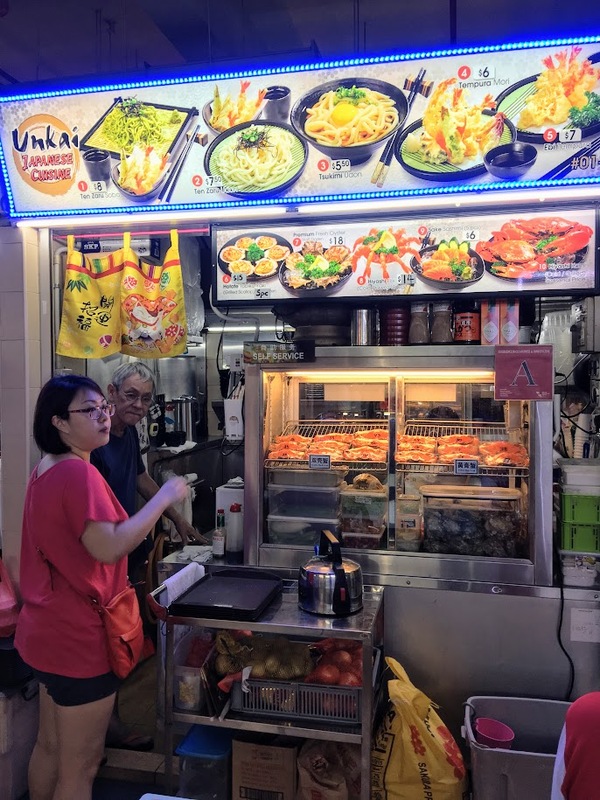 If you want to truly know what Singaporean hawker food is all about, this is a great place to start your journey. Let’s break down what’s at Old Airport Road first. 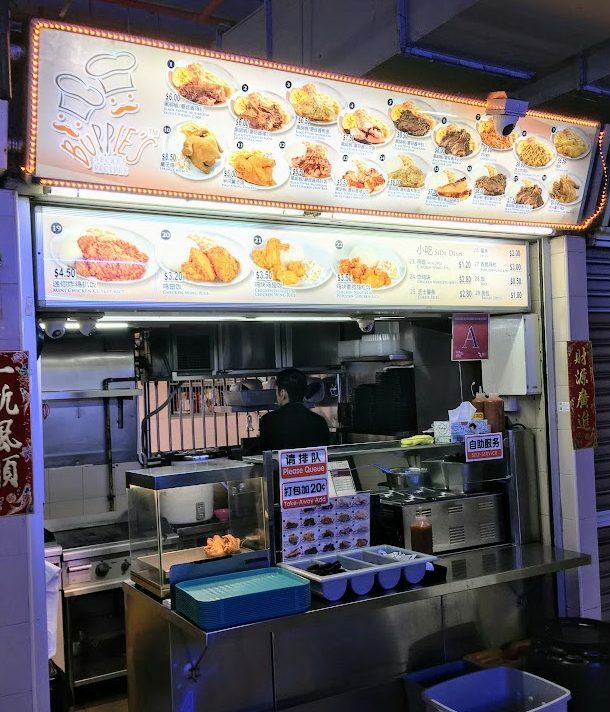 It’s quite the variety of foods, this is why I say that Old Airport Road is a great introduction to the Singapore hawker food scene. Here’s a guide through the maze of smells and delicacies. 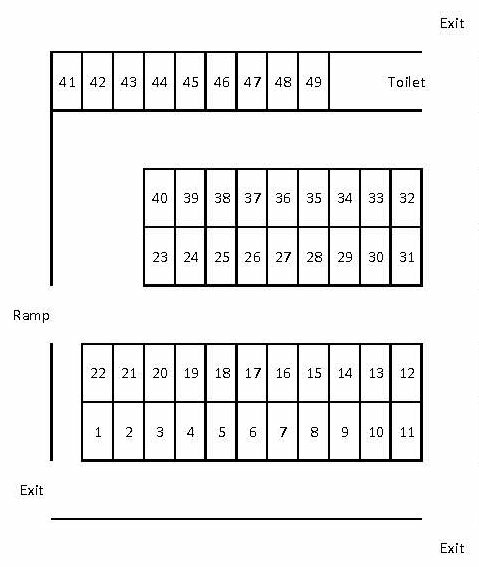 First off, here is a map of Old Airport Road with the stall numbers. 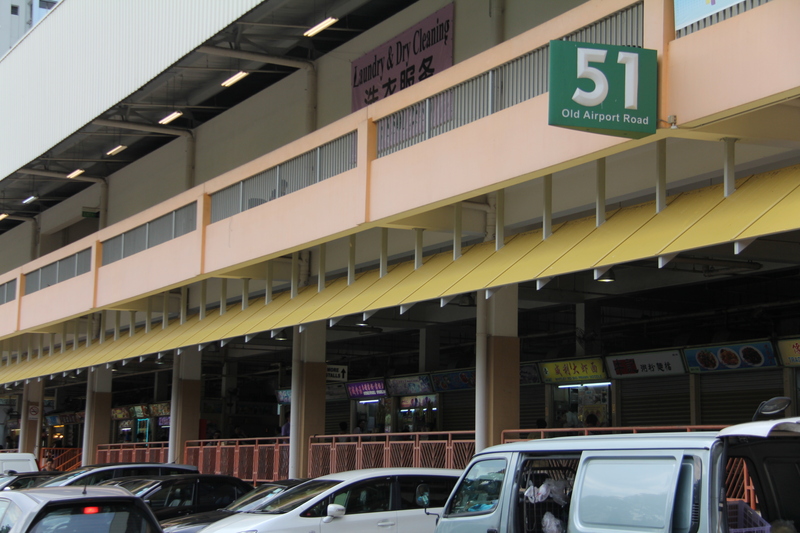 This is the top view, with the bottom being Old Airport Road itself, or what I refer to as the front of the hawker centre. This is a little difficult to see because it is so big, but you can click on it and it will bring you a bigger image size. I like to split Old Airport Road into four (4) sections. Left, Middle Left, Middle Right and Right. Left = 1-49. 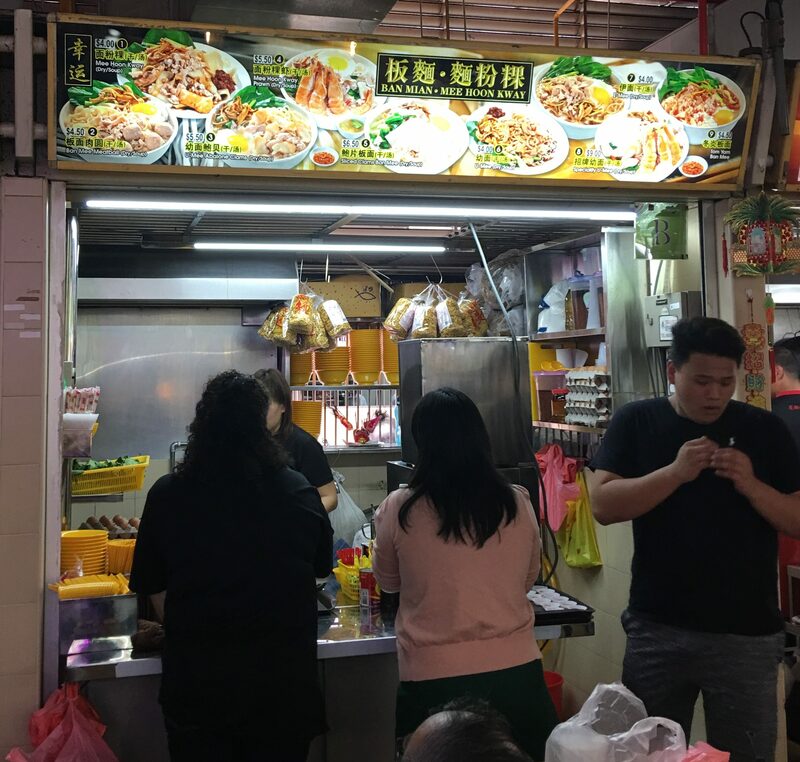 This section contains a lot of famous stalls including Nam Sing Hokkien Mee (32), Lao Fu Zhi Char Kway Teow (12), Cho Kee (4) and Hua Kee (2) Wanton Noodles, Albert Street Prawn Noodles (10) and Ru Ji Fishball Noodles (37). Middle Left = 50-103. 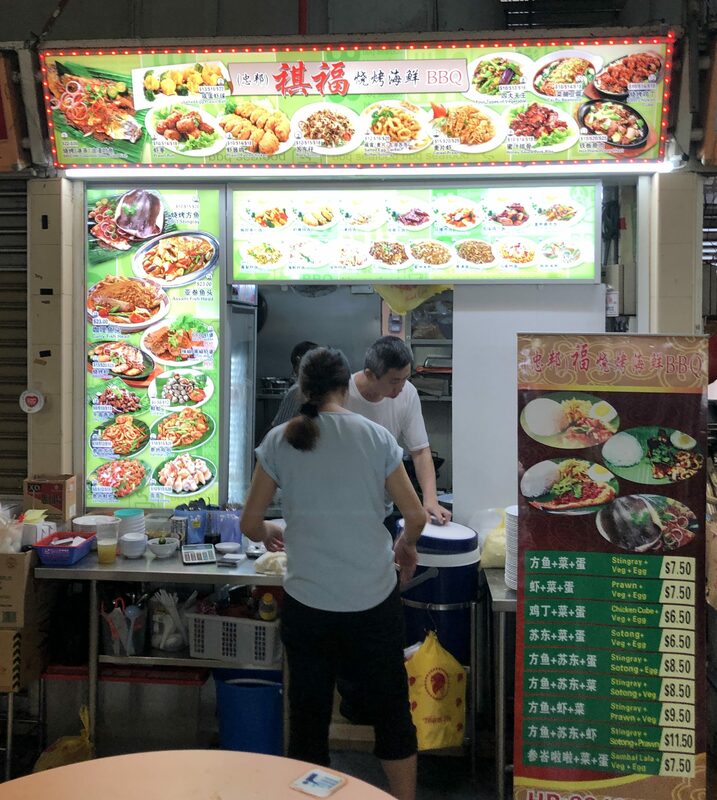 This section has Mattar Road Seafood BBQ (63), Chuan Kee Satay (85), Whitley Road Prawn Noodles (98), Meilock Soursop (82) and Xiang Ji Lor Mee (81). Middle Right = 109-131. 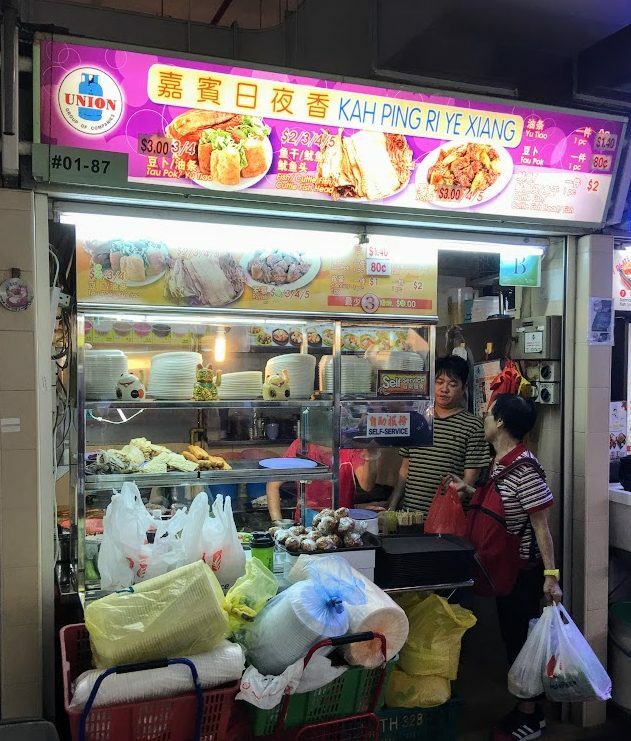 This section contains such greats as Blanco Court Kway Chap(135-136), Tiong Bahru (124), Roast Paradise (122), Xin Mei Xiang Lor Mee (116), Toa Payoh Rojak (108), Lao Ban Soya Bean (107) and Aunty Oats Pancake (110). Right = 132-168. I affectionately call this portion the “sleepy” portion of Old Airport Road, as there is not a lot of action here. Stalls here are Lau Pa Sat Taiwan Porridge (167), Yummy Thai (161), Freshly Made Chee Cheong Fun (155) and Tong Xing Roasted Meats (158). I’m going to focus on the most popular stalls and types of food. I won’t mention all of the stalls here, only a good representation of what one can get at Old Airport Road. 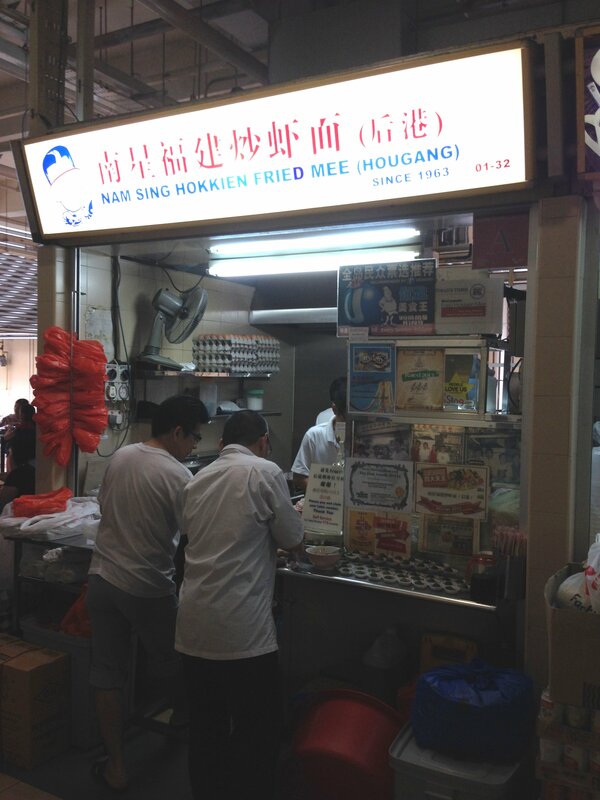 Old Airport Road is home to some Singapore Hawker Legends, including Nam Sing Hokkien Mee (32, left). The delicate rice vermicelli and noodles soak up the delicious pork and prawn broth giving rise to a dish which sings of flavor with every bite. These brothers have been at it for a long time and it shows in their craft. 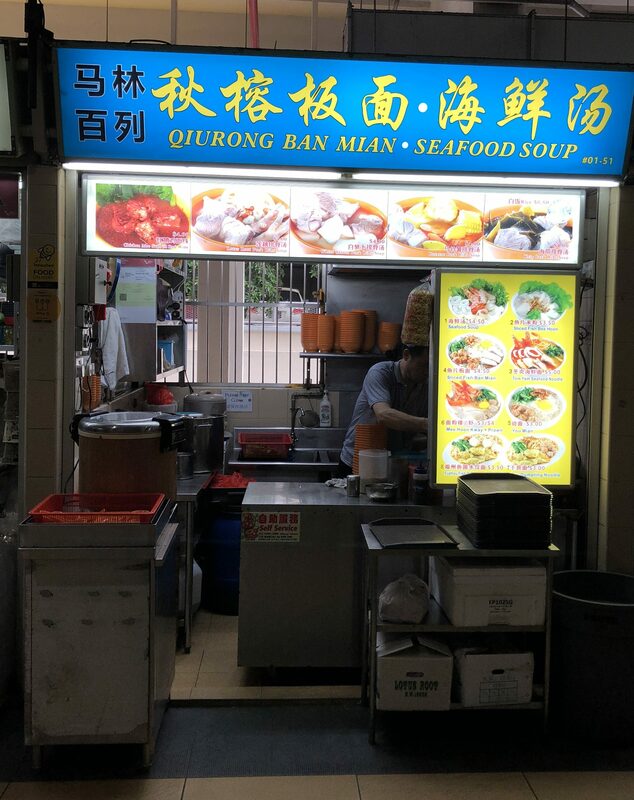 Recently, they’ve made their Hokkien Mee quite soupy, thus my suggestion is to get it to takeaway. Even if you want to eat it there, wait for it to be packed, and then just let the noodles soak in the broth in the package. Be a little patient and wait for about 5-10 minutes, then open it up. You will see the difference. The first picture is that ordered to eat there. They will bring it to your table if it’s close to their stall. Notice the broth is still there, and not as dry as I like it. Now, take a look at the takeaway package, waiting 15 minutes and then eating it. You can see there is quite a difference. In fact, if you order it to takeaway, they usually have a few sitting around that have already been made. Thus, the broth is fully soaked in already. One note here though, if you order takeaway, you can usually only get the $5 portion, which is premade. If you want the $3 portion, it’s really only for eating there. One more note, since they are located in the “back”, but on a corner, they have put a light bulb on the side of their stall. When it’s lit, they’re open. When it’s not, they are closed. Thus once you walk in the front and glance down the aisle, you can immediately tell if they are open or closed. Here is the light bulb, off to the right, off, thus meaning the stall is closed. Here it is on, meaning, let’s eat! 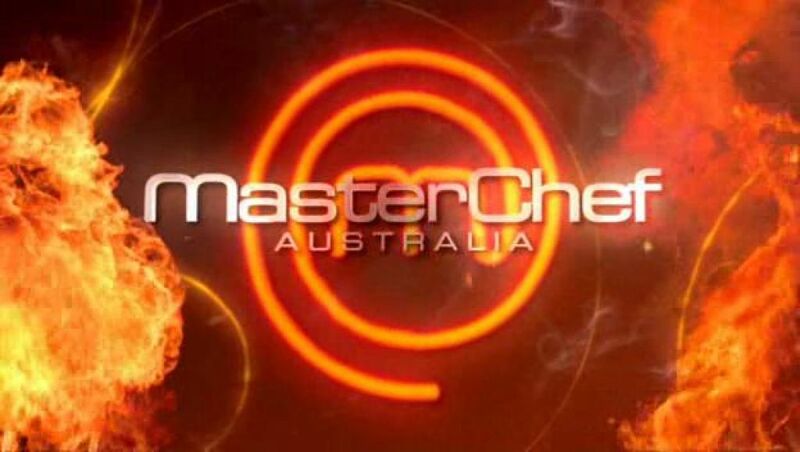 The logo is that of the uncle that does most of the cooking. 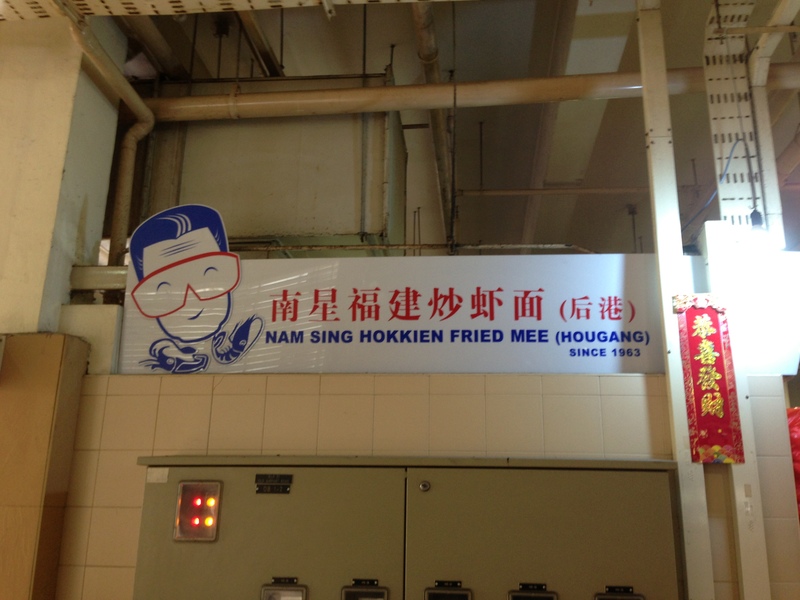 He puts on those glasses when he is frying his Hokkien Mee. Nam Sing is open from the mid-morning until the mid-afternoon. 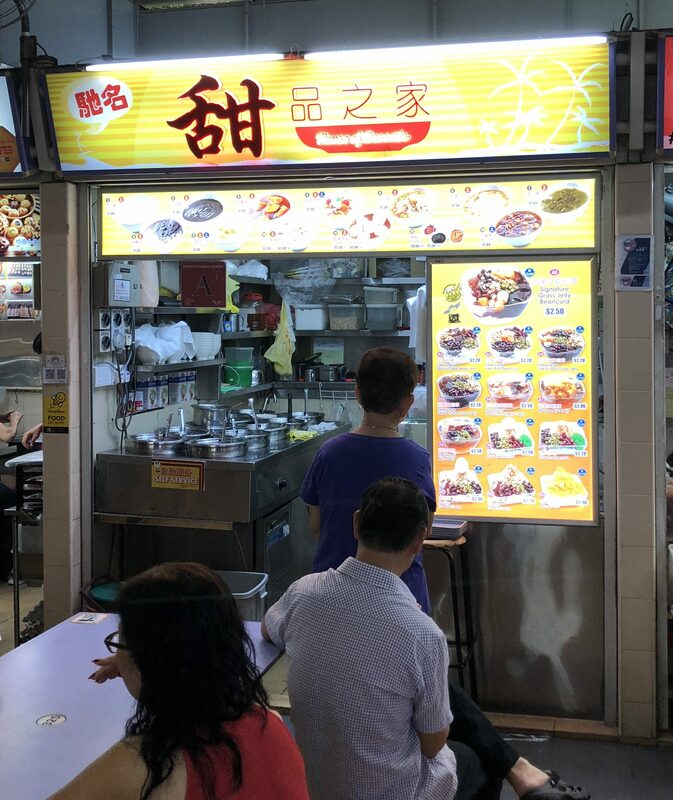 If you want nice dry Hokkien Mee at night, then I suggest going to Yi Ji Hokkien Mee (102, middle left). 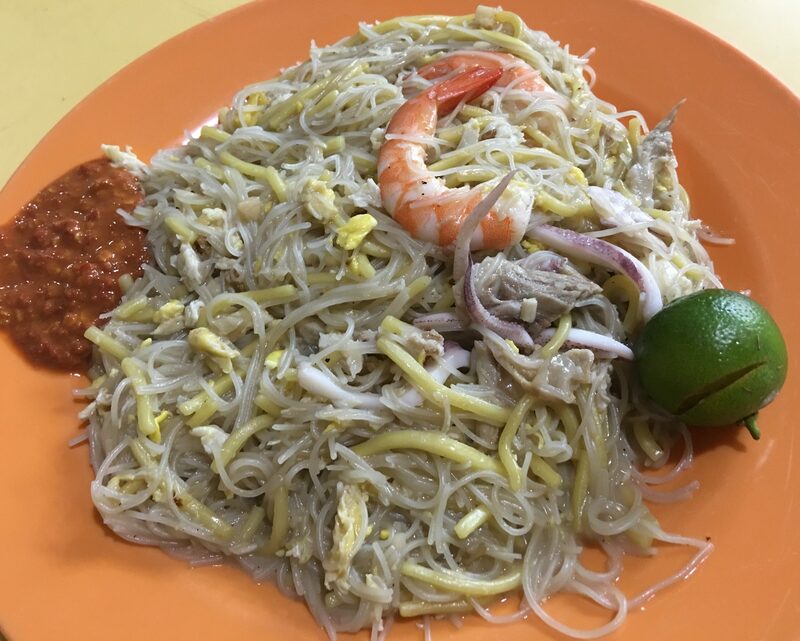 They make a real nice drier style Hokkien Mee. Notice the signboard says “Super Spicy” Chili! It packs quite a wallop, so be careful with it. This is it, right out of the pan. Nice and dry, not too soupy. The taste is real good, and the chili, wow! 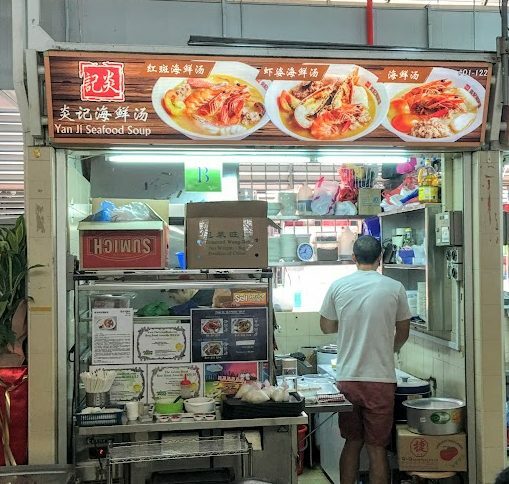 There is another Yi Ji a few stalls down at 99. Same signage, but open at different times. Are they the same or not? And apparently, they have many locations around Singapore. Who knew it was a chain? Not me. 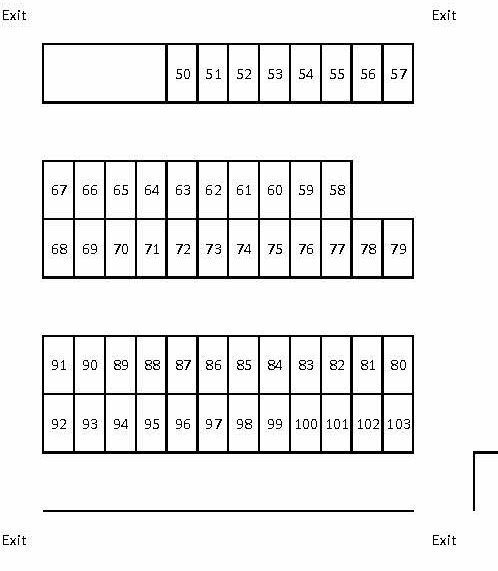 But apparently, the stall at 99 and at 102 are different! Now, they say it’s different. Is it? Just a little different. Most notably in the name underneath on the left. But that’s the only difference I see. Now take a look at the actual Mee itself. Taste both yourself and see if you can taste a difference. I honestly can’t. 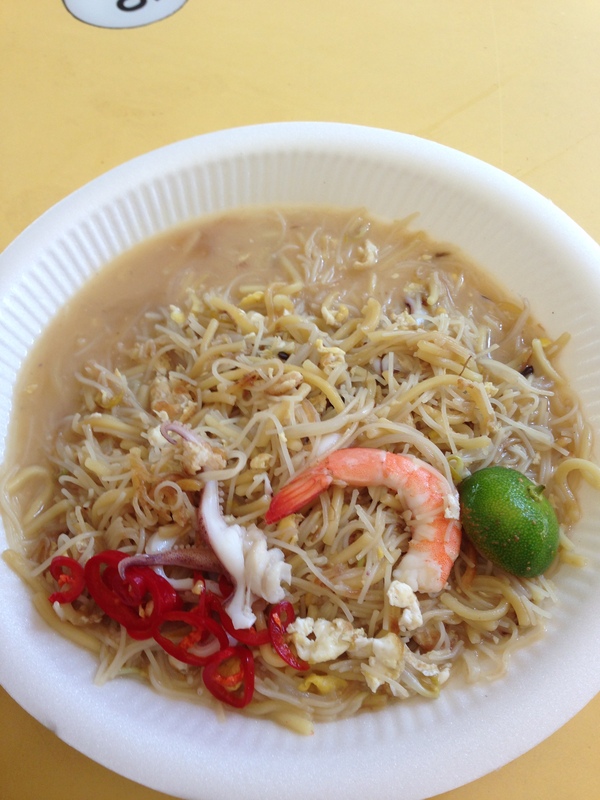 I prefer more Rice Vermicelli (Mee Fun, Bee Hoon) in my Hokkien Mee, not so much the thick yellow noodles. 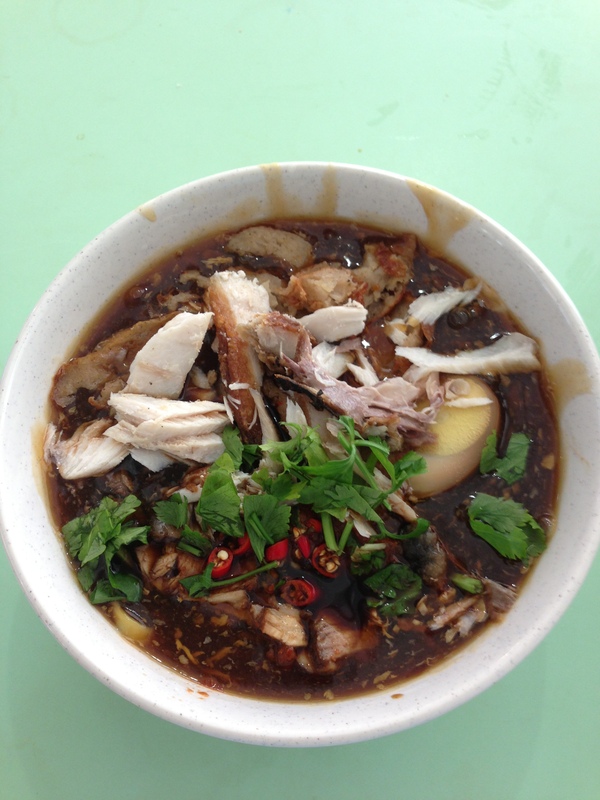 That kind is more soupy and more like your typical hawker fare. You’ll find that I won’t have many Oyster places here, as I don’t eat Oysters. I have heard that Xing Li (28, left) has a good Fried Oyster. 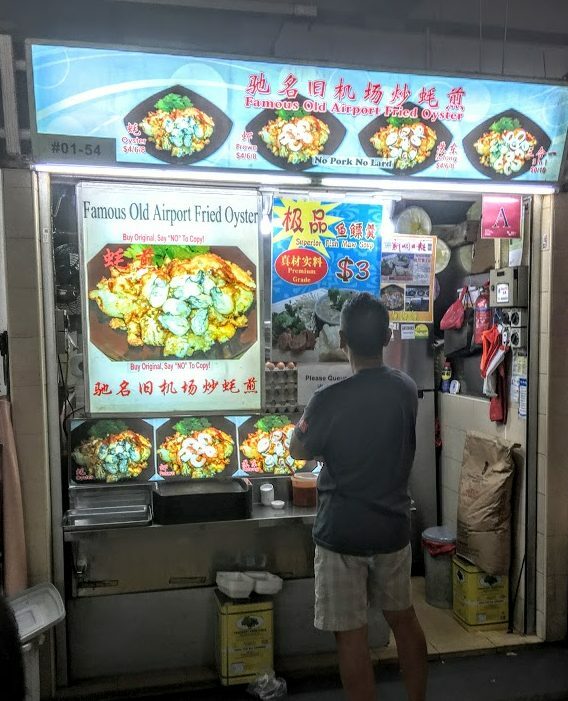 There is also a nice little side-by-side competition in the back middle left at 54 and 55 between Old Airport Fried Oyster and Kallang Fried Oyster (which is also paired with Chicken Wings, see later on). But try it for yourself, I can’t personally tell you which one is good or not. 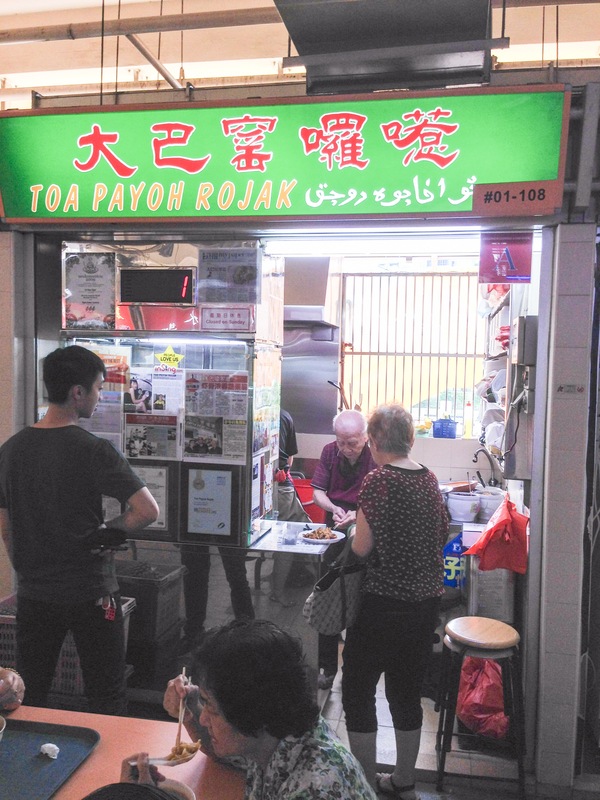 Another Legend is Toa Payoh Rojak (108, middle right), where you queue just to get a queue number. Each dish is made to order and the way you want it. 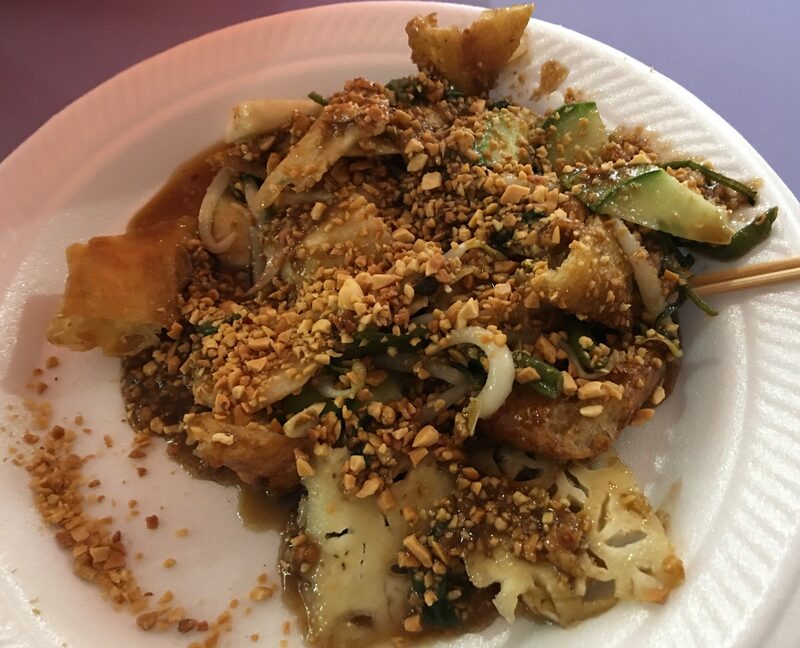 If you want more You Tiao, Cucumber, or extra peanut rojak sauce, you get it. You see the old uncle here, he and his son run the place. 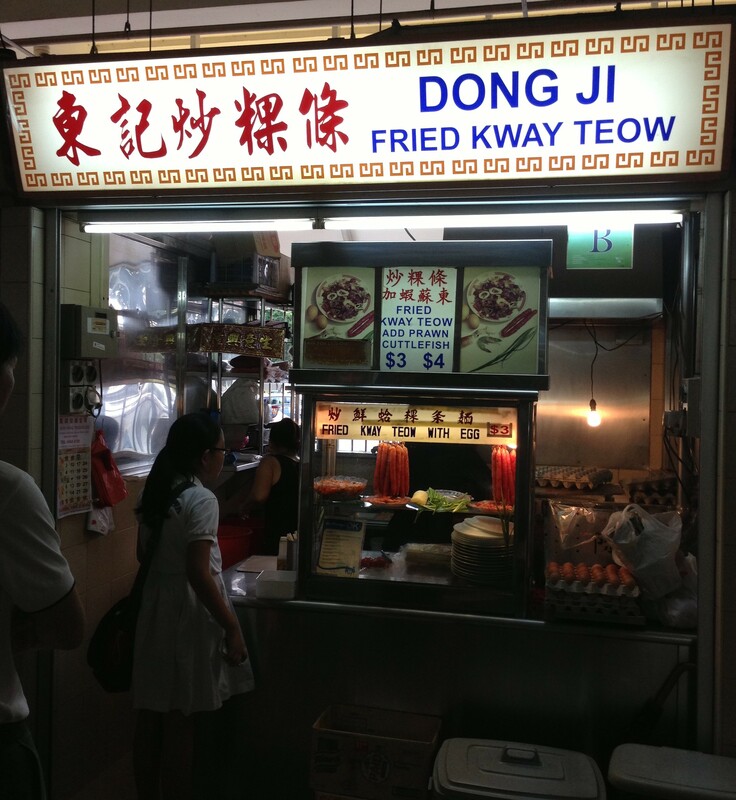 When you get your queue number, some people believe that the old uncle is the one that they want making their rojak. So they wait. I think they’re both equally as good. For us, we don’t really like the pineapple in it. We like You Tiao, Tau Bok and Cucumbers. So that’s how we order it. 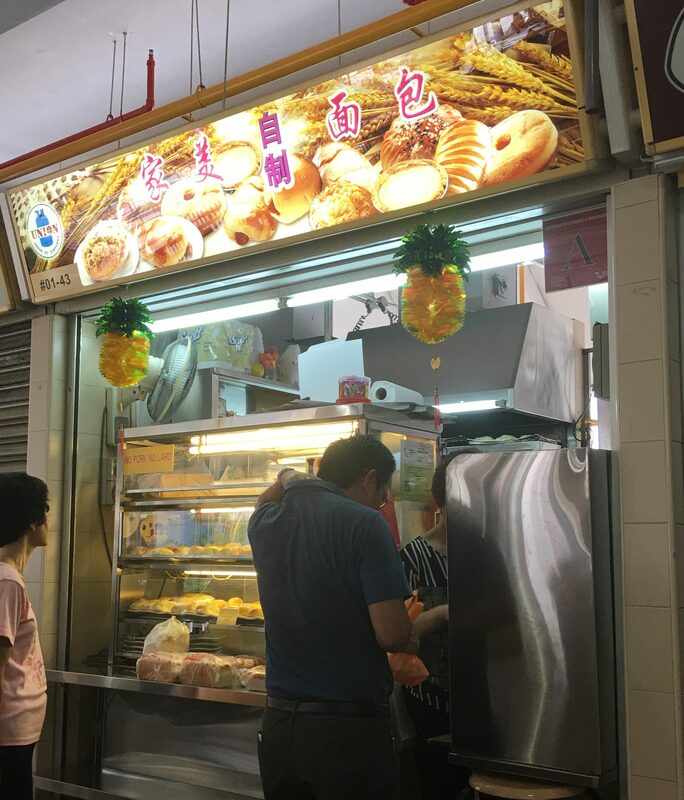 I love that the ingredients are fresh, the You Tiao is still crunchy, the sauce itself sticks so nicely and it is sweet and a little bit stinging. You really enjoy yourself eating these. 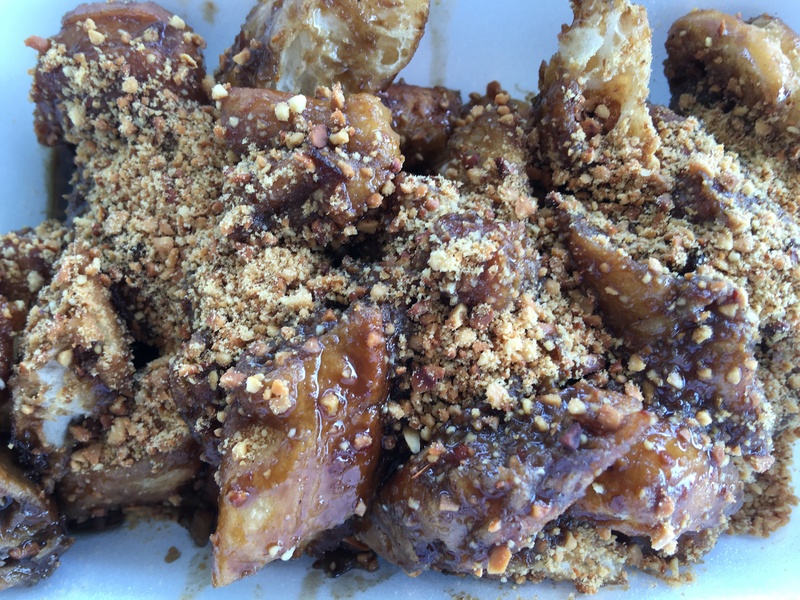 The experienced Rojak eater will not use those little sticks you get, you use chopsticks. Easier and faster to eat! 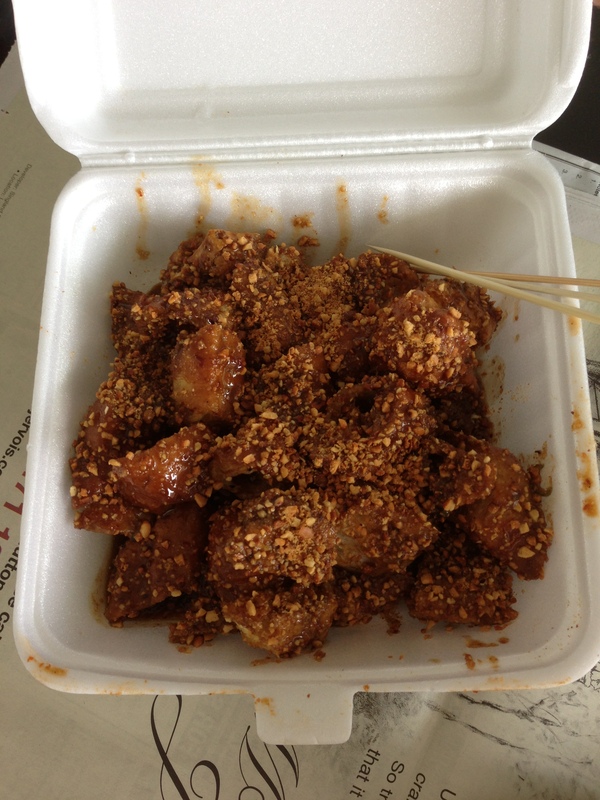 Here is a photo of the normal Rojak. The last time we went, in October, they told us we can’t pick and choose anymore! Not sure if this was just the case on that day or not. Either way, no uncle, and it wasn’t the best that I’ve had from there, it was a bit watery and tasteless. Will have to try it again just to make sure the quality has not gone down. 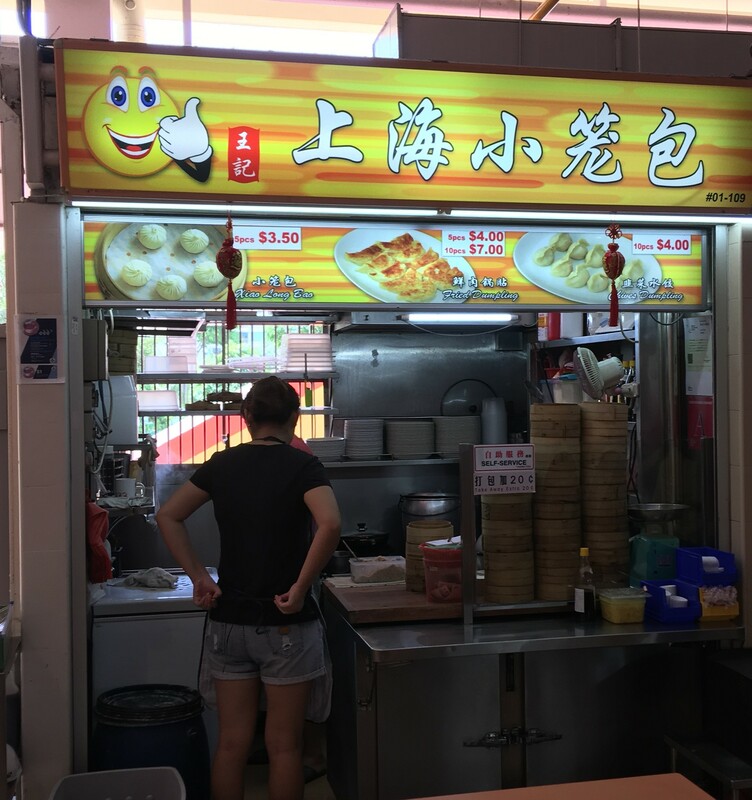 Another option for Rojak when you don’t feel like queuing so long, or just want something else is Lau Pa Sat Cooked Food (151, right). 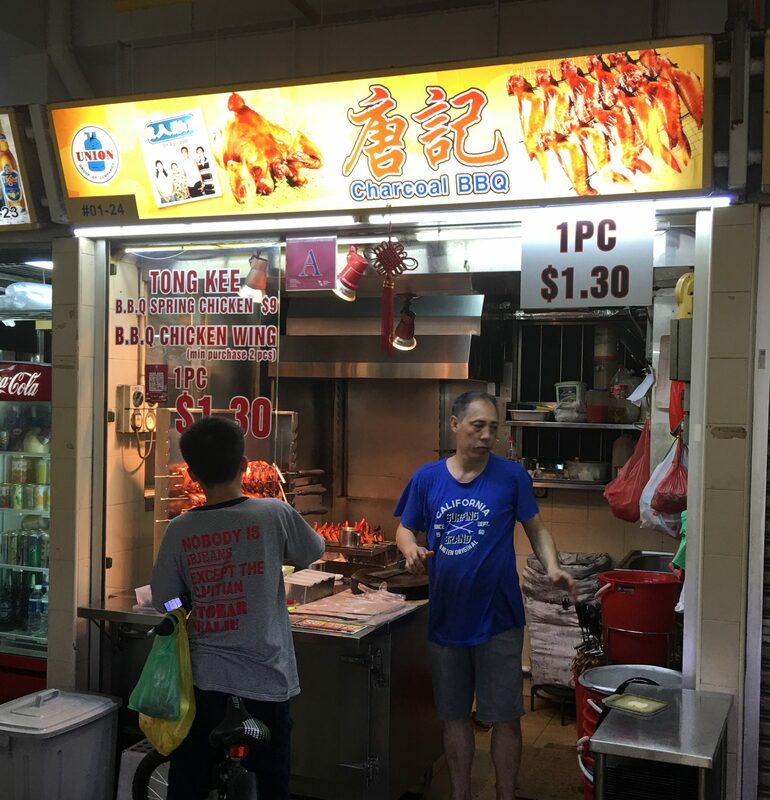 The uncle here says that in order to have good Rojak, you must grill the You Tiao, thus it takes a little longer to make from his stall. The sauce is a little sweet here, but the taste is pretty good. 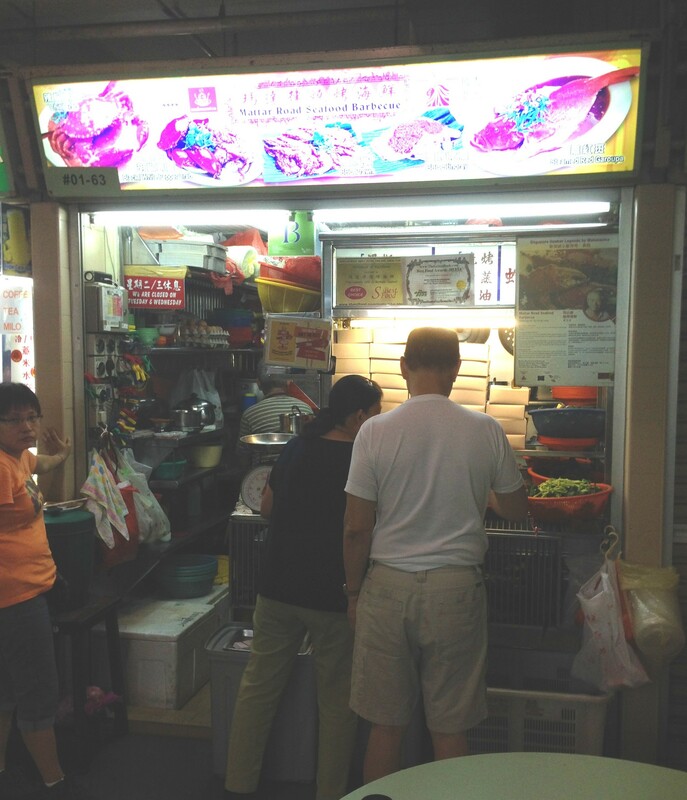 There is also Kah Ping Ri Ye Xiang (87, mid left) which sells Rojak, Cuttlefish Kang Kong, etc. When people ask where to get BBQ or Grilled or regular Seafood, not many people will say, “Go to Old Airport Road.” But I counter that and say to you that you can find real good seafood here. Some say the best Chili and Pepper Crabs come from Mattar Road Seafood BBQ (63, middle left). Open each evening, except Tuesday and Wednesday, it gives you a crab cooked perfectly, complemented with a subtly spicy and sweet sauce that oozes all over the lovely crab. The queue here can get pretty long, so I usually order it, and then go order other things. They will serve it to your table, or you can always take it away. 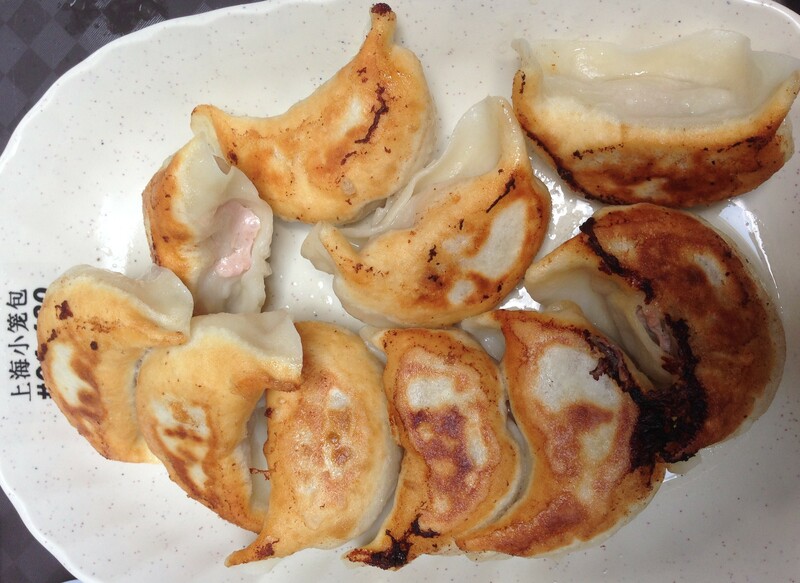 I love to takeaway here, because I can order it and come back after doing other things to get it. One thing that they do here is serve you female crab. Definitely make sure you order the female crab. Aside from the crab roe, the meat is a little sweeter in my opinion. And the price is not bad. It will be about $35 for one crab. The sauce here is really nice. Not too thick and floury, not too spicy and not too sweet. It strikes a nice balance that you can lick off the crab before diving in. The uncle cooks it just to the point of doneness and let’s the sauce do the rest of the cooking. It truly is a magnificent and well done crab. The Salted Egg Crab is a little different here, it’s not crumby and all over the sauce and crab, instead you find it mixed into the frying process. 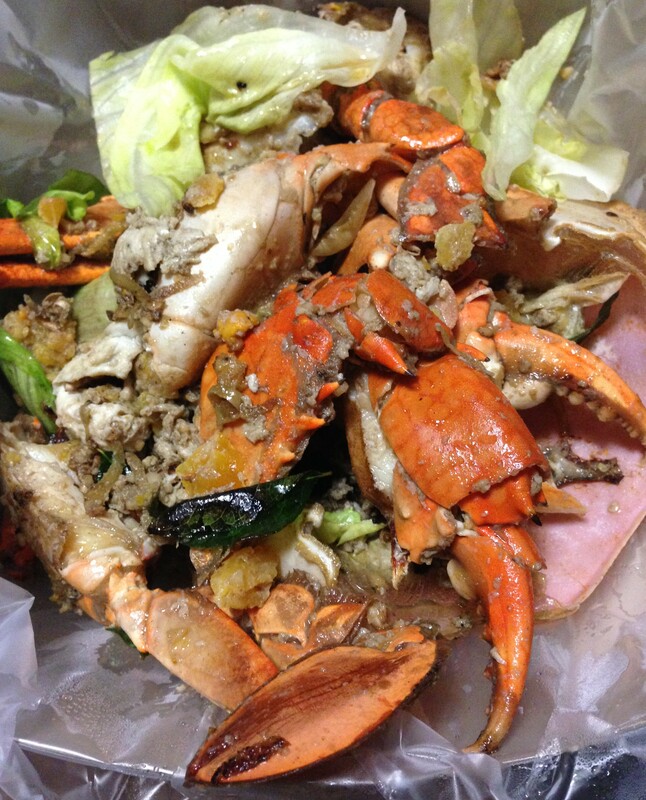 From the picture below you really can’t see the Salted Egg, you would think it’s normal scallion and ginger crab. Nothing to write home about, stick with the chili crab. 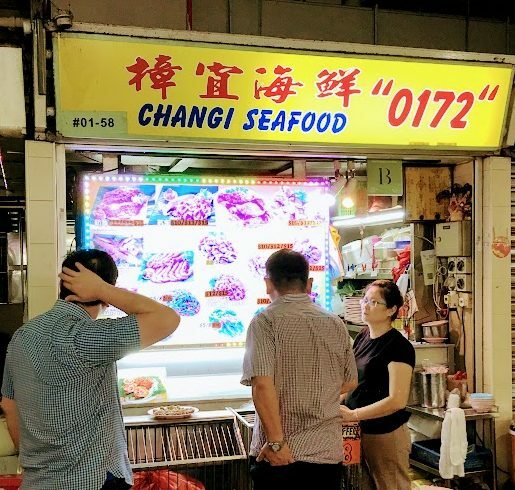 Another stall which has been here for awhile is Changi Seafood. It’s located at the same row as Mattar Road (58, middle left). It is not a bad alternative to Mattar Road. One of the newer kids on the block, BJ Seafood (118, middle right) (They have now shifted to 101, middle left, with a new sign) also has some good seafood. Here is the old sign. 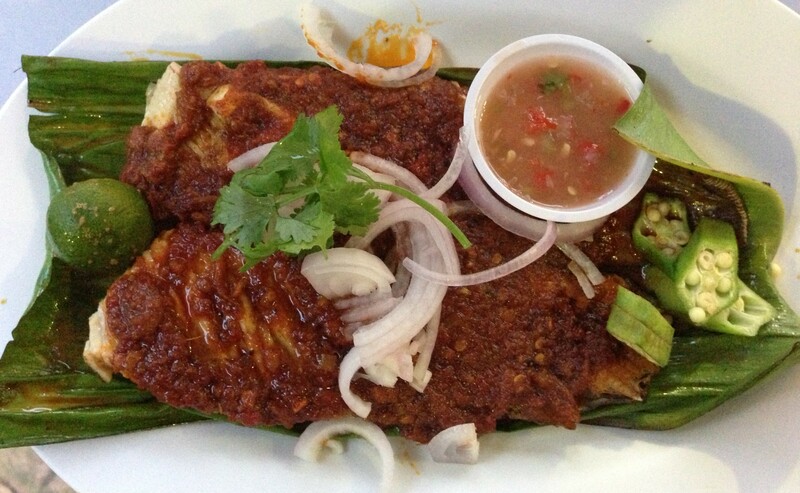 And here is the new: The Sambal Stingray is pretty good. The price is right, and the sambal is actually a little sweeter than spicy. A nice bit of eating here. 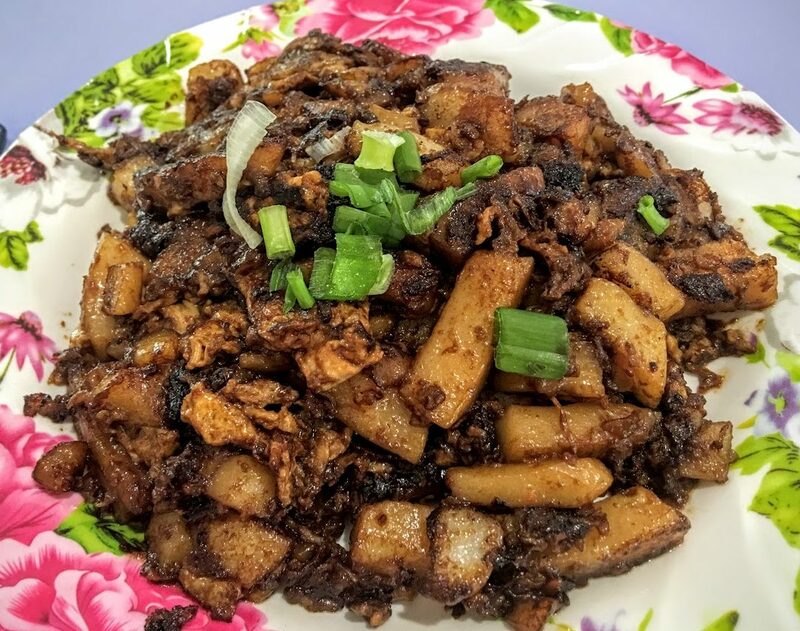 Other Tze Char style places include dishes with rice and other items. These include Khee Hong(67, middle left) and Hong Yun (61, middle left). 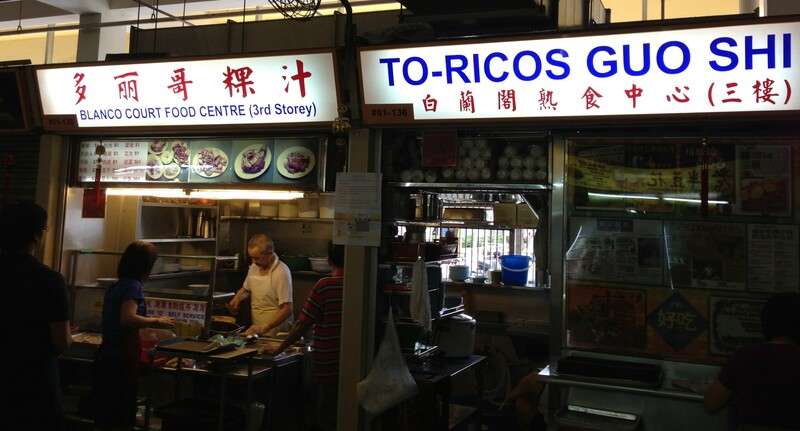 Both of these stalls will give you Fried Rice, Tze Char dishes that do well. 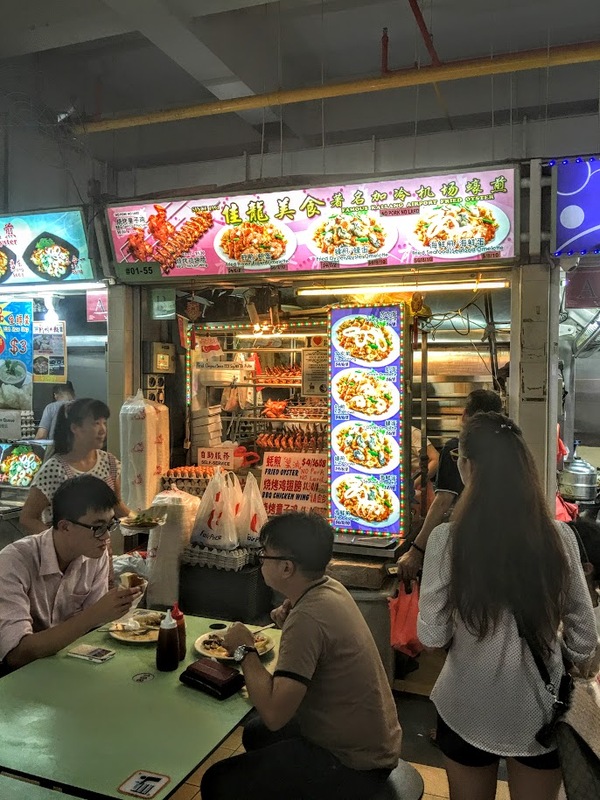 With every hawker centre/coffee shop you will almost always find Economic Rice or Cai Png. Here it’s no different. 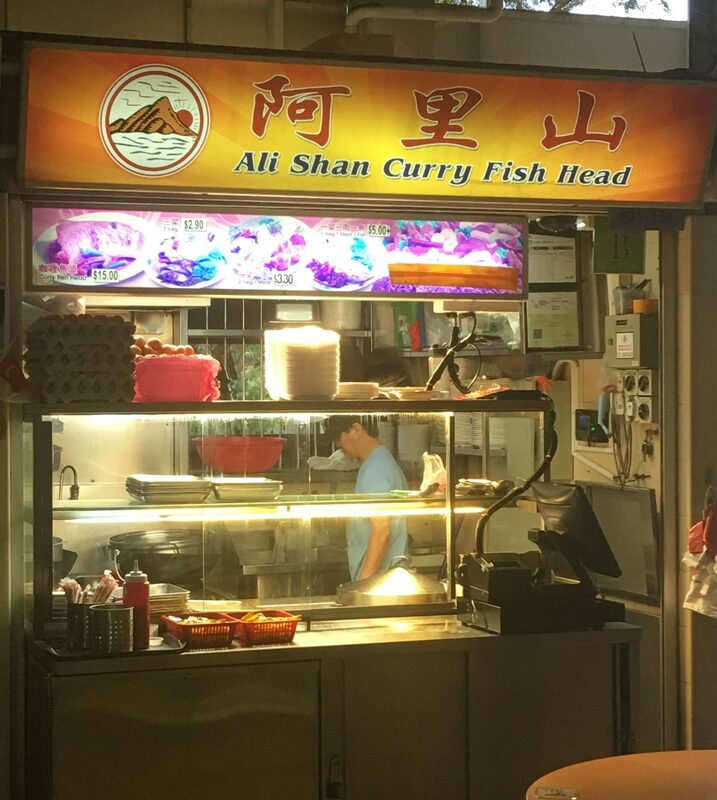 Ali Shan Curry Fish Head (154, right), though named this way, is actually a Cai Png stall. 2 Veg and 1 Meat, 2 Meat and 1 Veg, etc. Check out the 2 Veg and 1 Meat. 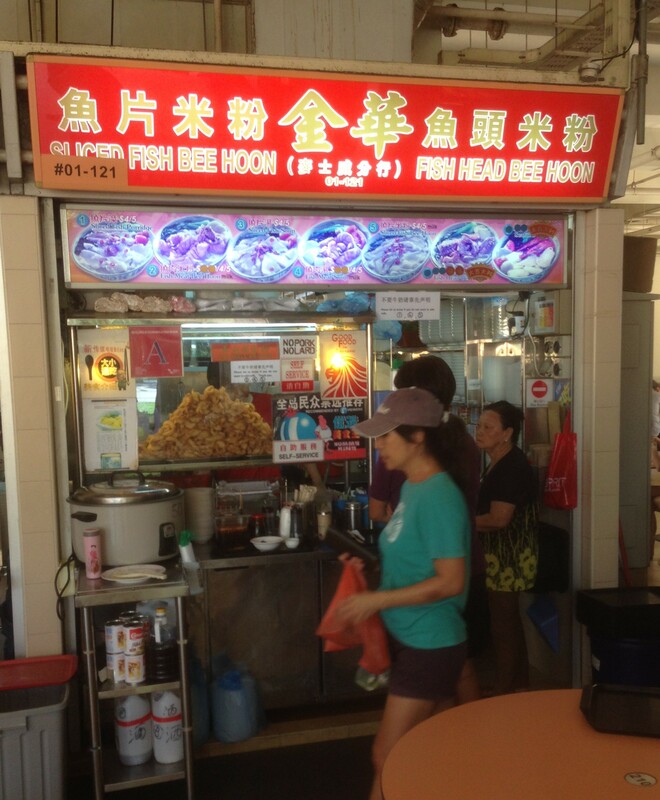 Then you also have your economic bee hoon stalls in almost every centre. Guan Kee (66, middle left) and Curry Rice (64, middle left) are here. 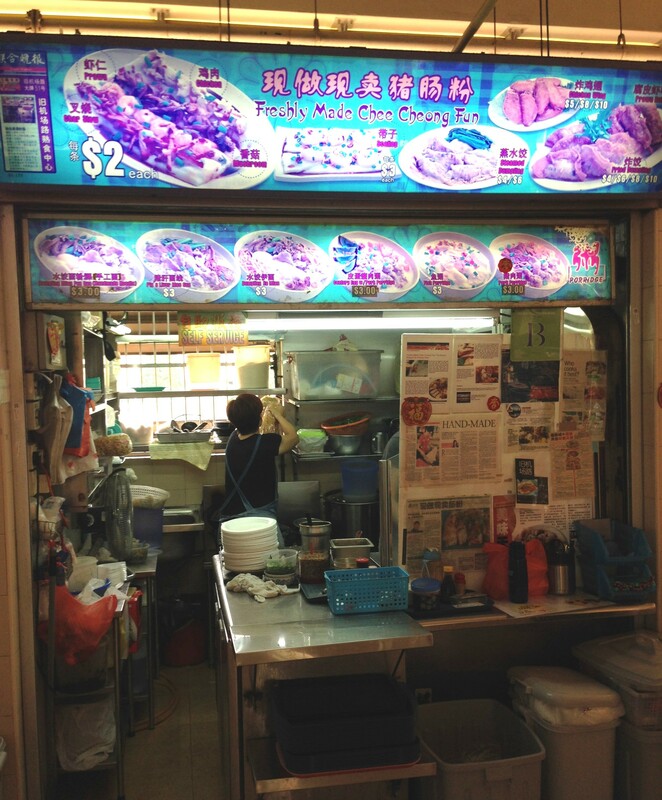 Usually open in the morning until early afternoon, it’s your typical economic bee hoon stall. “Who’s the best” debates arise from the Lor Mee stalls. The queues form at Xin Mei Xiang(116, middle right). This stall regularly draws people from everywhere and the queues start to form early. 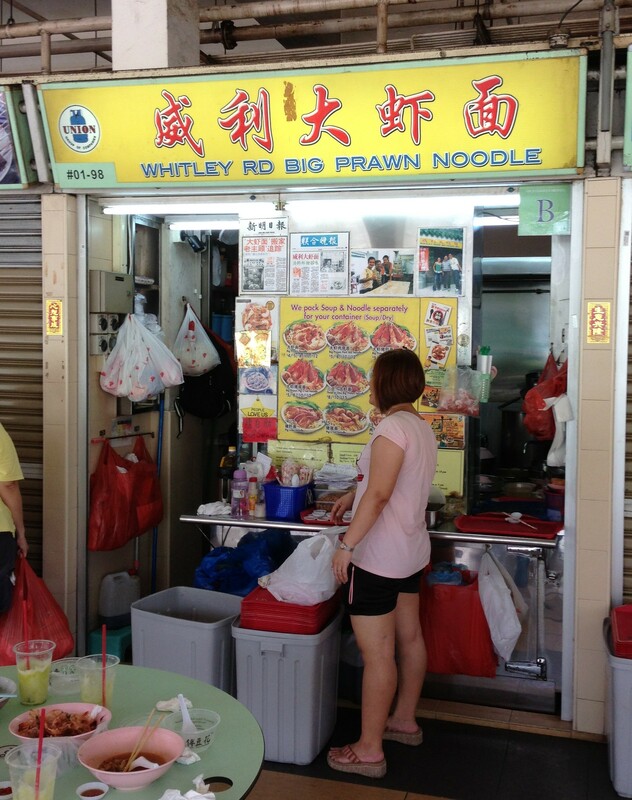 They used to sell prawn noodles, but why bother? People come from the Lor Mee. The queue takes about 20 minutes usually, but it’s run pretty efficiently (or you can go at 6 or 7am and there is no queue). One auntie comes out and takes your preliminary order, which gets the preparer ready with the noodles, etc. And when you get to the front of the line, you finalize with chili padi, garlic, vinegar, etc. The gravy is nice and thick, the shredded fish is quite well done. The meat inside is also nicely done. But for me, a little too much fish. Mix it all together and you understand why people queue. But for me, I like Xiang Ji (81, middle left). 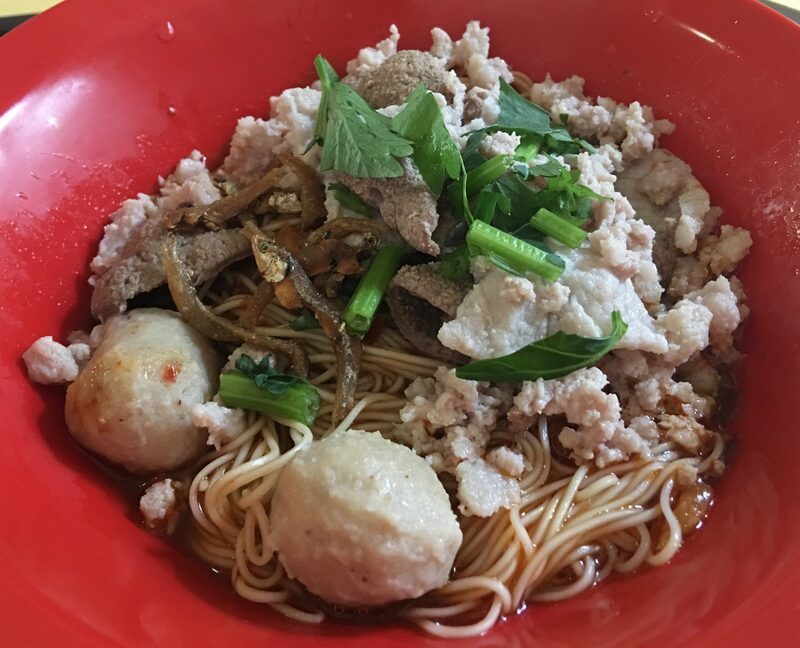 All Lor Mee looks the same, but the taste is different. This one is a little more tasty. I can’t quite describe it, but the ingredients I think are what makes it. The meat and less fish make it tastes much better. 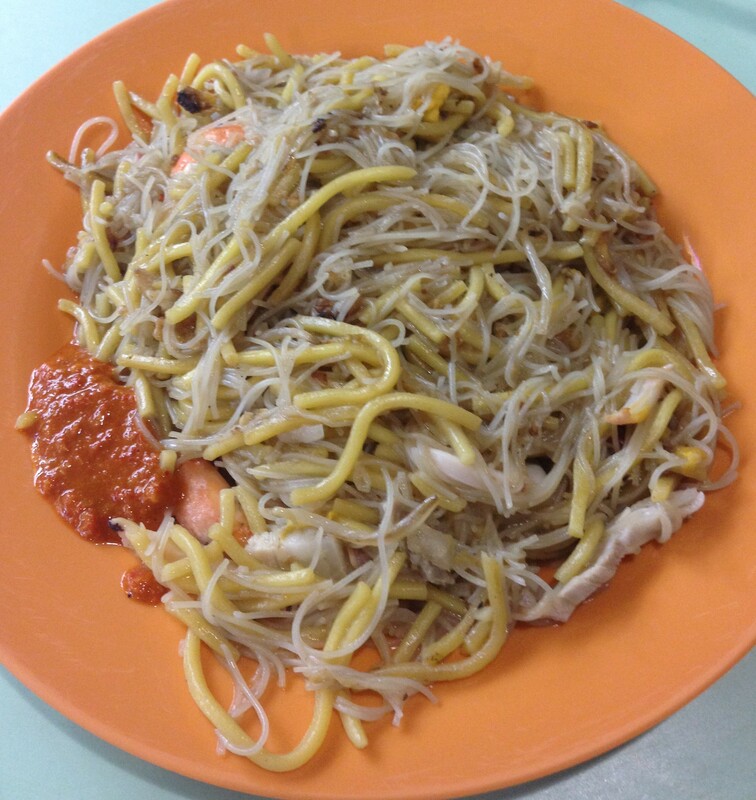 One key for me, I always go for the yellow noodles and bee hoon mix, not just one of them. 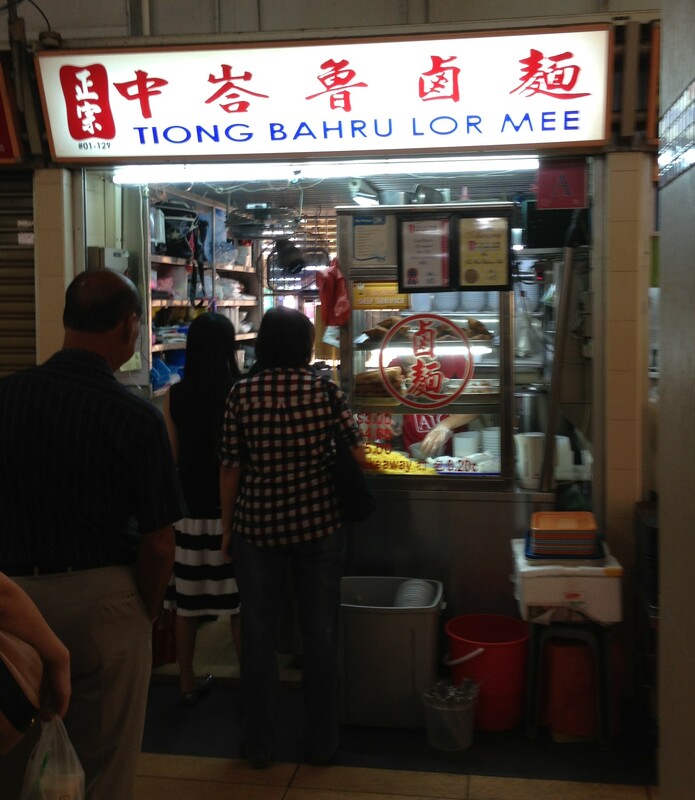 Another selection for Lor Mee is Tiong Bahru(129, middle right) (They have now shifted a few stalls down to 124). The queues form here as well. Here are the ingredients before adding the gravy. Notice that this one does not have as much fish as Xin Mei Xiang or Xiang Ji. But more Wu Xiang and Braised Pork Belly. Add the gravy and here you go! Here is a picture from February, 2016. Notice the chunks of fish! To me, it tastes much better now than it did before. 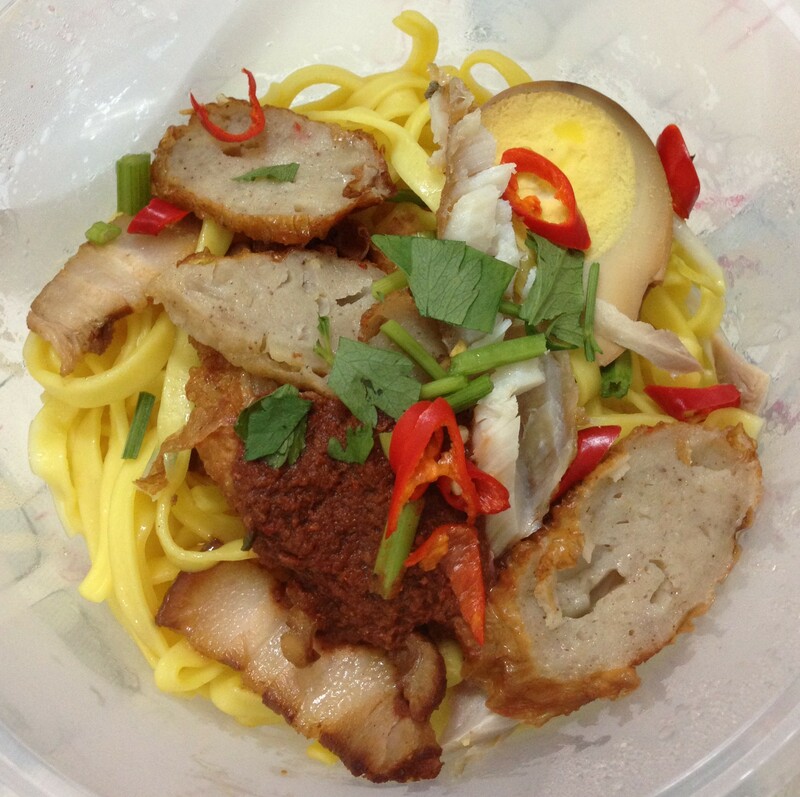 This Lor Mee, to me, lacks a little bit of a punch that the other two give. 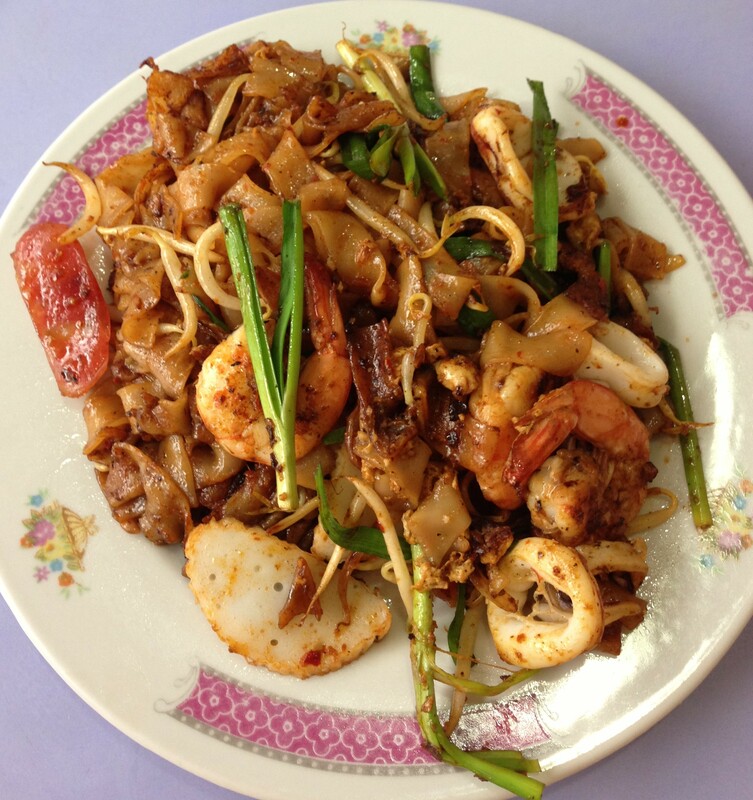 Another raging debate is regarding Char Kway Teow. Lao Fu Zhi(12, left) draws reviews and queues, and gets most of the attention. 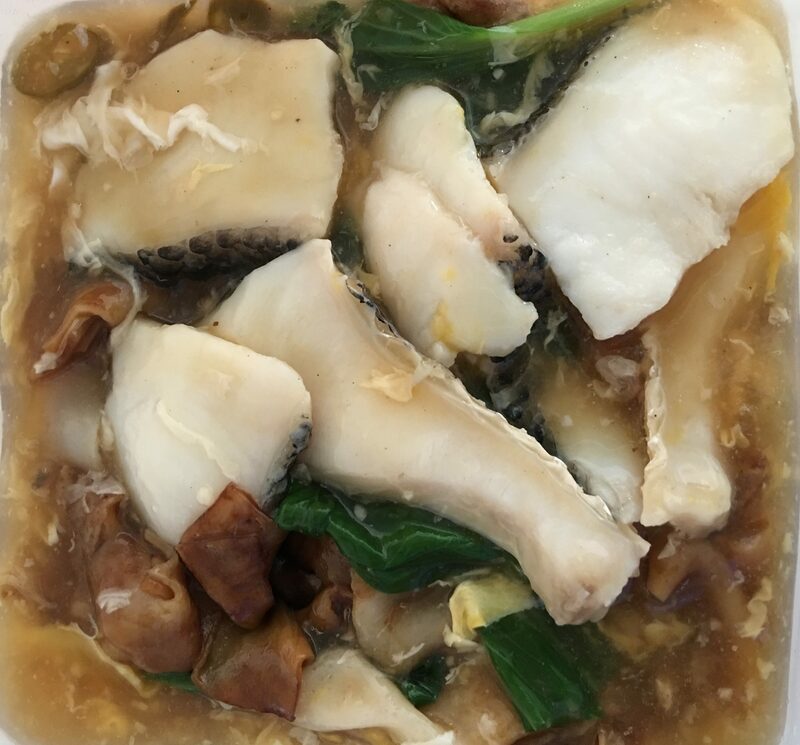 At Lao Fu Zhi, there is a difference in the way it is made, depending upon who is doing the cooking. If it’s the old uncle with the glasses that dances while he cooks, you have yourself a good plate. If it’s the old auntie that’s cooking, I don’t find it quite as good. Lao Fu Zhi offers quite a bit of ingredients and the taste is quite nice. A little oily, but not bad at all. But as I mentioned, I like it when the uncle cooks it. A lot of people also rave about Dong Ji (138, middle right). The uncle here cooks a little slowly, but the product is supposed to be worth it. Pretty good, but run of the mill as well. A good choice if you don’t feel like waiting in queue sometimes. Right along the lines of this is Carrot Cake. There is Black and White, me, I prefer the Black style. 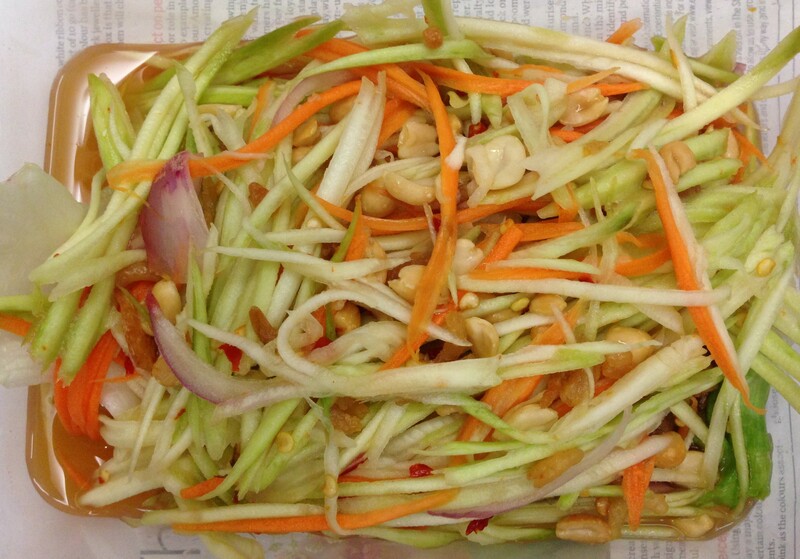 A little sweeter and more of that wok hei taste as it’s put together. I urge you to try both and see. Sheng De Kung Fu (100, middle left) has been around awhile. It make good quality Carrot Cake, both versions. I don’t know about the Oysters though. They are usually open only at night. Their Black Carrot Cake is moist and quite nice. 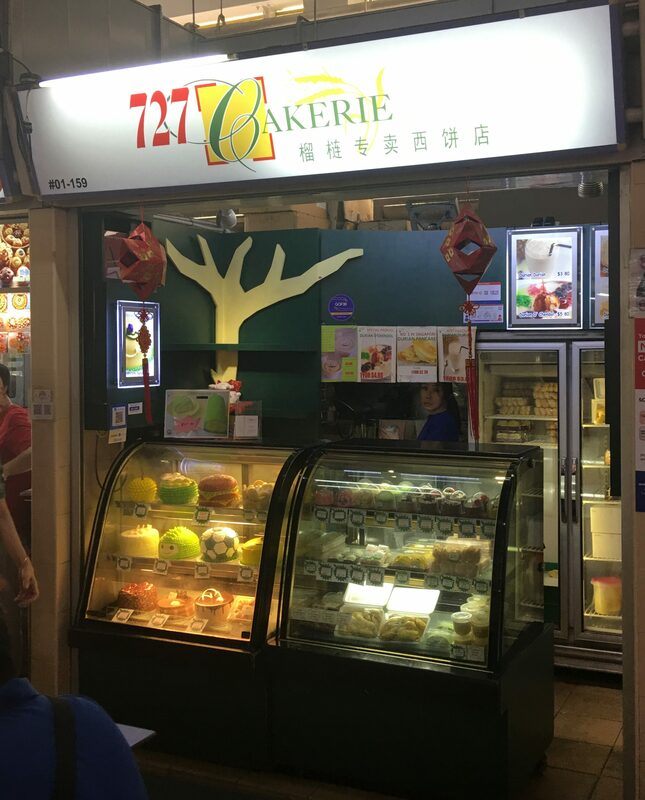 The simple store called 01-26 (26, left) offers a variety of items, but the Carrot Cake is definitely the most known. The aunty fries a HUGE plate of Carrot Cake for $3. The taste is right on. This is probably my favorite at Old Airport. 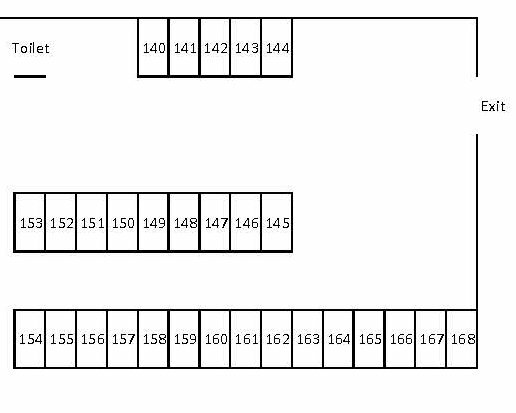 Another stall is located at 156. 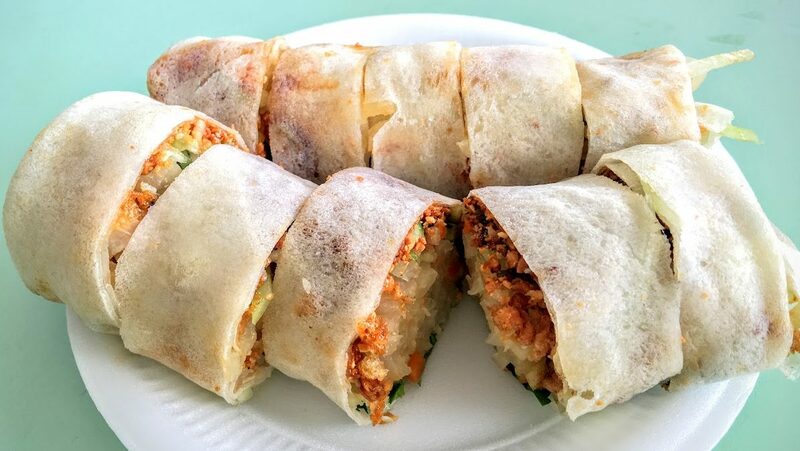 Not much for names, but they are known for Carrot Cake and Popiah. And aside from a nice Carrot Cake, the flower plates. Which makes their food distinguishable. 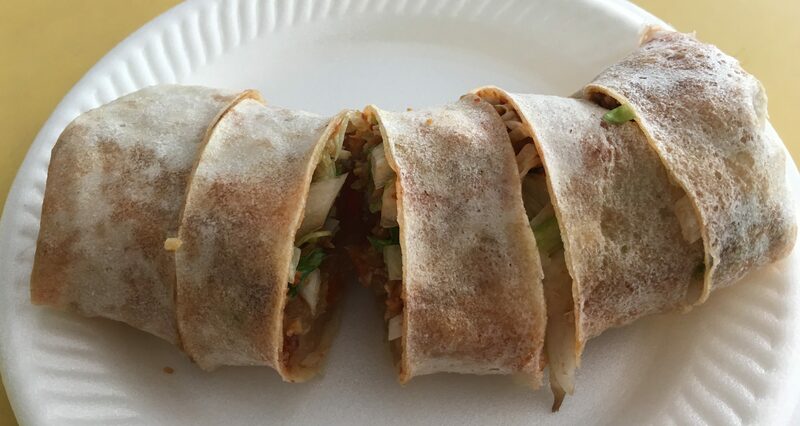 The Popiah is not half bad either. Fresh, with a nice kick of chili. 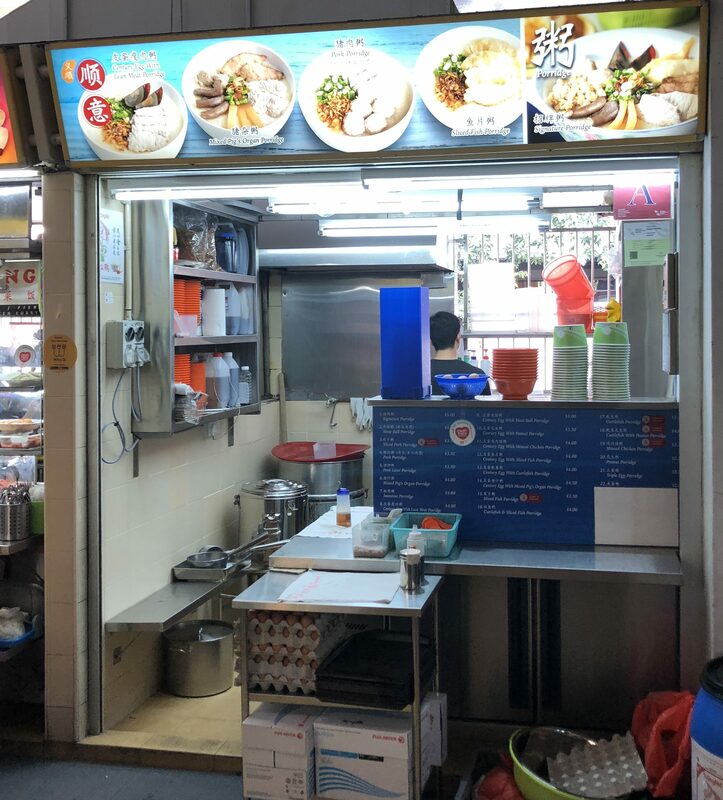 Another stall that gives you Popiah is one that is franchised around the city (94, middle left). This one is a little bigger and honestly, a little better tasting. 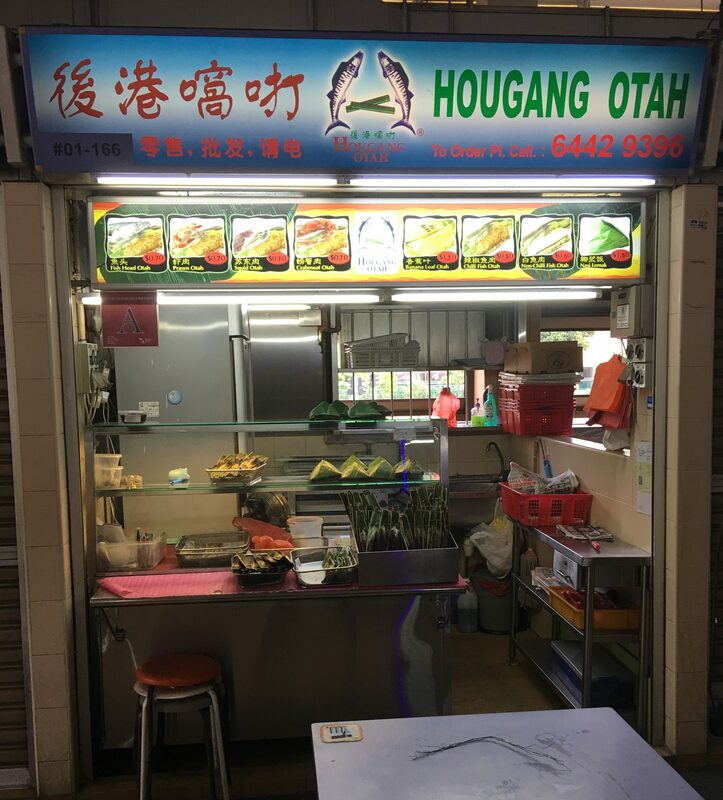 Just opened in October 2016, Hock Guan (93, middle left), it sits right next to the Popiah stall above. 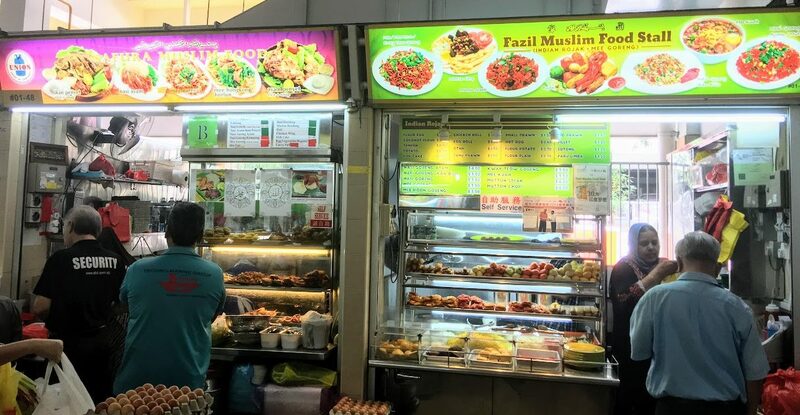 It also sells Rojak among other things. 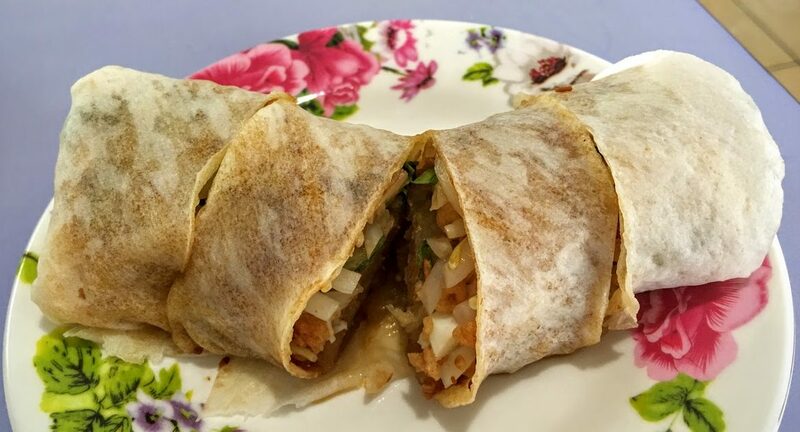 The Popiah is a little smaller than next door, the taste is there and the auntie that makes it is a nice old auntie. 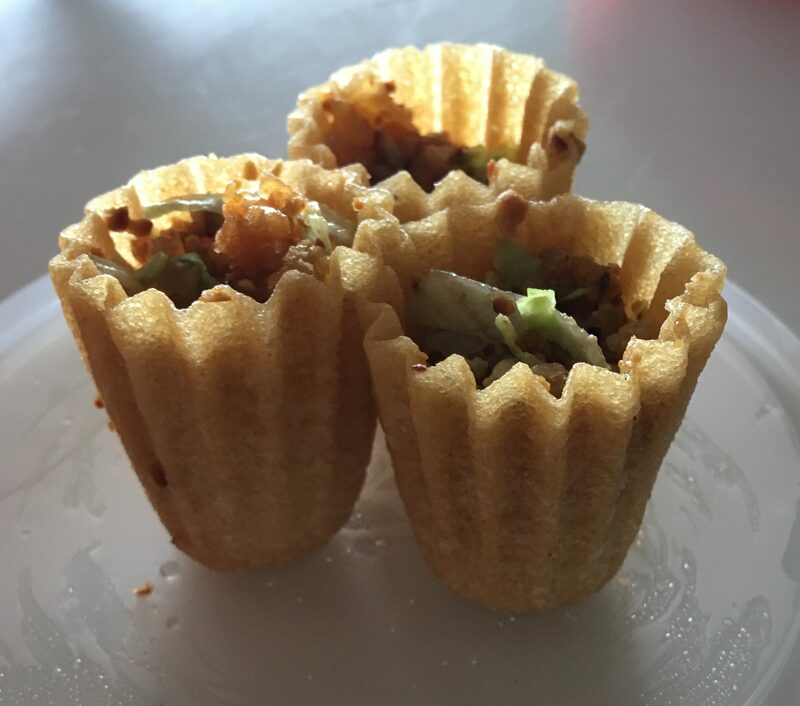 They also sell the Kueh Pie Tee. 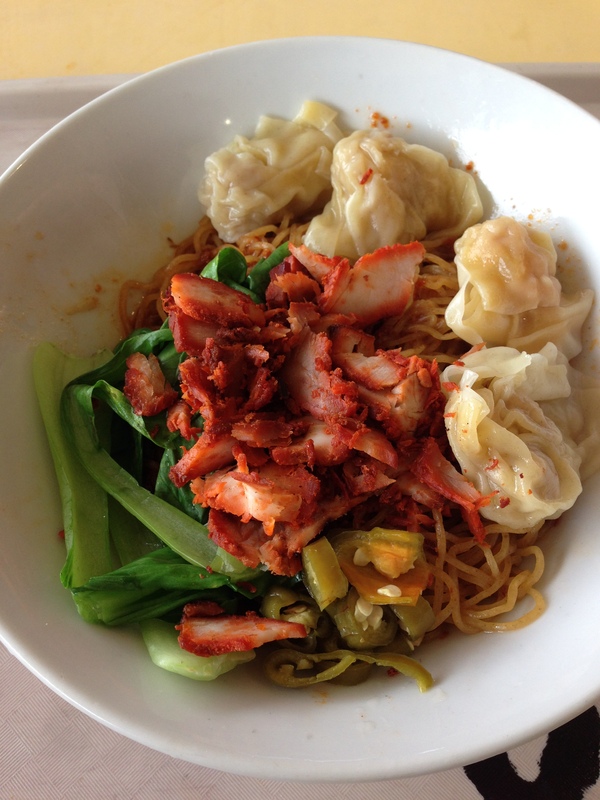 Let’s talk about Wanton Mee for awhile. 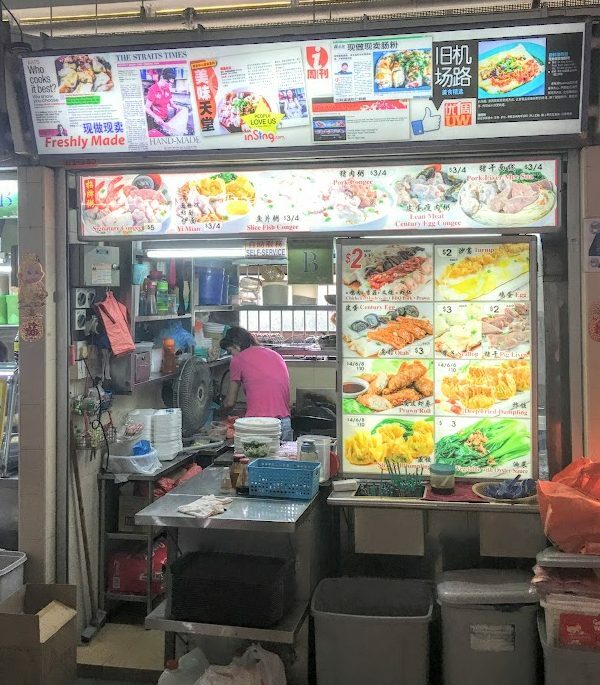 One stall separates the two famous stalls in this food centre. 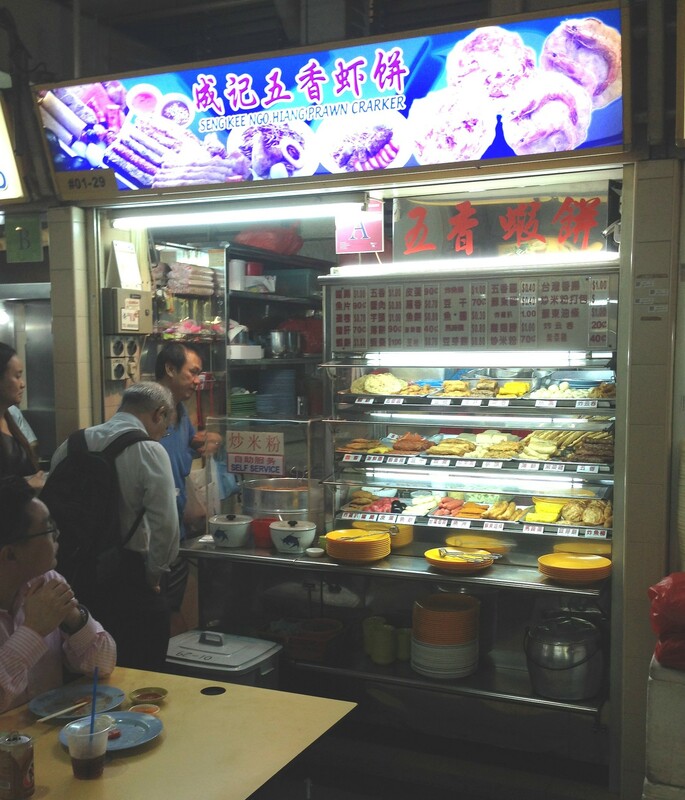 Hua Kee(2, left) and Cho Kee(4, left) Wanton Noodles separated by a drinks stall and each has its own supporters. 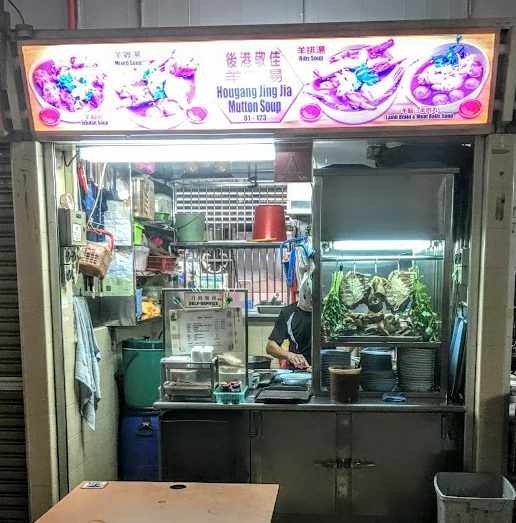 People joke that they don’t know what the names of the stalls are, just that there is a red/pink signboard and a blue one, so they go to either the red or blue stall. But, Cho Kee just changed their signage! No longer are they a blue signboard, but it is now beige. The red stall is Hua Kee. 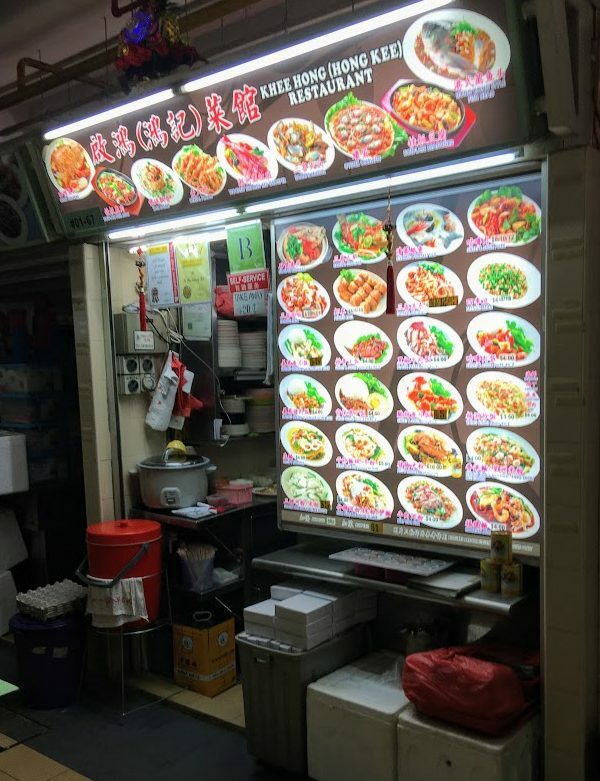 They are a little more old fashioned, as you queue, order and wait for your bowl of noodles. The blue stall is Cho Kee. This is their old stall, then it’s followed by their new one. Here, it’s the modern era. You get your receipt with your queue number. And then you watch the digital signboard for your number to flash on the screen. Let’s compare the noodles now. 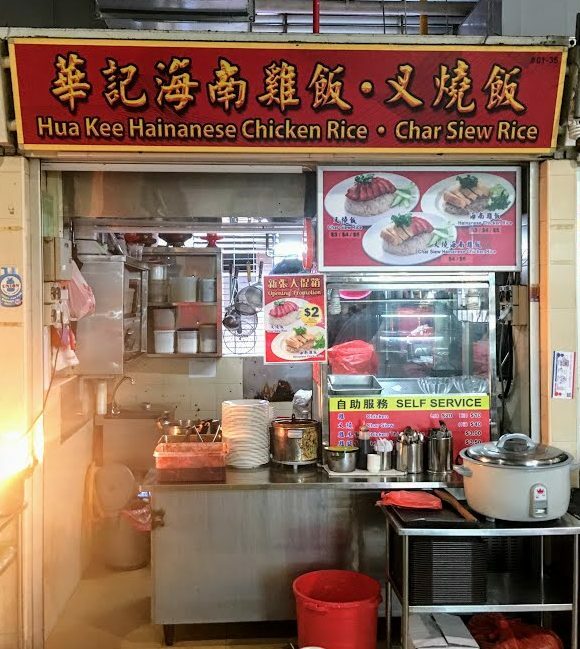 Here is Hua Kee, or the red stall. 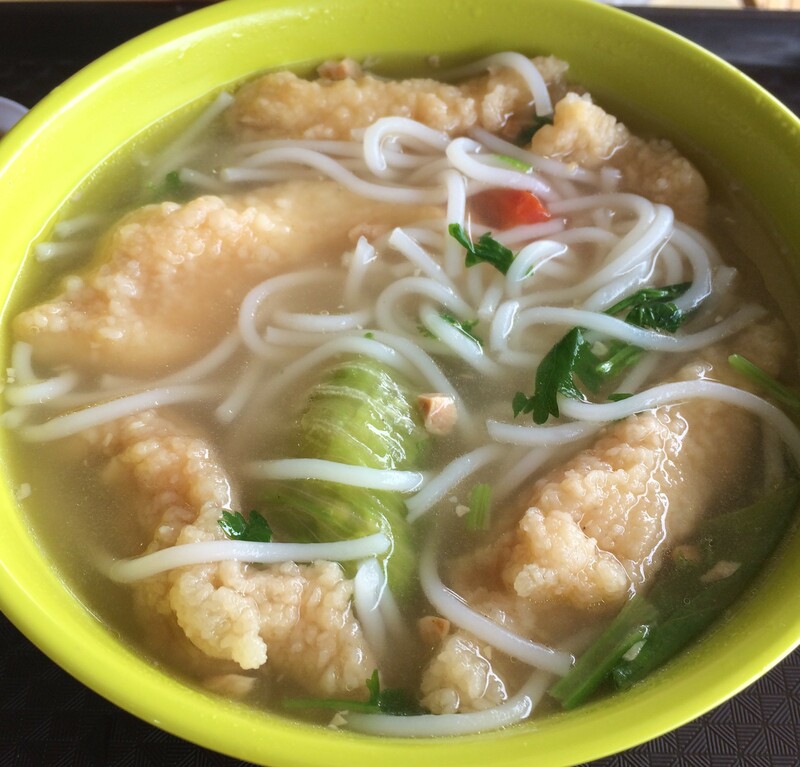 The noodle here is nice, but the story here is the wanton. They are nice and juicy, not a bad size. The Fried ones are also quite nice. 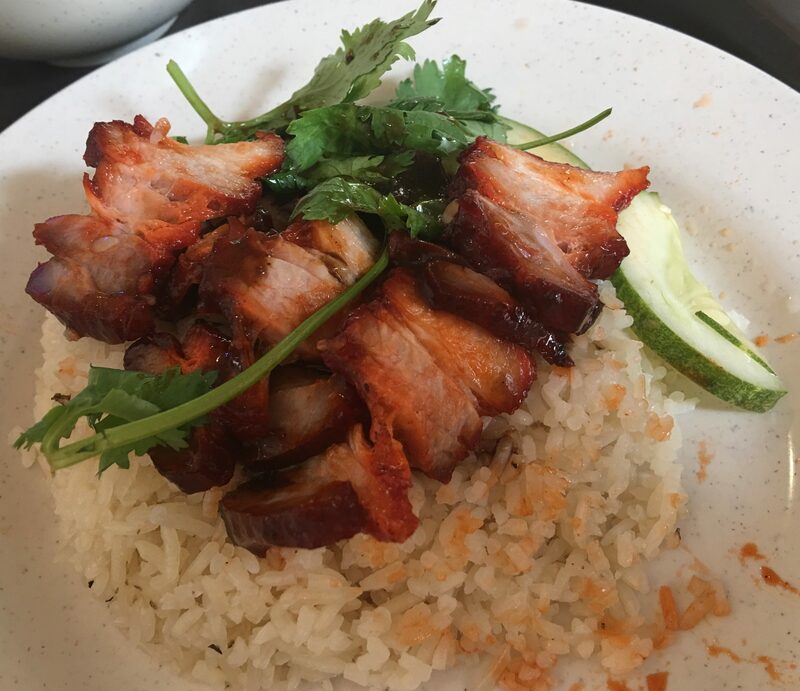 The Char Siew is a little lean and dry for me though. 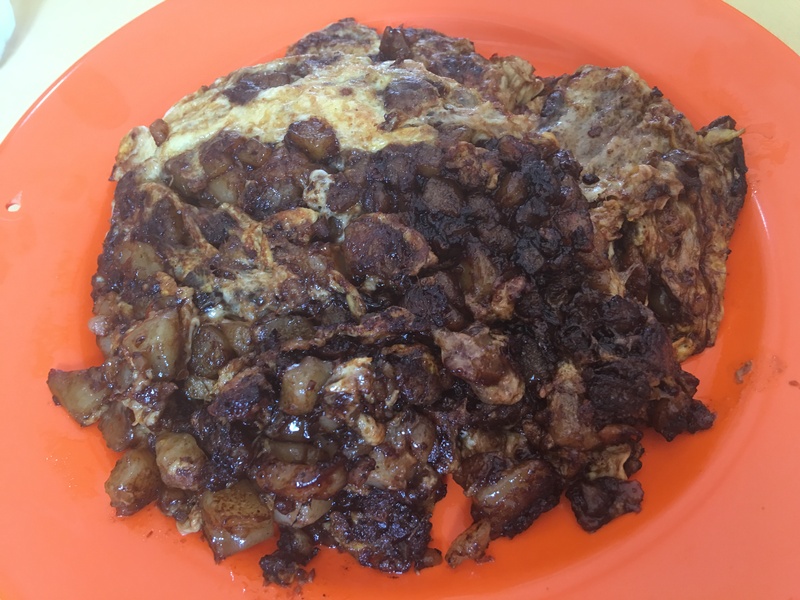 The Char Siew here, also lean and a little dry. More veggies here for sure. The wanton are not bad, a little juicy, I can’t complain. But the noodles are excellent! Springy, chewy and a great taste. It really makes the dish for me. 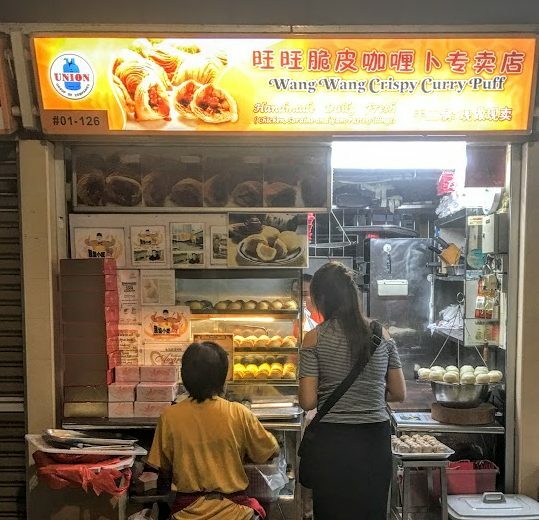 The Fried Wanton here are also nice. What a choice. For me, I usually go with Cho Kee, or the blue stall. I like the noodles more. 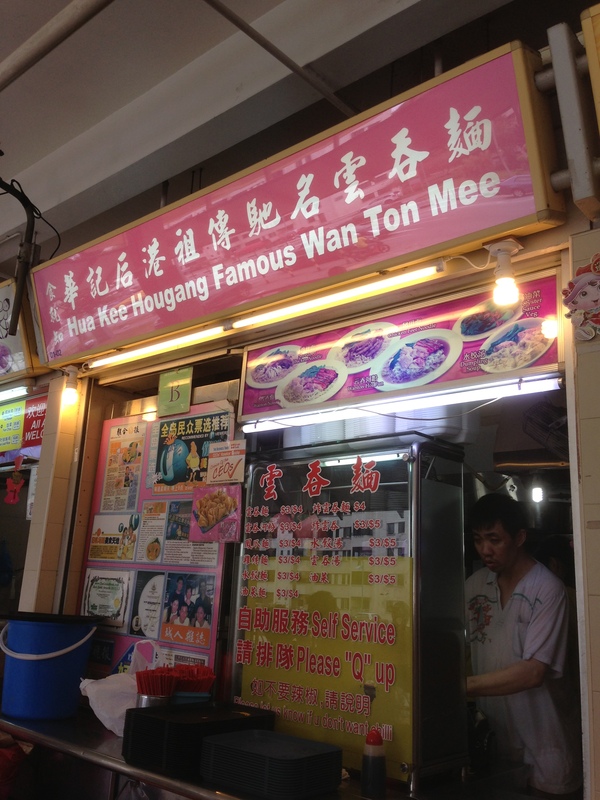 Another recently opened Wanton Mee stall is this plain non-descript one. 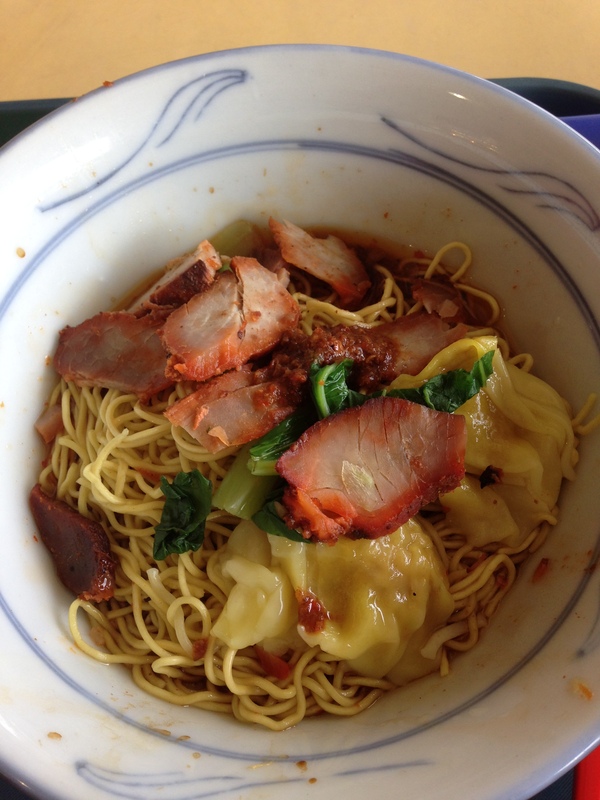 The small plate of Wonton Mee. Not a great bowl to be honest with you. They tried, but it’s not really quite there. Another new one is Hong Ji Mian Shi Jia (65, middle left). 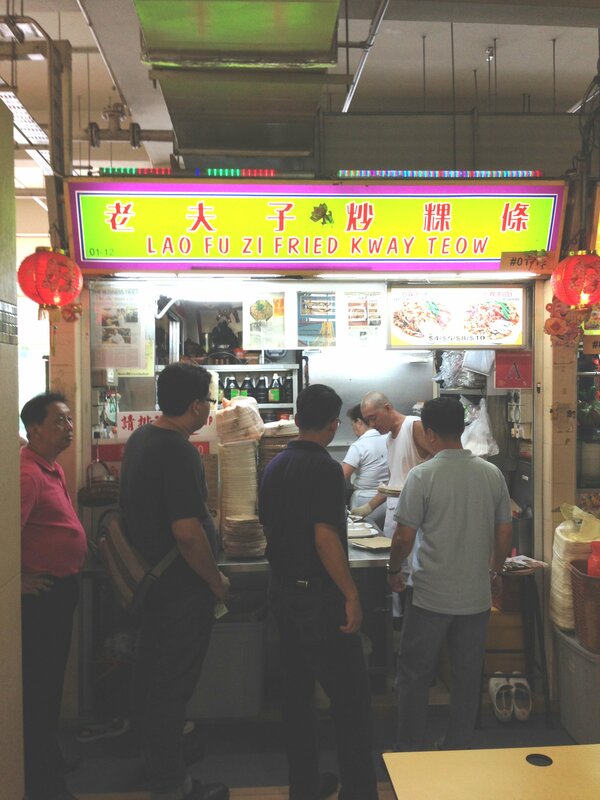 Except for the free flow lard, another average Wonton Mee. Do you want to know about more debates? 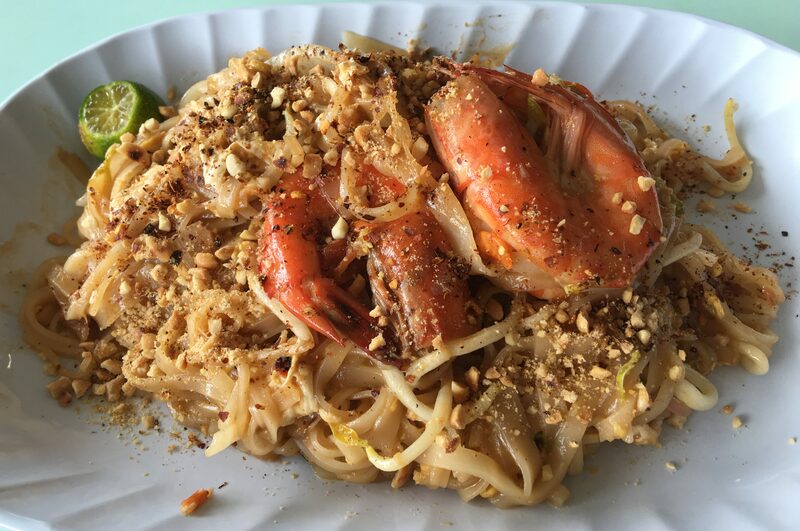 How about the one for Prawn Noodles? 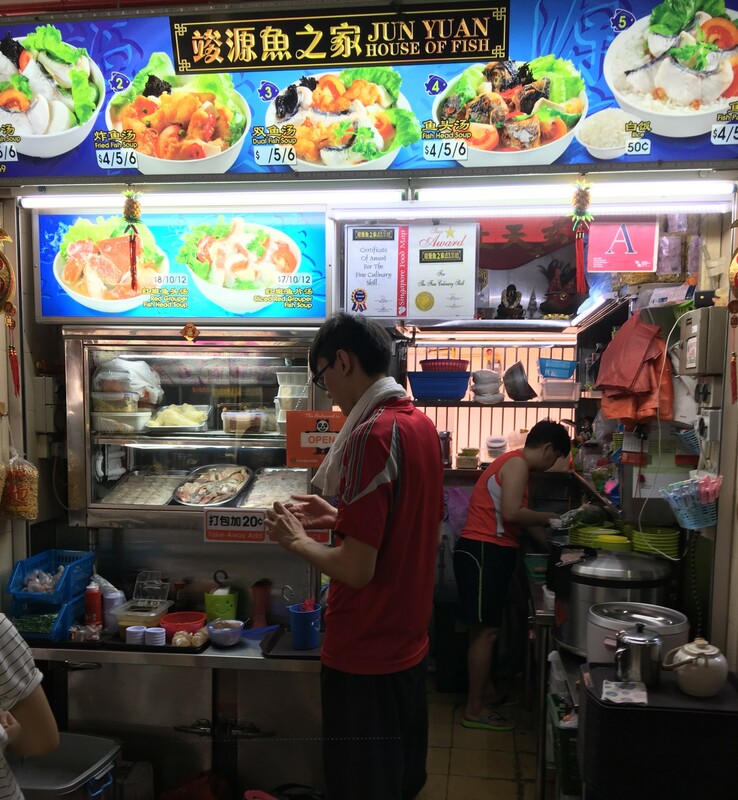 Albert Street(10, left) and Whitley Road(98, middle left) offer Big Prawn Mee and are just one section apart, with queues equally long. 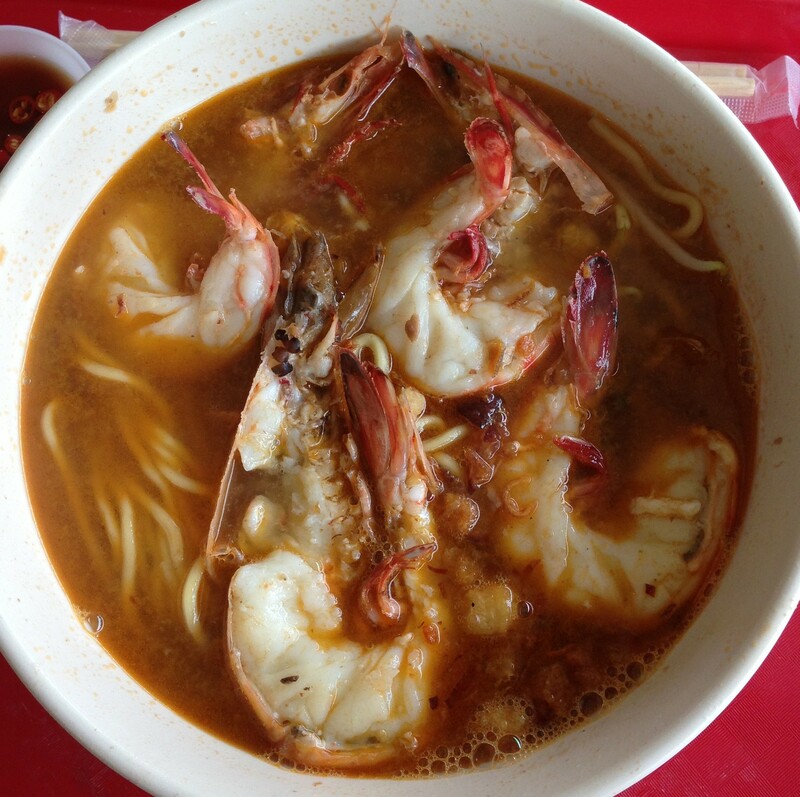 Now remember that Big Prawn Mee contains prawns which are larger than normal prawns. They are bigger and they are sweeter. The one I prefer is Albert Street, because I like the broth a little bit more, and I find the prawns much better. 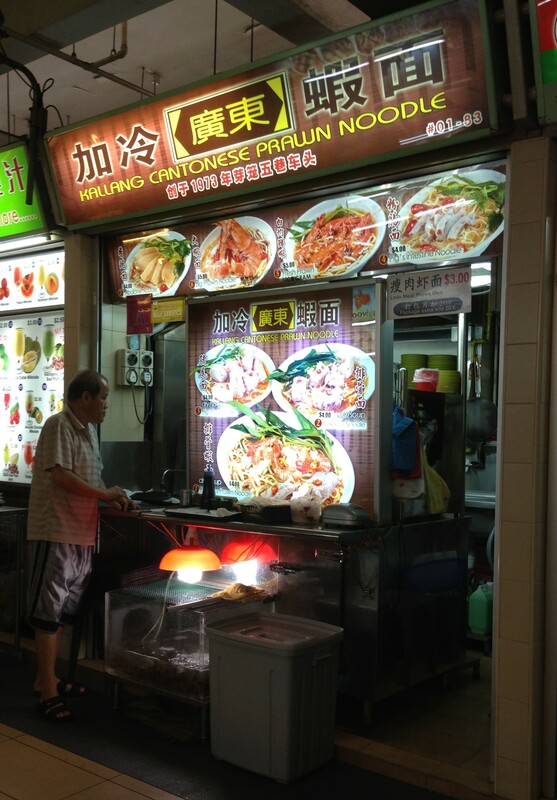 The Prawn Mee stalls always offer different combinations, like spare ribs or pig tail or regular prawn. 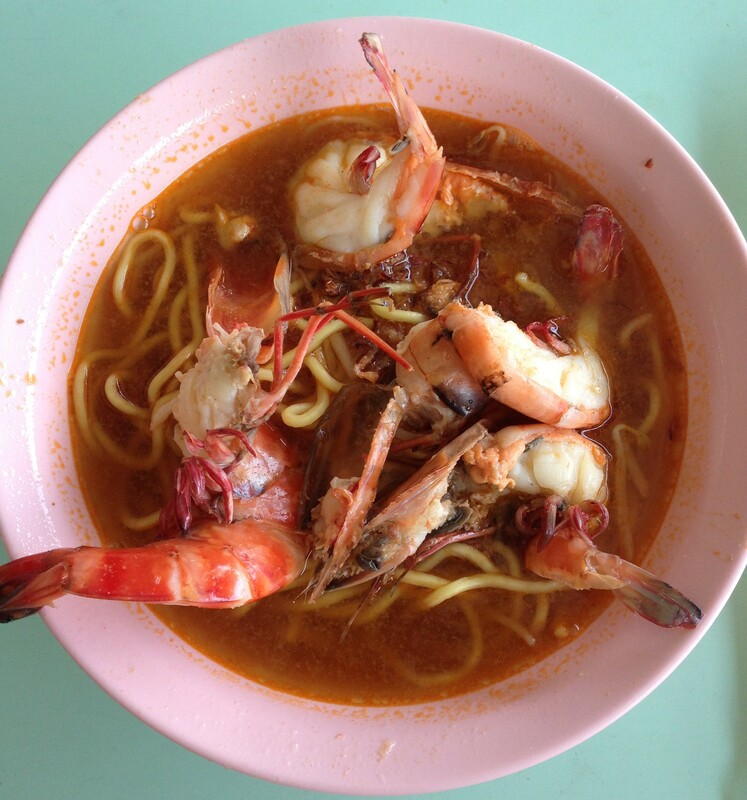 But I only go for Big Prawn Mee. 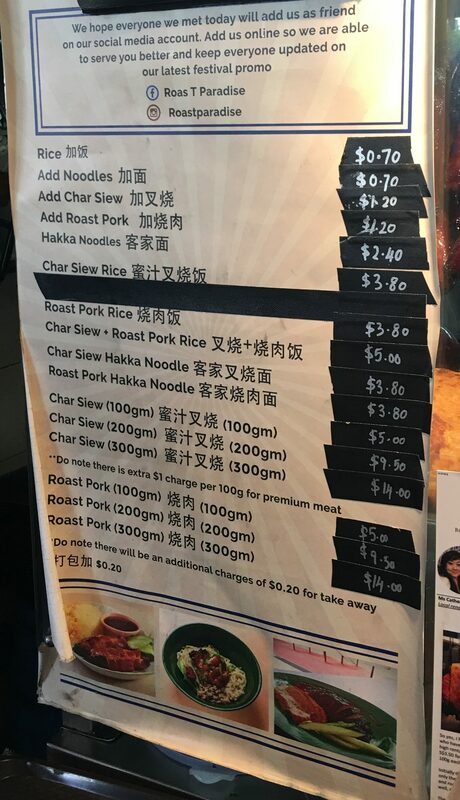 At $5, you expect a good bowl of noodles with nice prawns. To me, this has to be had as soup, not dry. To have it dry, it’s just not the same for me. As I mentioned, the broth here is so fragrant and the taste sticks with you. The noodles here, I recommend the Mee/Bee Hoon mix, spring nicely. The prawns are the star here though. Fresh, full of crunch, and delicious. Whitley Road also does a nice job. 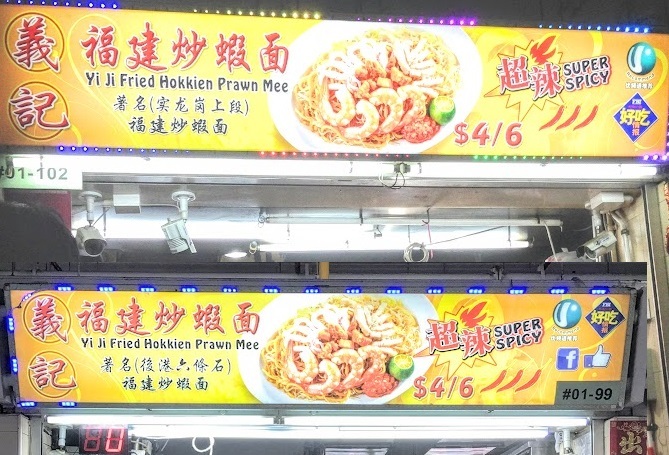 They offer the same items, but the difference is in the broth and prawns. 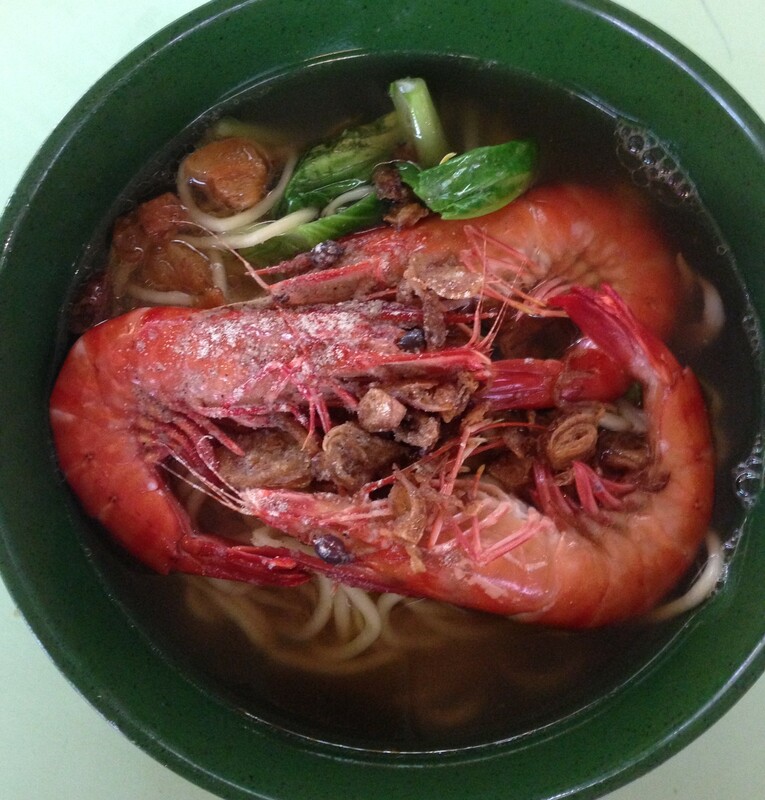 For the same $5, the prawns are not as big, and to me, the broth is not as fragrant. 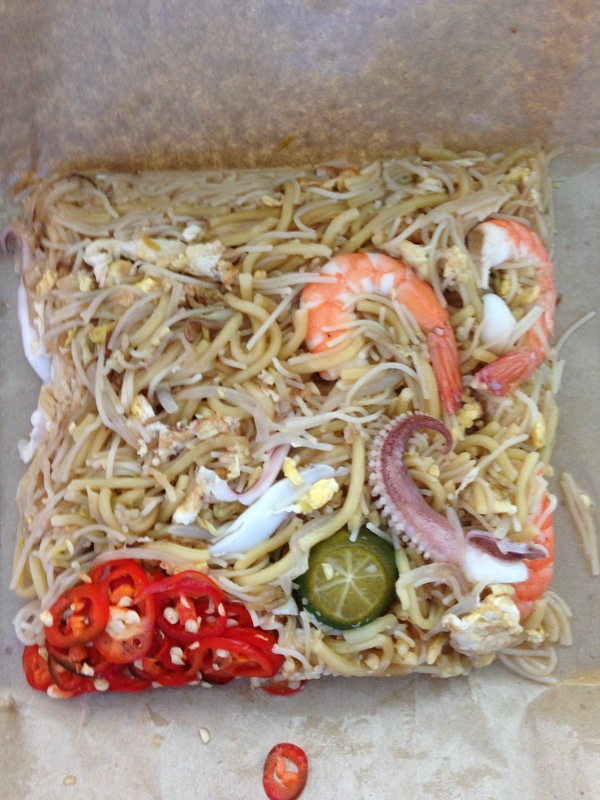 Another interesting choice is Kallang Cantonese Prawn Noodle (83, middle left). This stall has a tank containing live prawns. They will fish them out for you when you order. One big difference is that they do not cut the prawns. And they add vegetables. The broth is also different. It’s more mild and even. It is less salty than the other two stalls, and it’s a bit different. It is not an apples to apples comparison, but this is not a bad version at all. Worth a shot. Another stall that people come from all over to grab is when one feels like having spare parts. 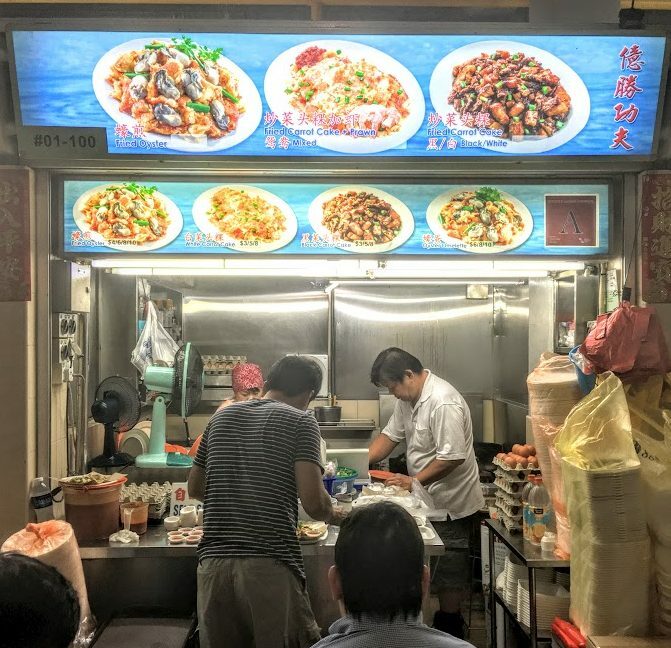 Blanco Court(135, middle ) is a place where people from all over the island come for Kway Chap. 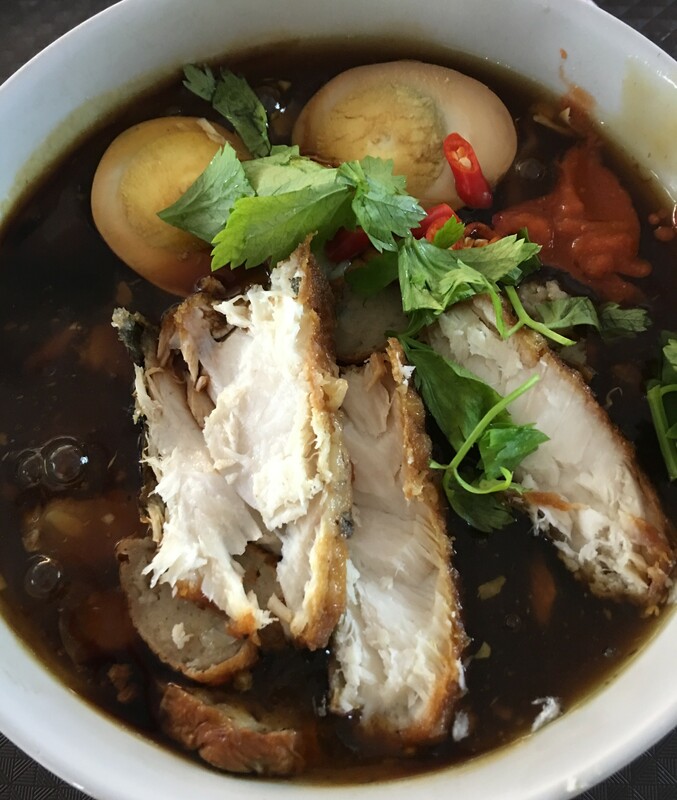 Intestines, Tofu, Pork Belly, Braised Eggs, you get it all in a sinfully rich broth and Kway Teow noodles. This stall stakes up two stall numbers and they do all the cooking right there. The queues start early, and they officially open for business at 11am. But if you get there early, and you’re lucky and nice to the auntie, you can preorder and have your stuff ready when they open. I’ll be honest, I don’t really eat most of the offerings in Kway Chap. In fact, it has a smell which I don’t quite enjoy, but I can tolerate. I will take the pork belly and the egg and tau bak, but other than that, it’s not for me. Yes, it’s usually on a plate and spread out, but this is the takeaway version put into our own bowl. You can customize, tell them what parts you want and what you don’t want. 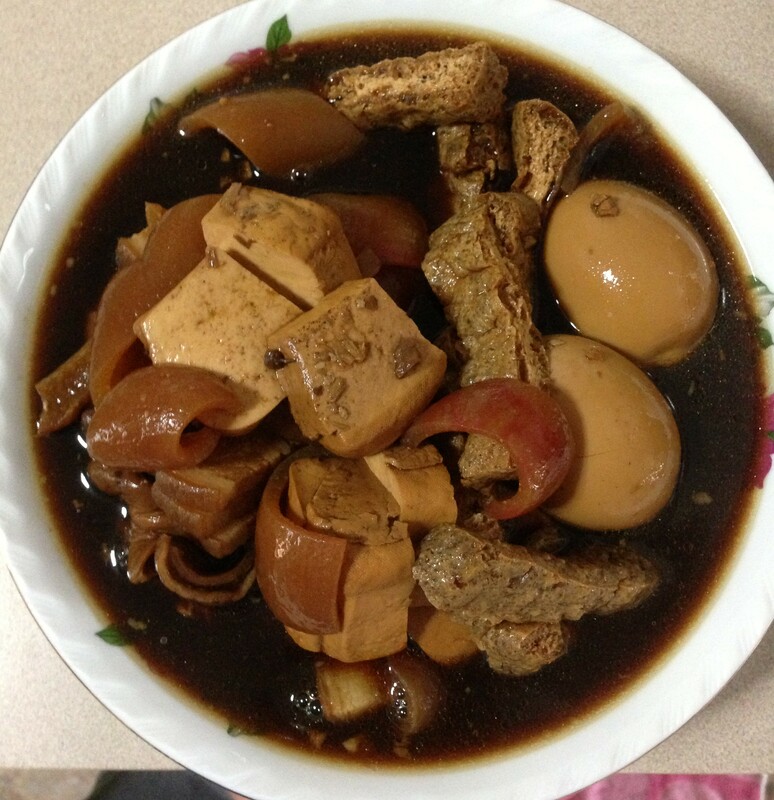 The taste is okay, my wife and sister-in-law say it’s the best Kway Chap out there. So I will trust them and recommend it to you. 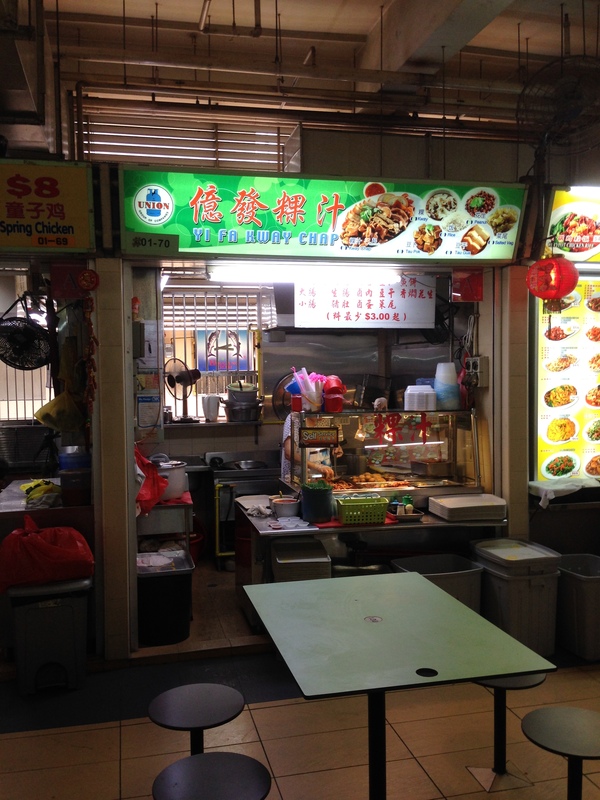 The other Kway Chap stall in the hawker centre is Yi Fa (70, middle left). It has a following as well, but you won’t see queues like at Blanco. Here are the options for you to choose from here. Looks good, but Lena says it’s pretty tasteless. Go for Blanco Court every time she says. 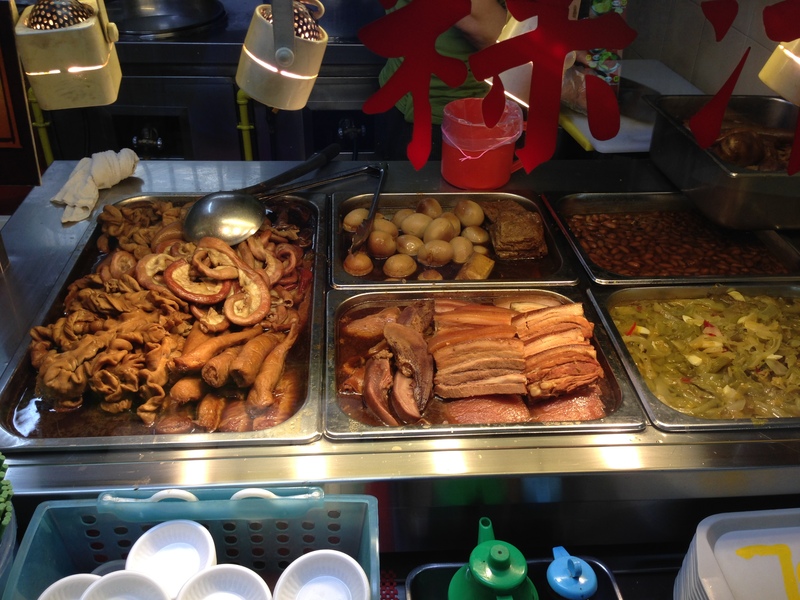 If you like intestines, you could try Xin Dong Fong (112, middle right). 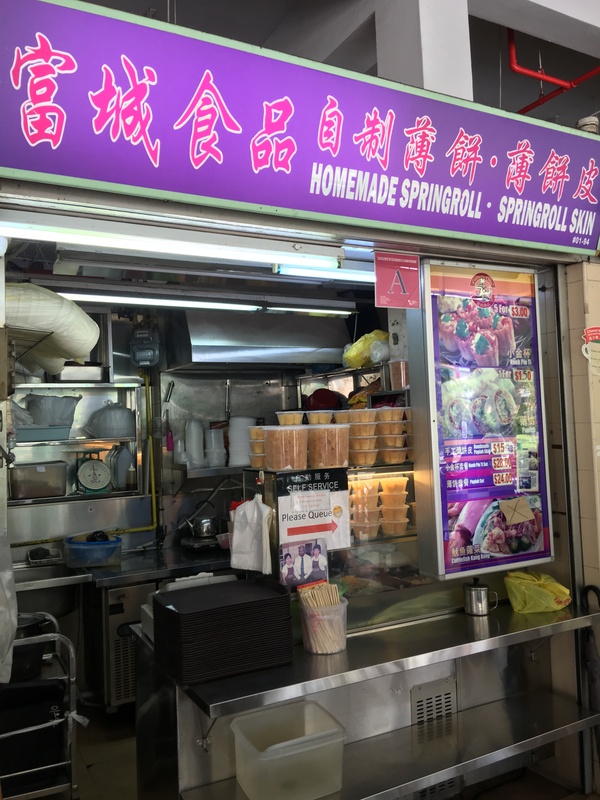 They specialize in two things, Fried Intestines and Ngoh Hiang, the Hokkien style spring roll. The Ngoh Hiang here is very big and a nice eat, while the Fried Intestines are also nicely done. 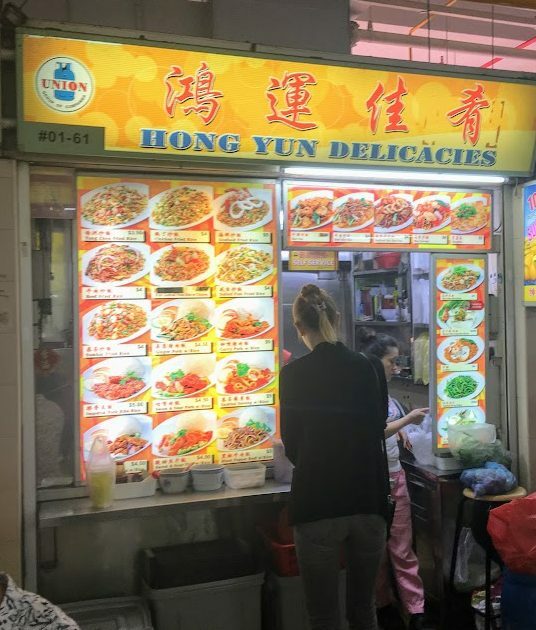 If you like Ngoh Hiang, you have to like it when there is a stall that specializes in Ngoh Hiang and all other lovely fried delicacies. There are now some more shops in Old Airport Road, as there used to be only one. Seng Kee (29, left) looks good when you approach and delivers when you get your food. This was the only stall around for a bit, but now there are more. It’s pretty simple here. Each piece costs a certain amount of money. You choose what you want, give it to them, and they will fry it up for you and give you a sweet and a chili sauce to dip your items in. Sounds great doesn’t it? Spring Rolls, Ngoh Hiang, Prawn Crackers, Tofu, Fish Cakes, etc., all fried up. You have to love it. Just be careful because it can be a lot of food, and the price will add up. You see here a lovely thin fish cake, some fried tofu, the reddish sausage, some prawn roll and of course, wu xiang, or ngoh hiang. 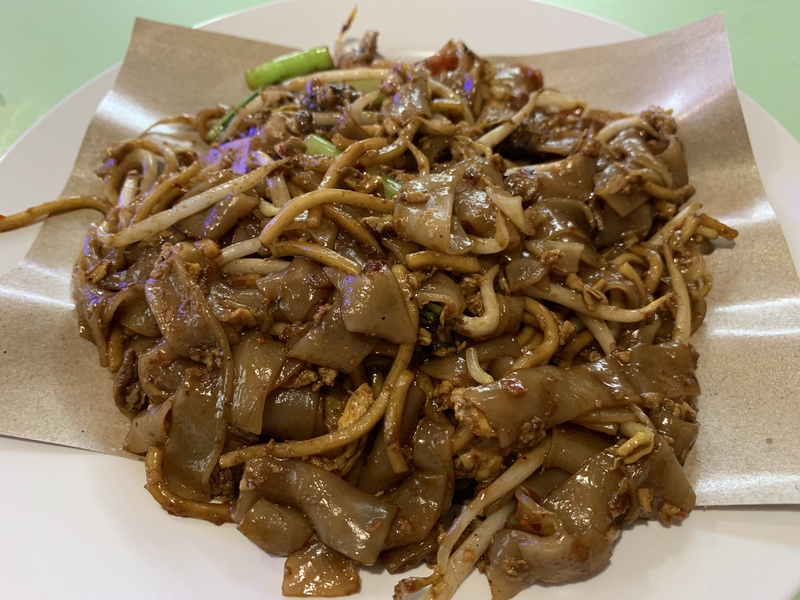 A lot of people eat it with some Fried Bee Hoon, but for me I don’t eat it that way. But they will offer it to you. You can give it a shot and see if it’s for you. There is also Wu Xiang Xia Bing (56, back middle left). I haven’t tried it yet, but I will at some point in time. 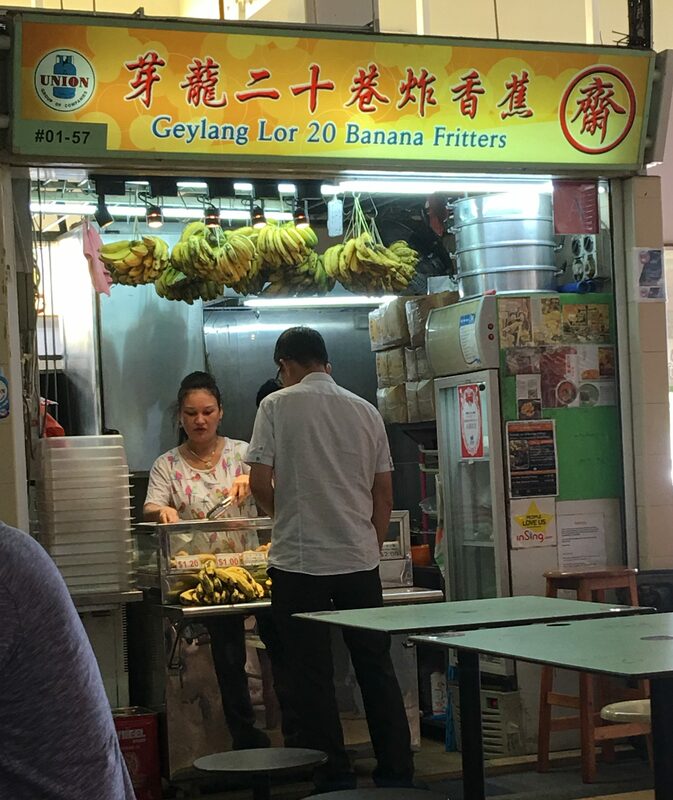 Speaking of Fried Items, there is always Goreng Pisang (57, mid left). And also Chi Shuang Shuang (129, mid right). Do you have a hankering for Indian Biryani? 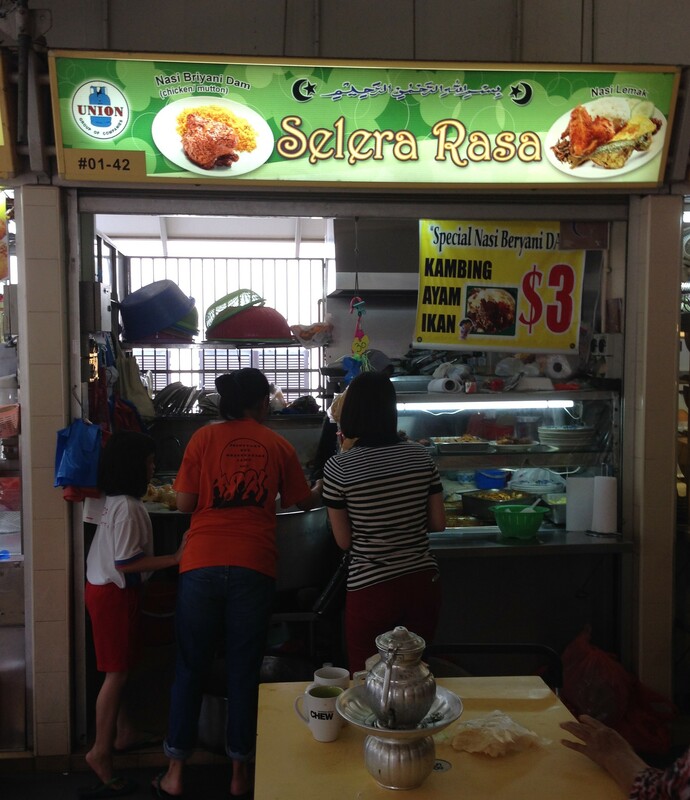 Try Selera Rasa (42, left), which makes a chicken and mutton biryani that tingles your tastebuds. They open in the morning, and soon after you can see everyone around clamoring to get the Biryani. You can get combinations, but basically it’s chicken, either in curry sauce or fried, or curried mutton. You can add a fish, or other things as well, but that’s only if you really, really want it. I don’t recommend it, I recommend getting the biryani and the chicken or mutton and savoring it. Here is the chicken curry biryani. 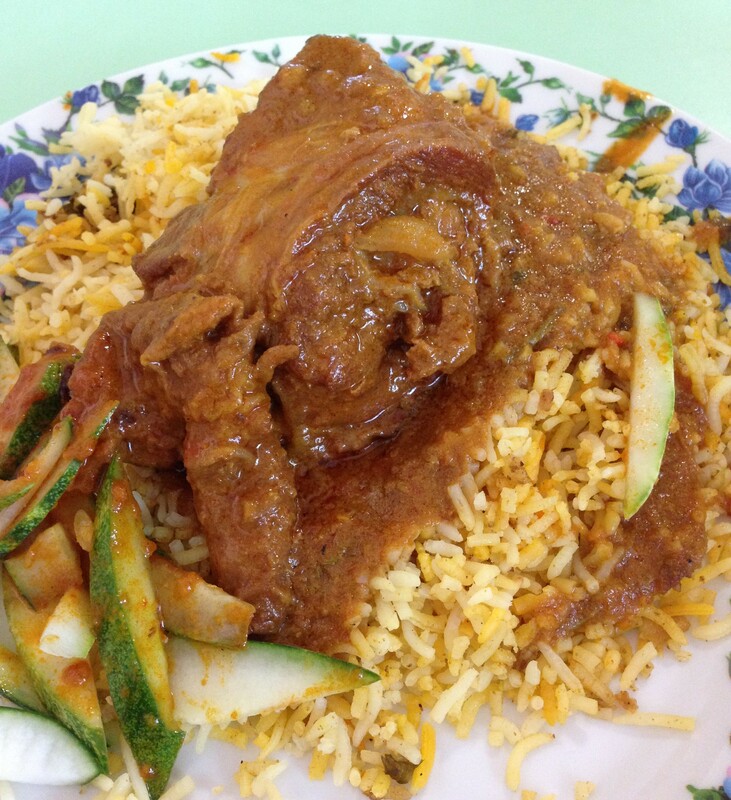 The curried meat sings and then mixed on the biryani rice make it a combination that’s out of this world. The chicken is very tender and the curry is so nice on the rice. To me, the curry makes half of the dish, so why go for the fried chicken instead of the curried chicken? Here is the mutton version. The mutton is a little drier than the chicken. Perhaps you just have to get the right piece. There aren’t many stalls at Old Airport that sell Indian food. 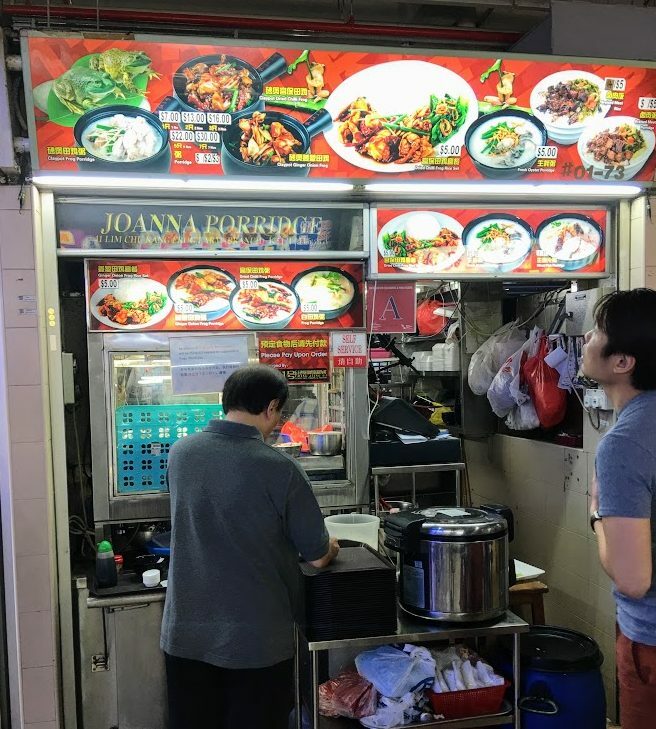 There used to be a stall that sold things like Bee Hoon Goreng and Prata, but not anymore. 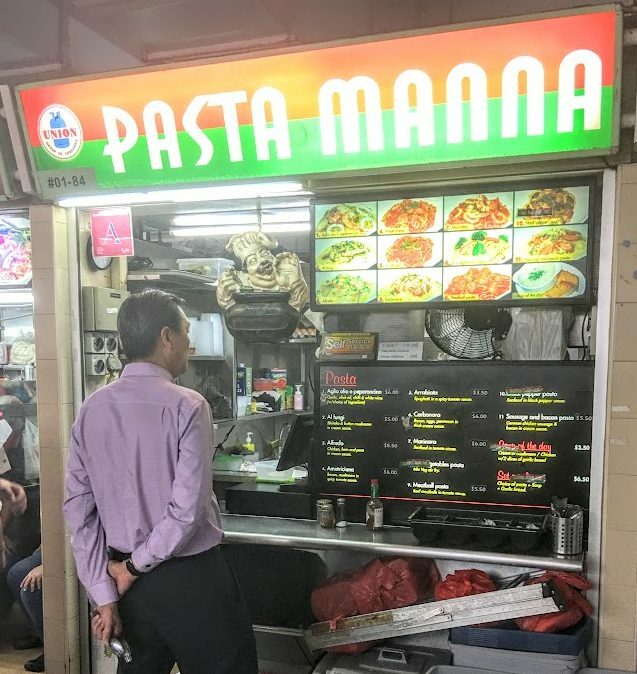 But if there is one thing that Old Airport needs, it’s a stall that sells Prata and Murtabak, etc. Another item which is Malay in origin is Otah. 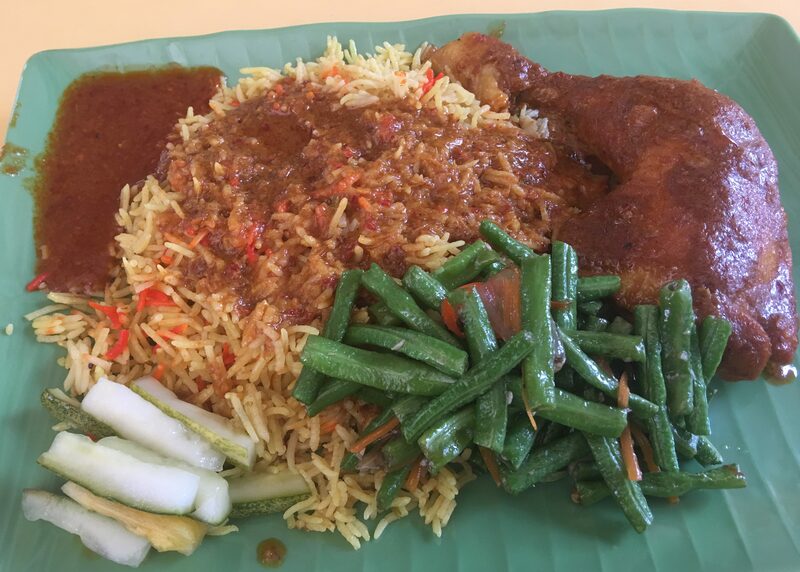 There are two stalls to get your Otah fix and also get a simple package of Nasi Lemak. 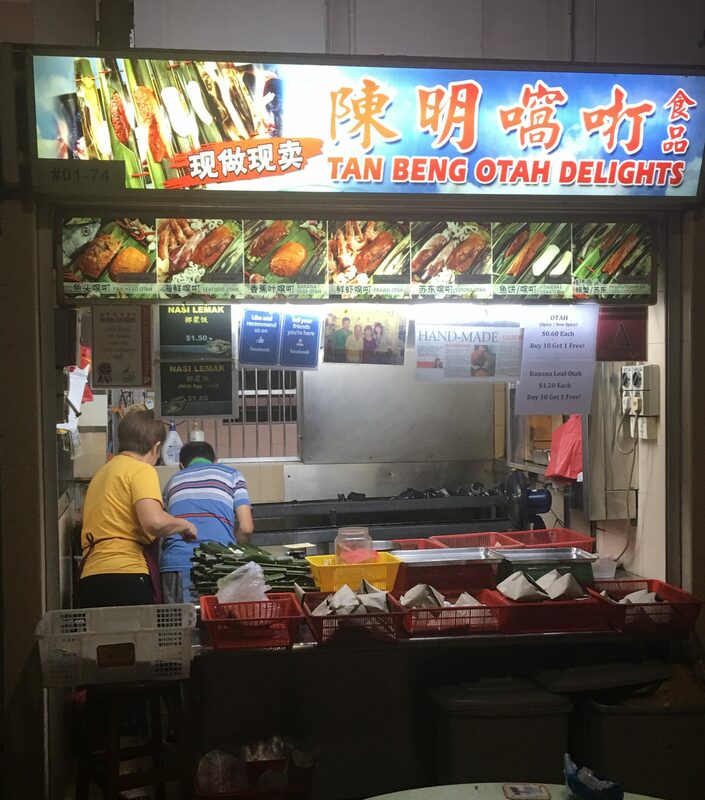 Tan Beng (74, middle left) seems to be open early and late to get your fix. 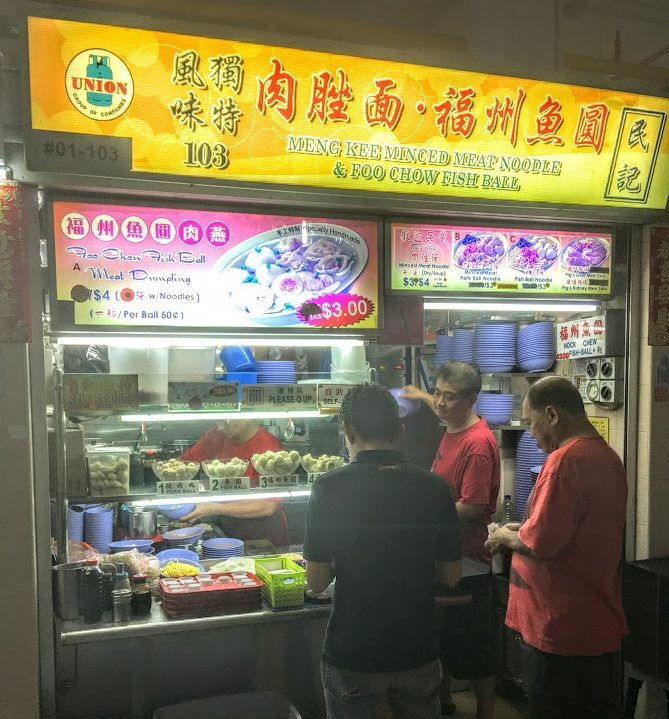 Then you also have Hougang Otah (166, far right), which is also open for many hours. 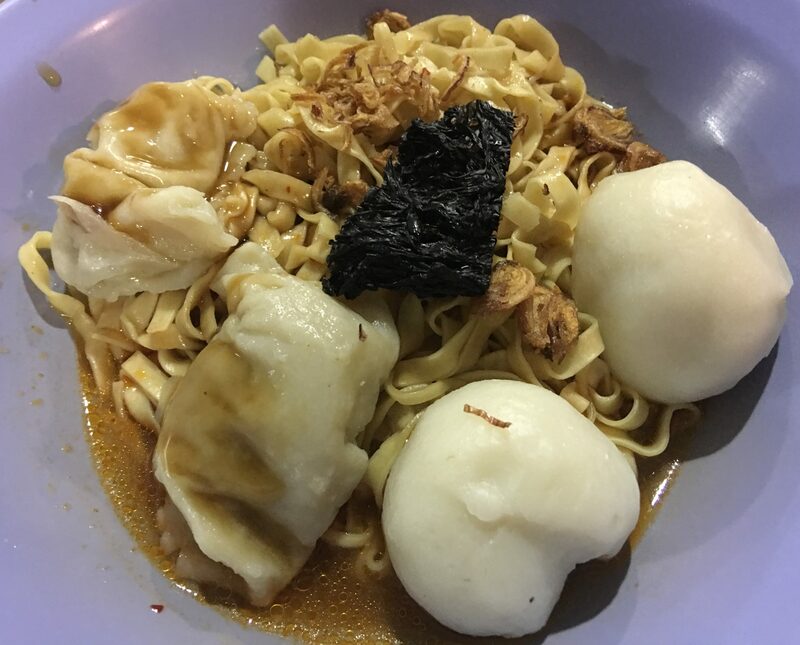 When you talk about Singapore Hawker Masters and Legends, you have to talk about Fishball Noodles, and here in particular, Ru Ji. 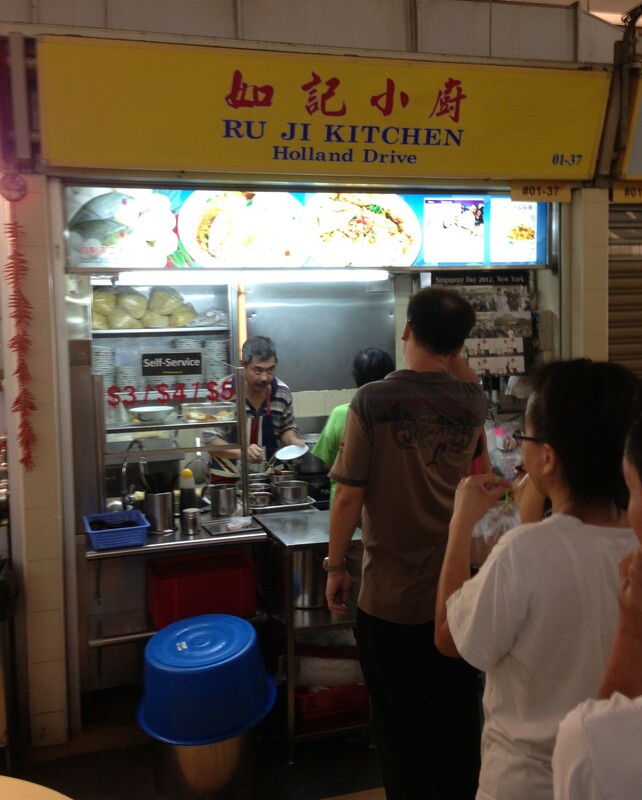 Ru Ji(37, left) is my choice of the four Fishball Noodle stalls at Old Airport Road. 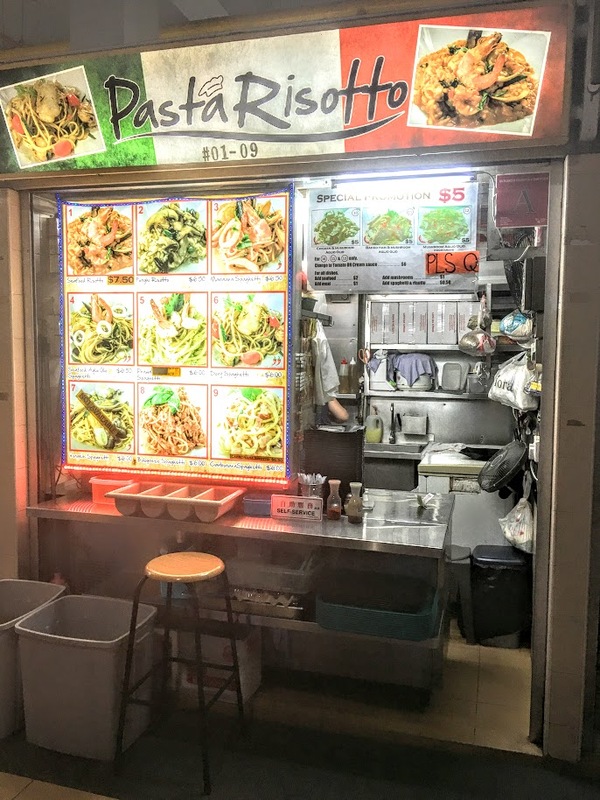 Ru Ji is a branch of the stall at Holland Drive, and it is just as good. 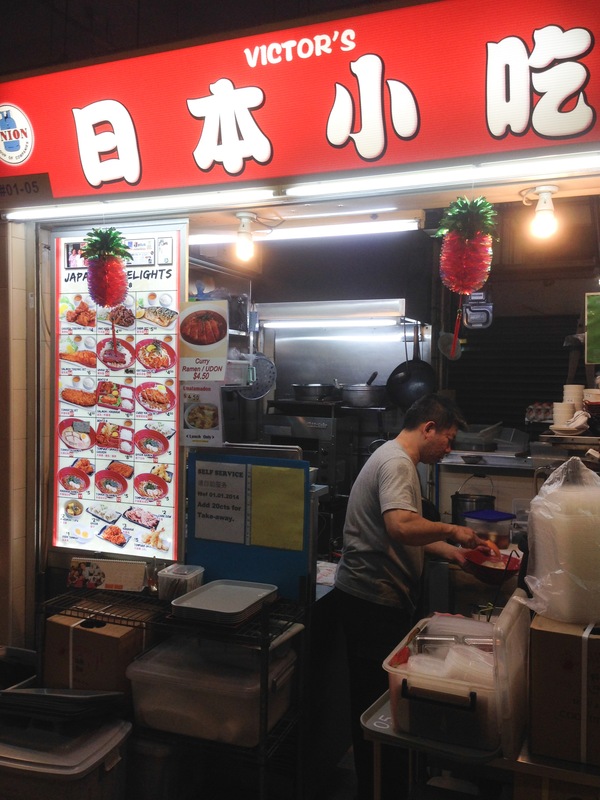 Invited to take part in Singapore Day in New York City, this stall does not disappoint. 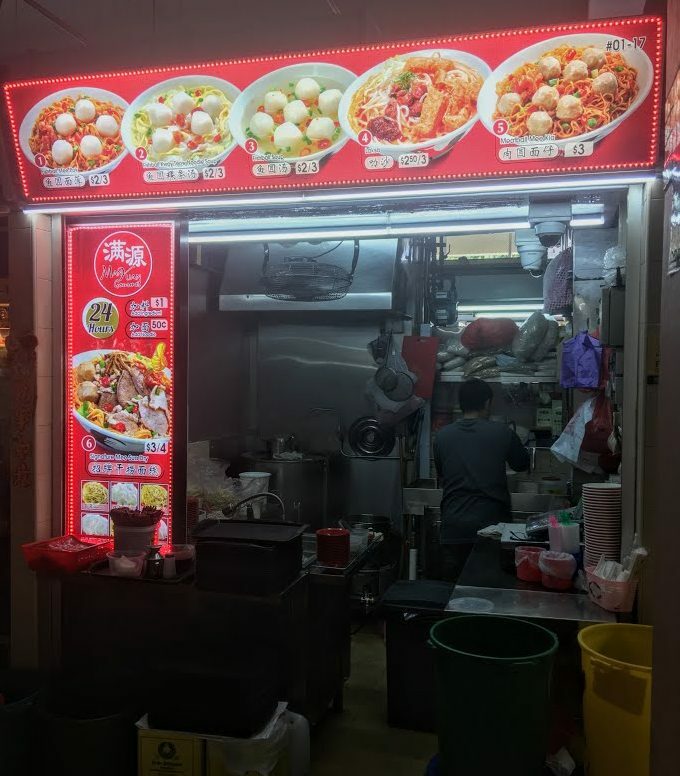 The uncle works hard behind the stall, pinching off noodles, boiling fishballs, putting it all together. The others are cutting fish cakes and preparing the bowls. The queues are quite long, it’s about a 15-20 minute wait usually, 30-40 on weekends. 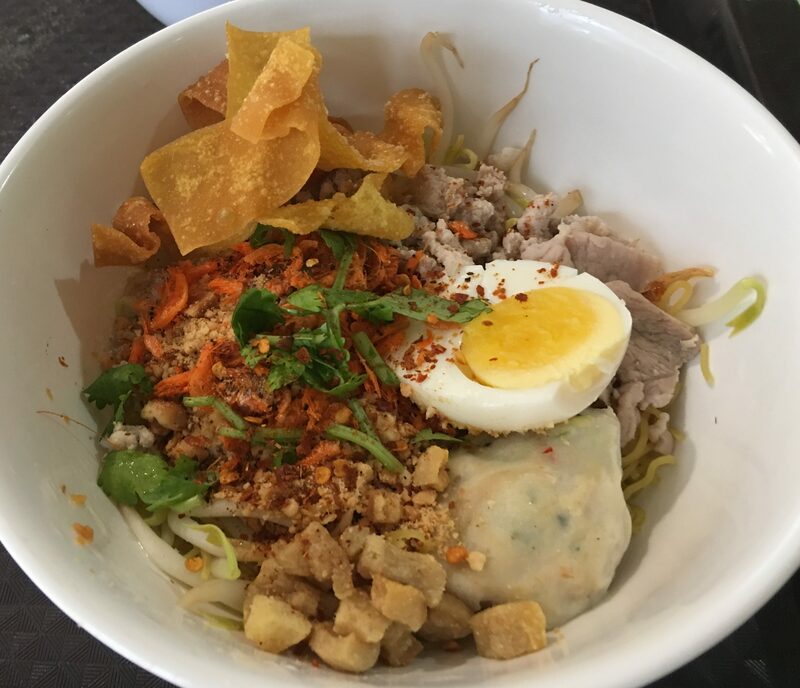 But what you get is a great bowl of noodles, well worth the wait. The handmade fishballs are springy, and yes, they do bounce. 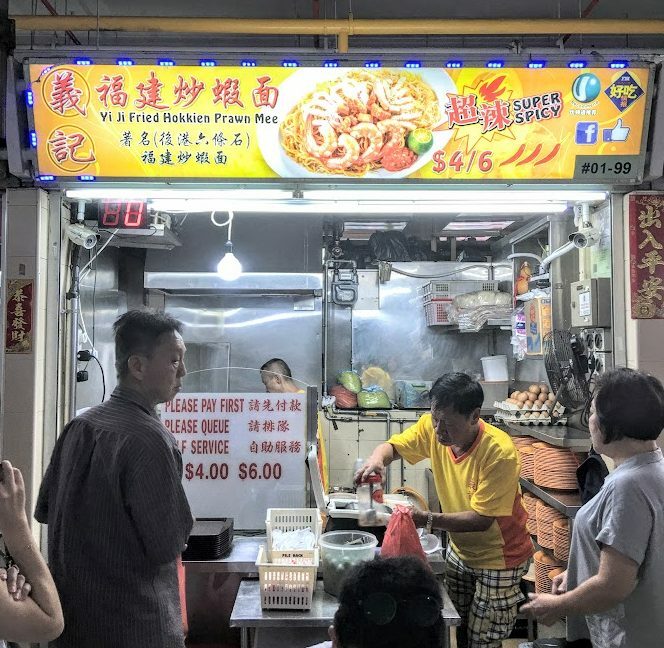 The fish cakes are also handmade and when you take fresh Mee Pok, mix it with vinegar and chili, and then put it altogether, you get heaven in a bowl. 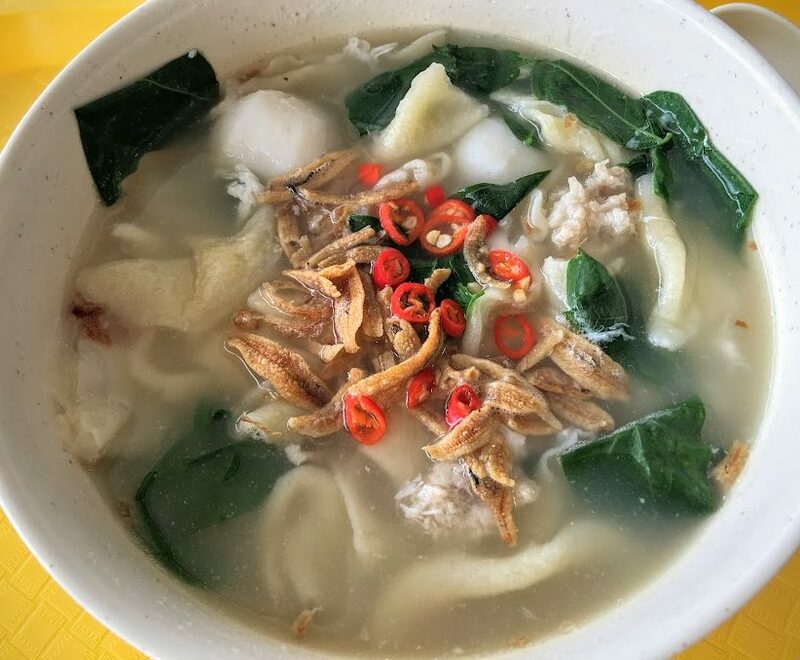 There is debate out there about what kind of noodles work best with Fishball Noodles. 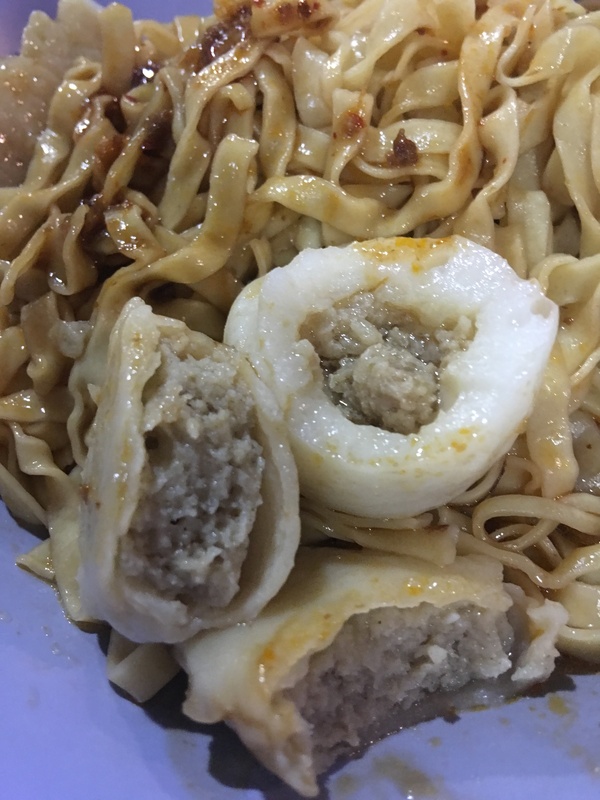 Some say Mee Pok, some say Mee Kia. Others say it must be soup and with Kway Teow noodles. For me, it has to be Mee Pok and it has to be dry, not soup. I just find the wider noodle gets coated much better with the vinegar and chili. I don’t get that with the Mee Kia. And as for the soup style, it’s nice, but I like the chili and vinegar bite from the dry version. How about something to drink? 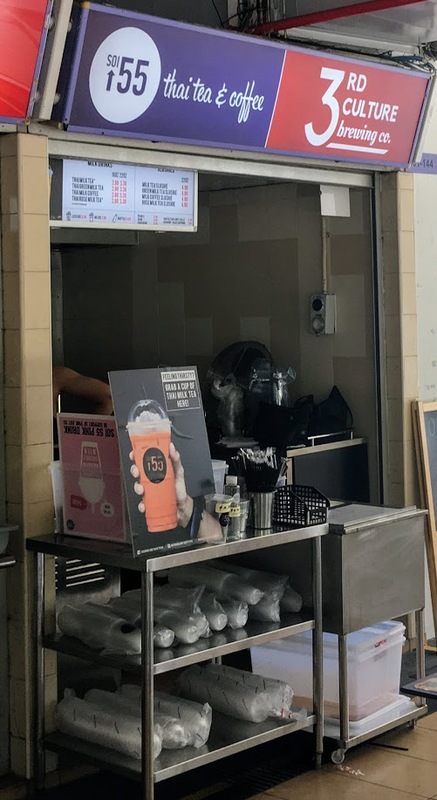 There are a lot of regular drink stalls at Old Airport, and a few juice stalls too. But the one that is to be remembered is the one that has been there for a long time. Plying their trade, they used to just sell Soursop juice. Now they’ve expanded with some machinery and equipment and offer a lot of other fruits, juices, freezes, etc. 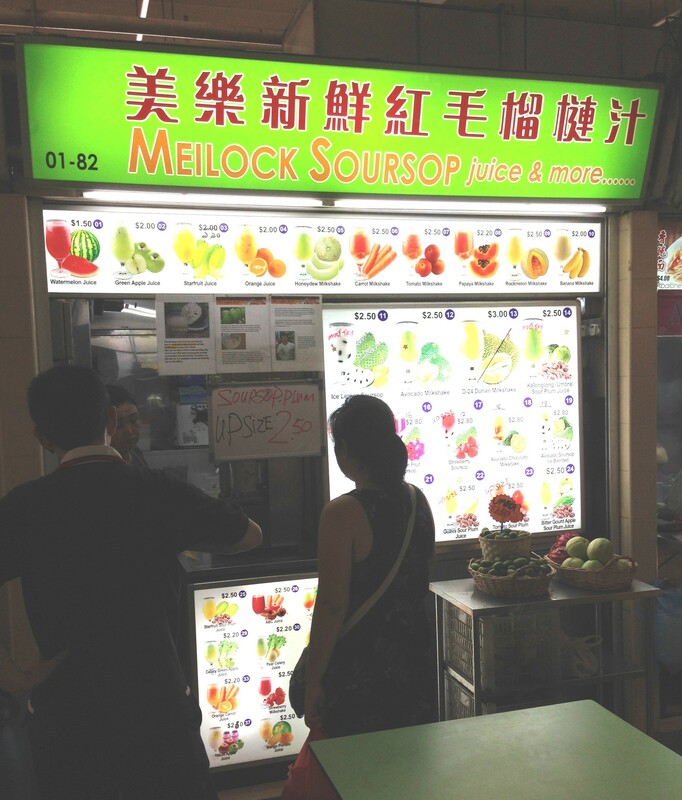 But the Soursop is still the main reason you keep coming back to Meilock Soursop (Now renamed Just Juice…) (82, middle left). As I said, it used to be just pure Soursop juice, which is great in it’s own right. The amount of soursop is generous and the juice is nice and sweet. 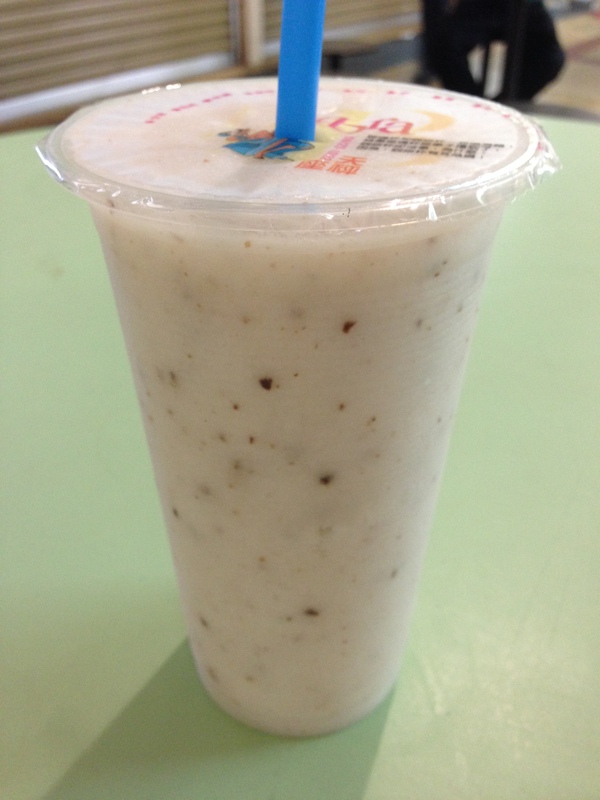 But, I have grown to love the Soursop freeze. And if you add a little bit of sour plum in there – whoa! 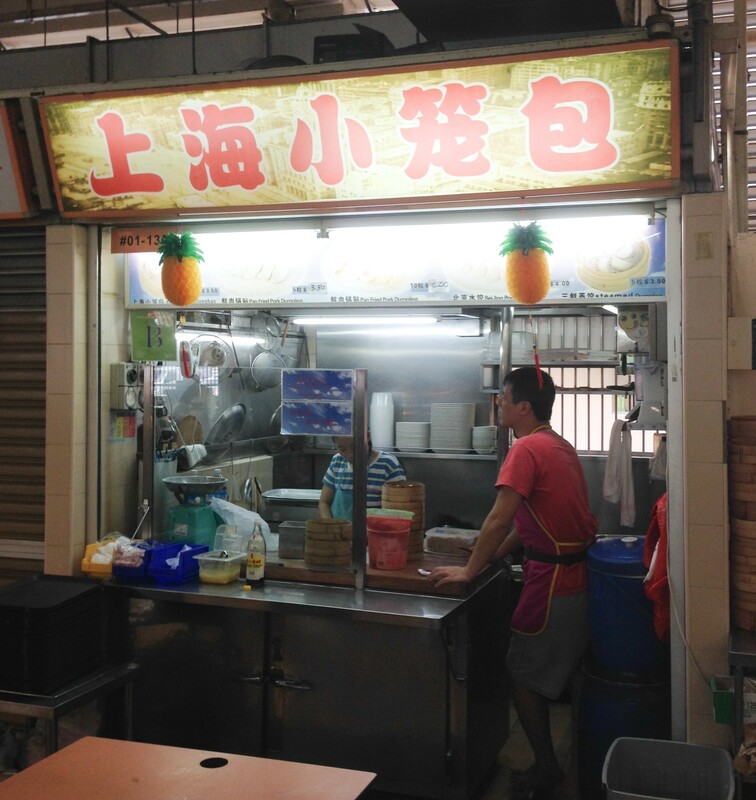 It tastes awesome and cools you down on a hot day, and in the hot hawker centre. They also offer a card which gets stamped each time you buy one cup. After five cups, you get a free one. Another interesting place that just opened up is Soi 55 Thai Tea & Coffee (144, back right). Located all the way in the back, it should be interesting to see if they have what it takes. 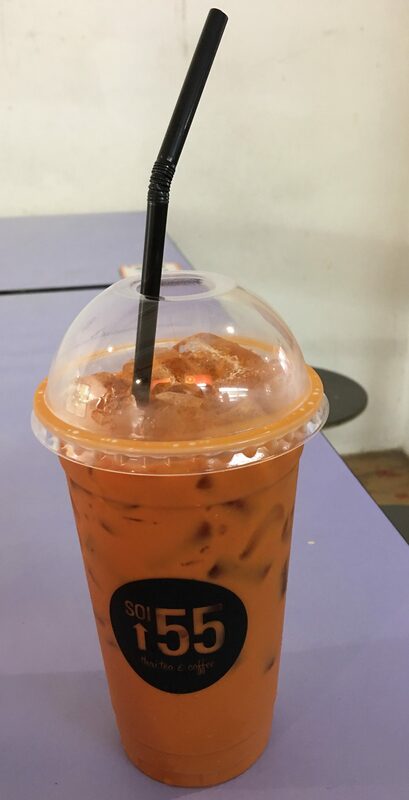 Here is their Thai Milk Tea They have now changed to just the Brewing company as of March 2018, so we’ll see what they do with the beer. Speaking of cooling down and perhaps having a dessert after your meal, Old Airport Road is where Lao Ban (107, 127 middle right) started. 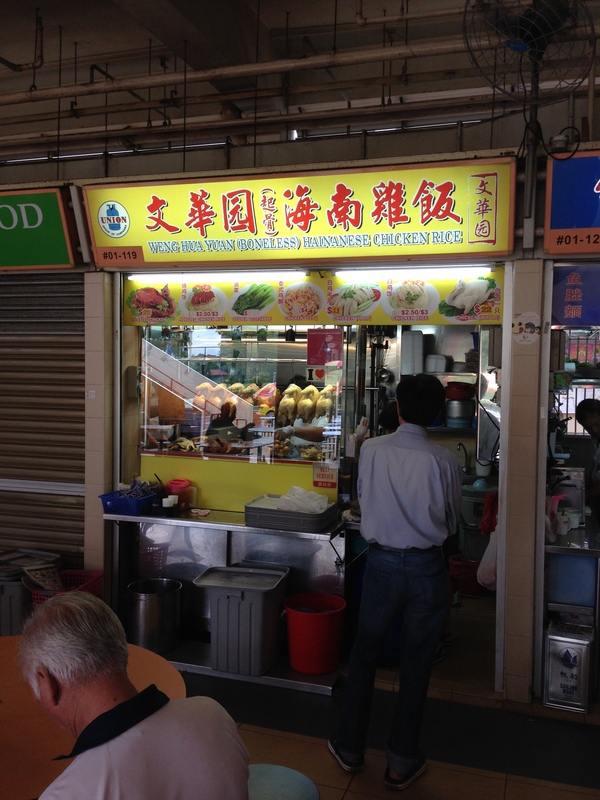 Lao Ban had one location a few years back, and it was right here at Old Airport Road. After being featured, the queues started and kept going. It was a madhouse. 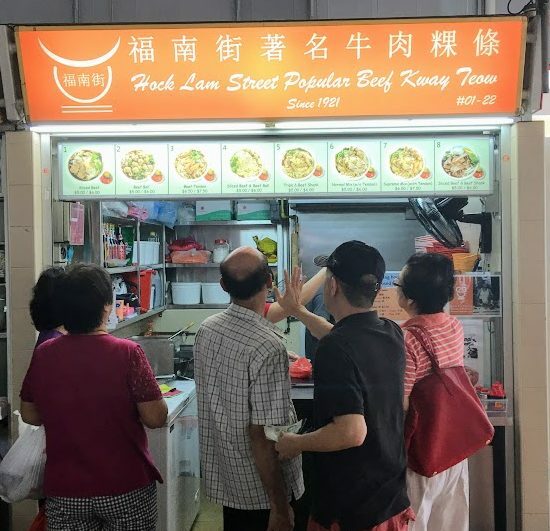 People would queue for two hours before the stall opened at 11am. There used to be two shifts, one morning and one evening shift, because they would make a batch and it would sell out, so they would close and make more. But then, they opened up another outlet. Soon, they got partners and franchised, and it opened up stalls everywhere. 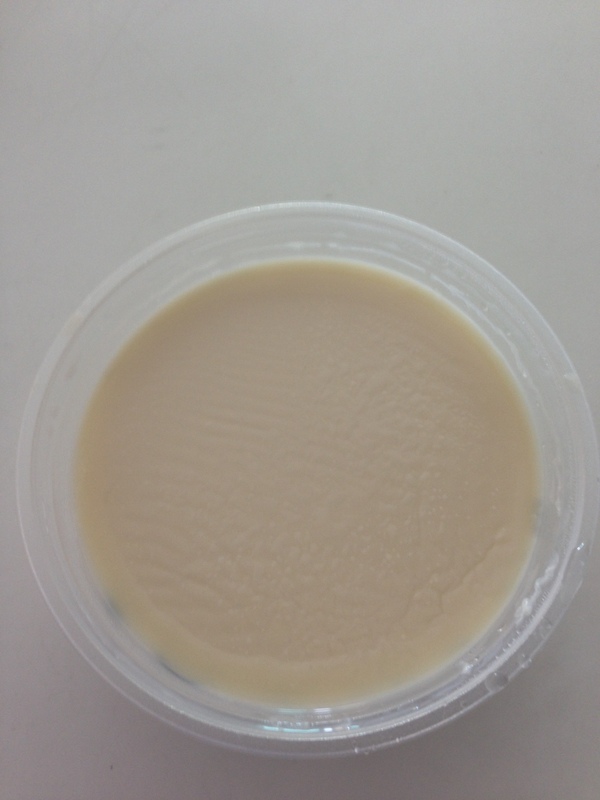 Now, there are no more queues, only stacks and stacks of Soya Beancurd in the cooler. If you ask me, they expanded too fast and too soon. It was a novelty, people came from miles around to get this. There was buzz, there was an atmosphere. Now, it is found everywhere and it’s nothing special anymore. 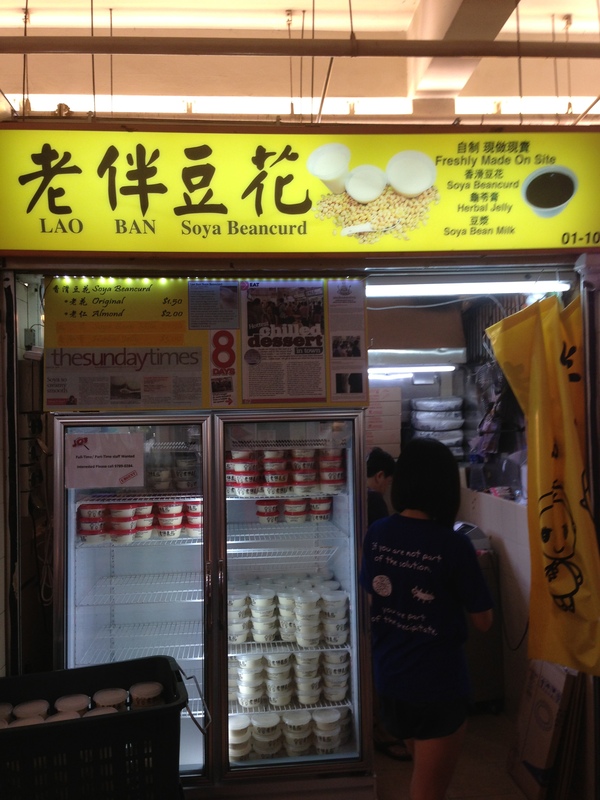 But, the taste is still the best soya beancurd that I have found in Singapore. There’s a slight skin on top, but once you dig in, it is silky smooth. I have heard that the secret ingredient is similar to powdered carnation milk, but am not sure. Either way, it tastes good. When Lao Ban took off, everyone wanted to get in on the act. 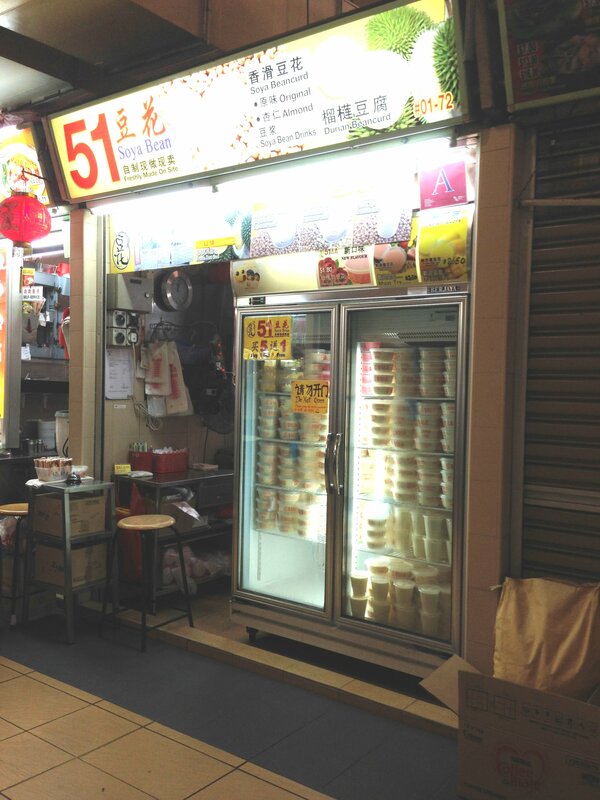 Old Airport Road got two stalls of 51 Soya Bean Curd. Now, they only have one stall left (72, middle left) and business is slow for them. When the craze started there were at least three more soya bean stalls at Old Airport. Now, there’s just the two Lao Ban stalls and the one 51. 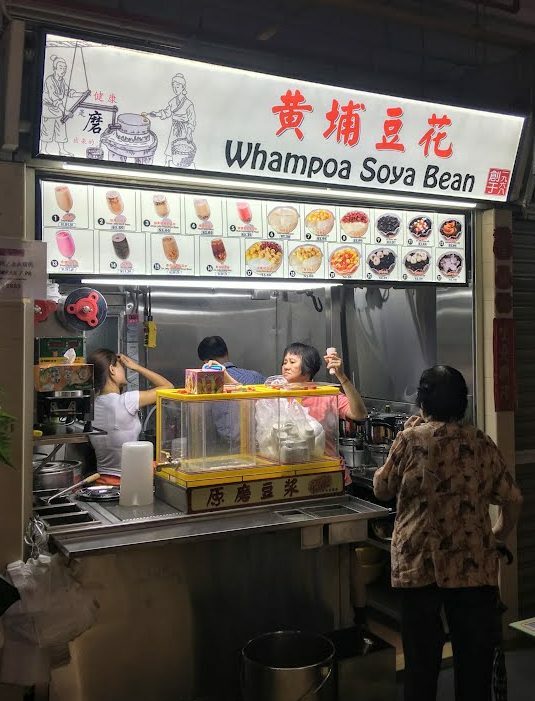 Just opened in March 2018 is Whampoa Soya Bean (68, middle left). 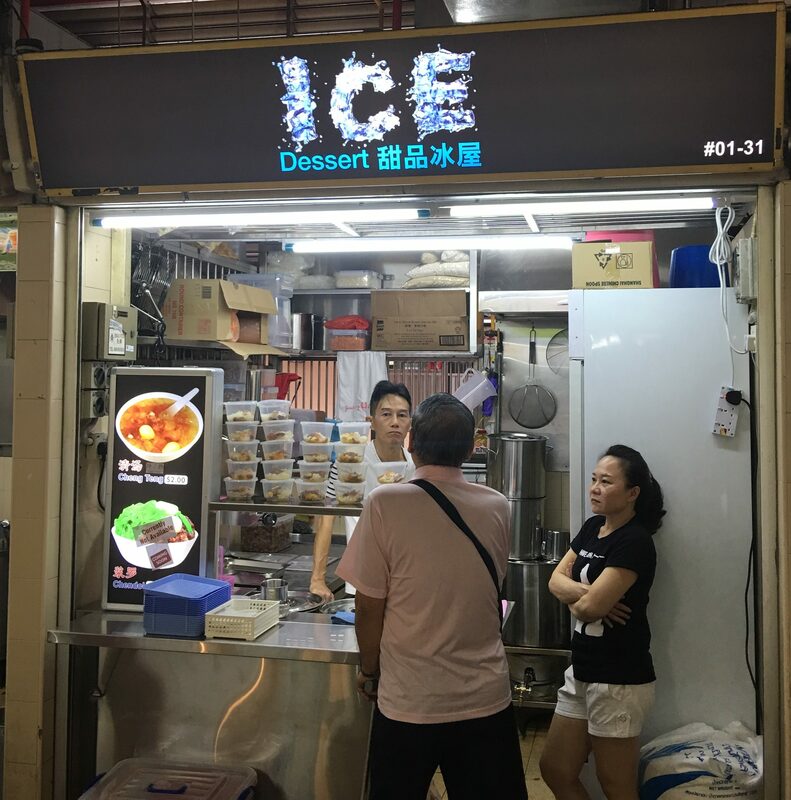 They specialize in a variety of Soya Bean desserts. Fancy pancakes for dessert? 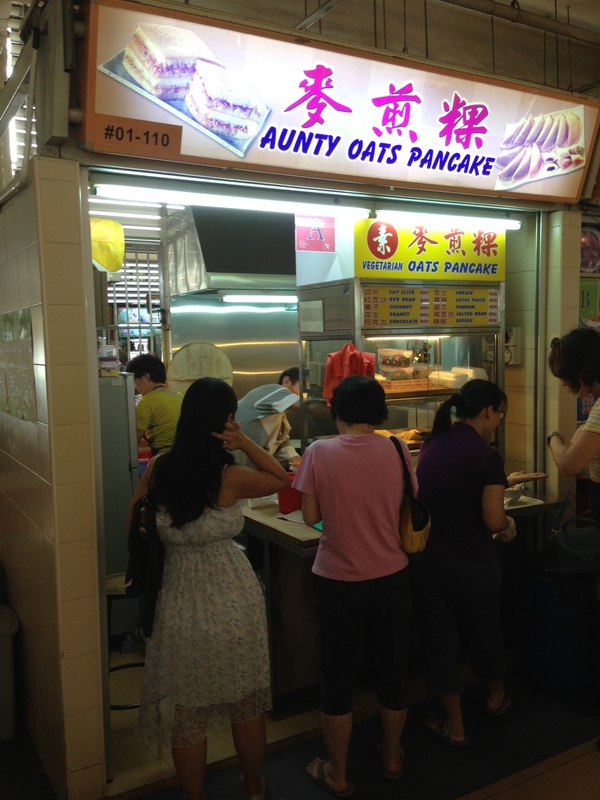 Give Aunty Oats Pancake (110, middle right) a try. 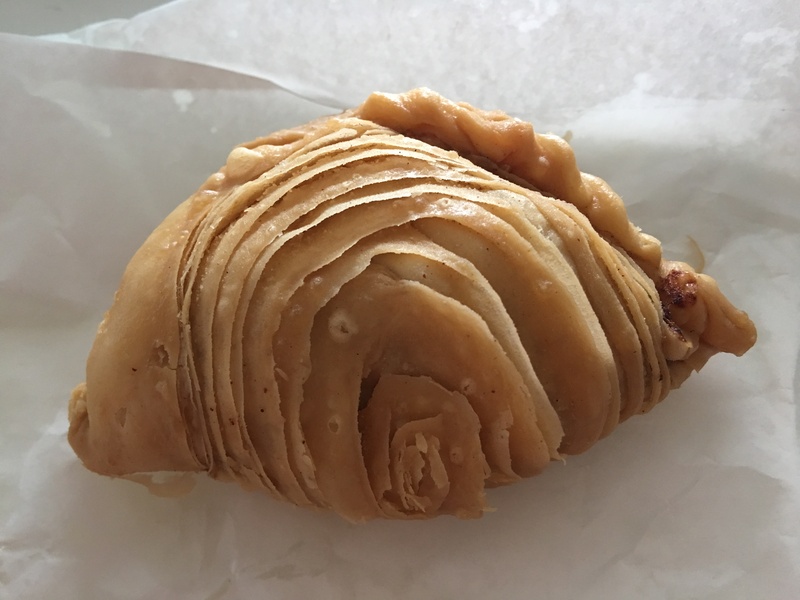 They have your normal pancakes, round, stuffed with peanuts, or coconut or cheese or red bean paste, then cut into pie shapes. But they also make the enclosed pancake with you filling. The danish, taco, enchilada, etc. style. I like that style, easy to eat, easy to taste. And I like the coconut, like below. The coconut is nice, not too sweet, and the pancake itself is nice and soft, not too wet. It’s a good eat. If you want hot desserts, you should try Dessert Hut (115, middle right)(Now Closed). 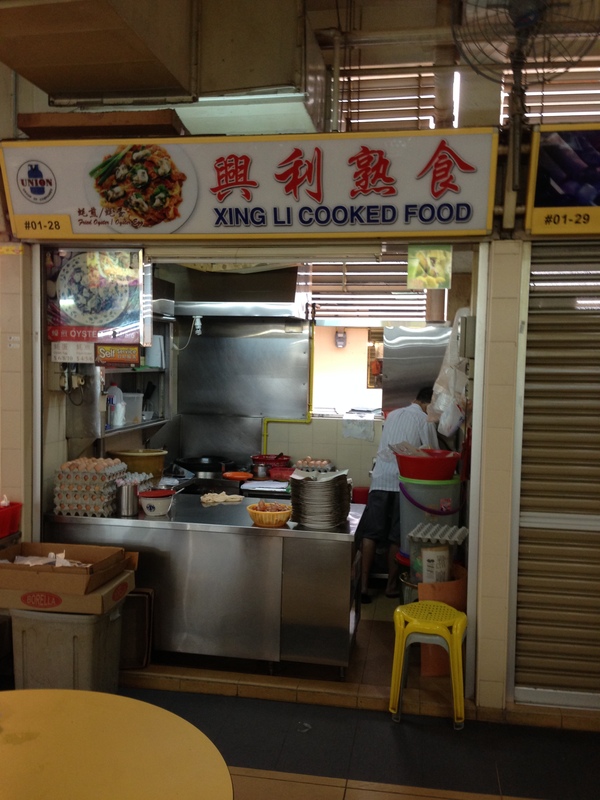 This is located right next to Xin Mei Xiang Lor Mee. 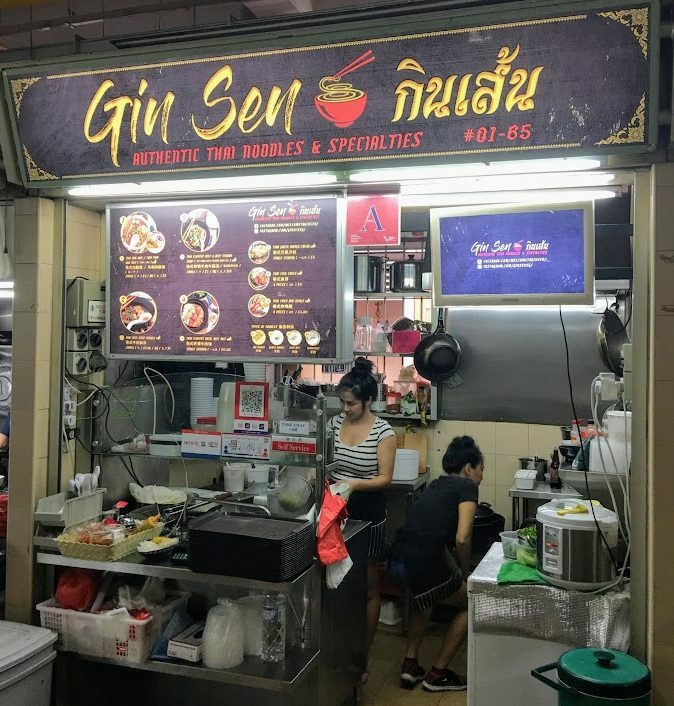 You can get all the good hot desserts here, Sesame Paste, Almond Cream, Tau Suan, Green Bean Soup and Chng Tng. It really is a nice end to a meal if you like the sweet soups for dessert. 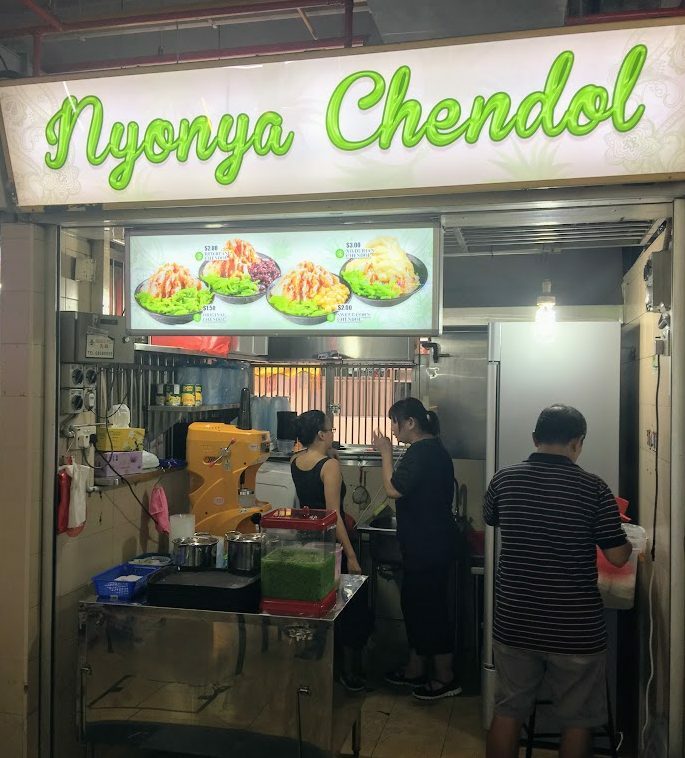 Traditional Nonya Chendol is what you want? 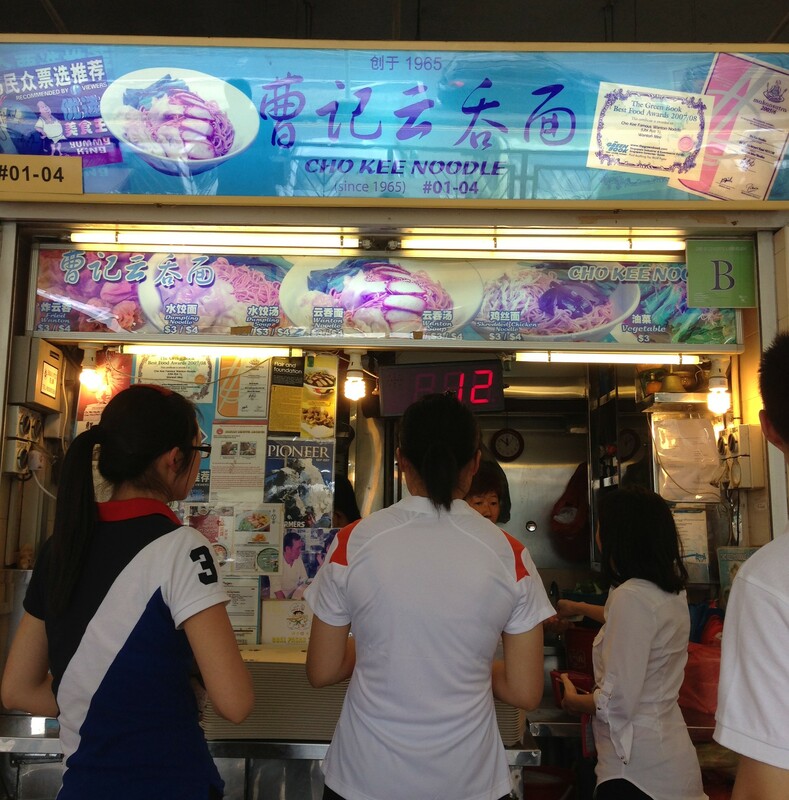 Taking over the Bak Kut Teh stall is this gorgeous and delicious way to cool down in the hot hawker centre. This is the corn version. They also have Plain, Red Bean and XO Durian. These two stalls have now merged and formed one stall. To share costs and business. It is located at the Dessert Hut stall (115)(Dessert Hut now closed). But now, it’s only Nyonya Chendol. In Nyonya Chendol’s old place is Ice. 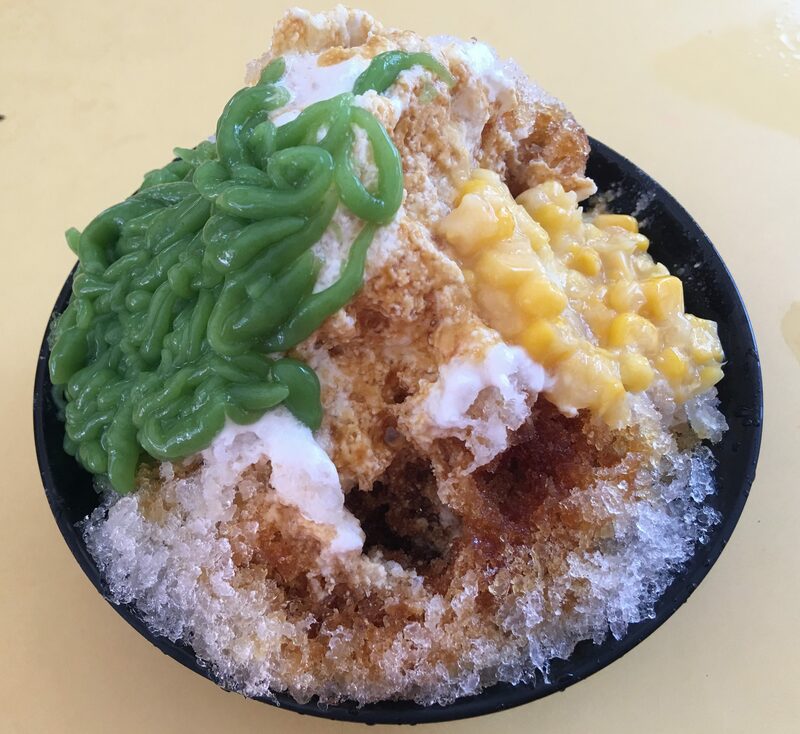 They sell Chng Tng and will also add Chendol. And there are also now Hong Kong desserts. 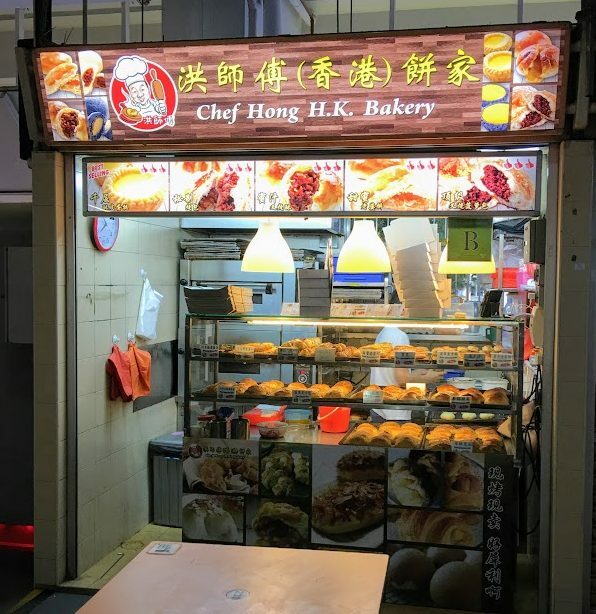 Chef Hong HK Bakery (relocated to 131, middle right) has opened and serves HK style buns and egg tarts. The egg tarts are not bad, but it’s a good eat. Another stall that sells these types of goodies is Jia Mei (43, left). 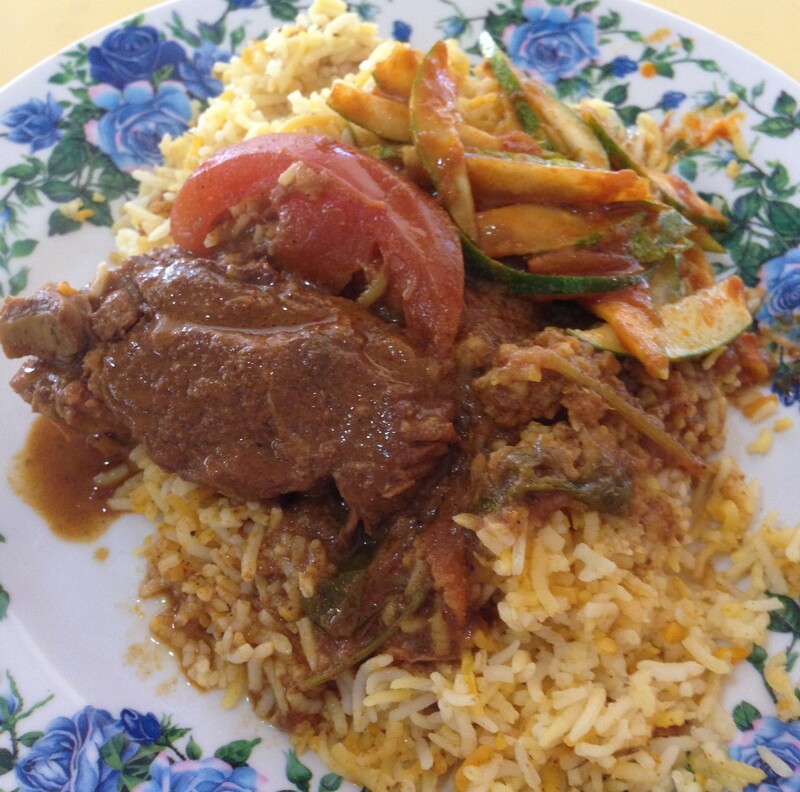 It’s in the back near the Briyani stall. Then there is newly (August 2017) opened Chong Pang (79, middle left (where HK Bakery used to be)). 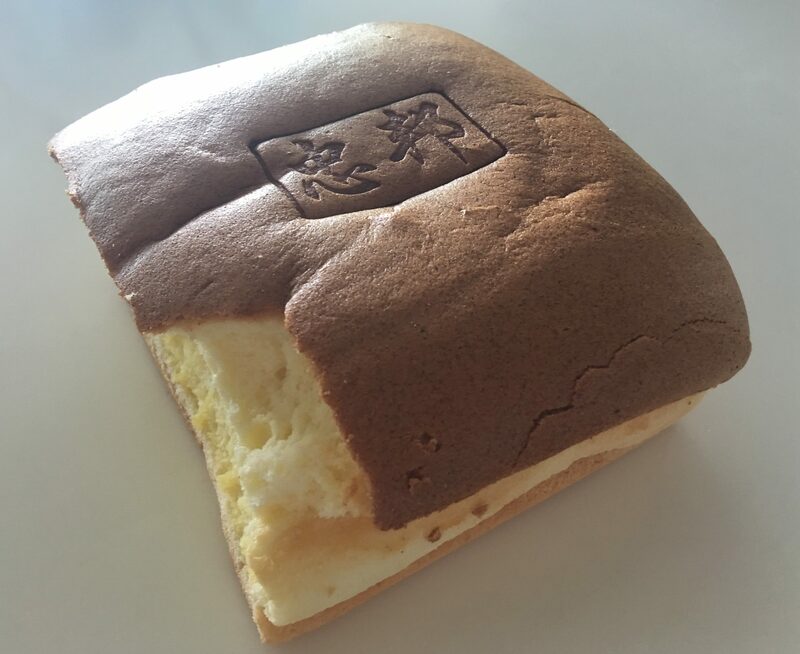 They are known for the latest craze – the Castella Cake – in addition to other baked goods. The Castella Cake is a standard run of the mill. Honestly, I don’t understand the craze. 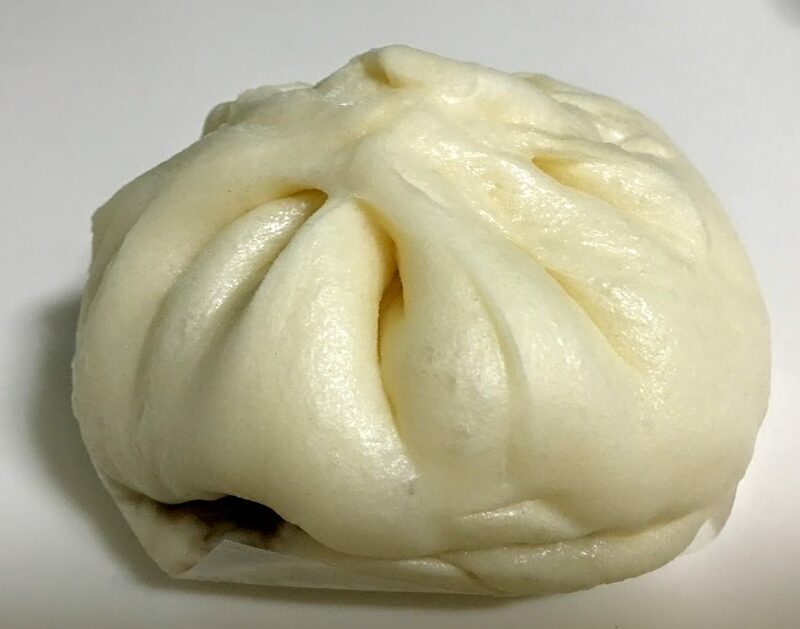 Here is their Da Bao. Lots of interesting things inside. 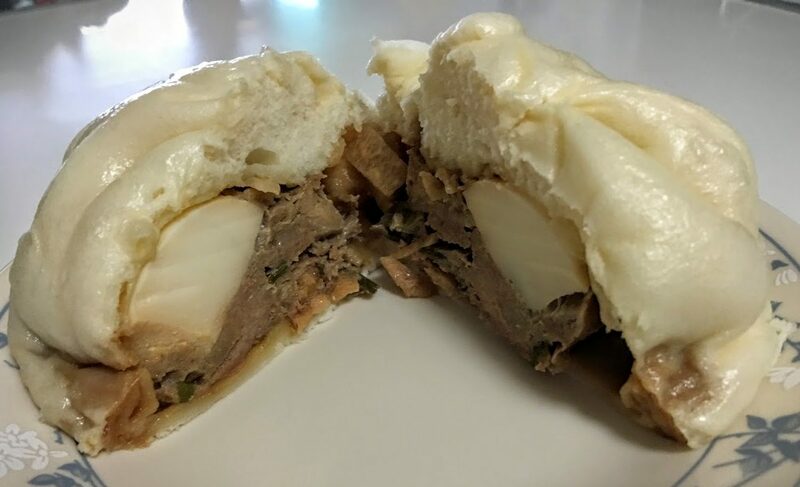 They also have a Kong Bak Bao, which is interesting. And a low-fat version of it. 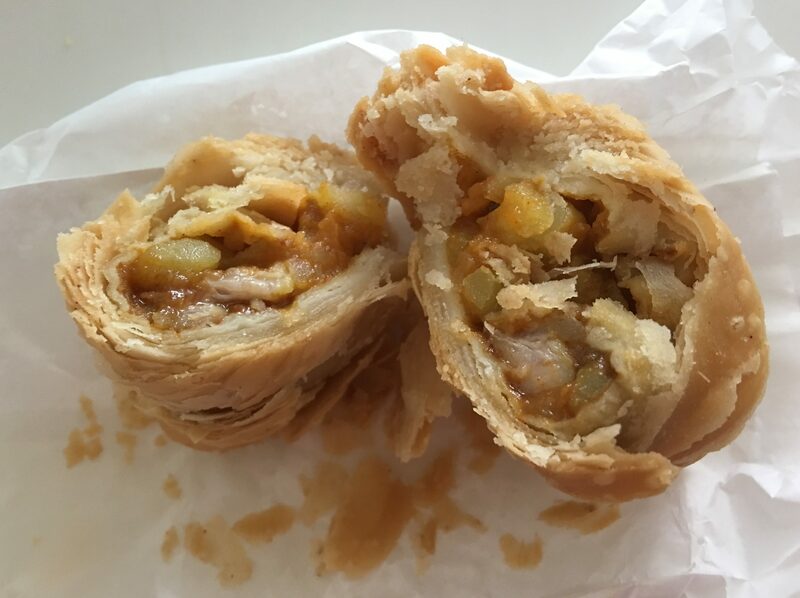 And then there is Wang Wang Curry Puff (126, middle right). Famous for the crispy puffs, they certainly look it. 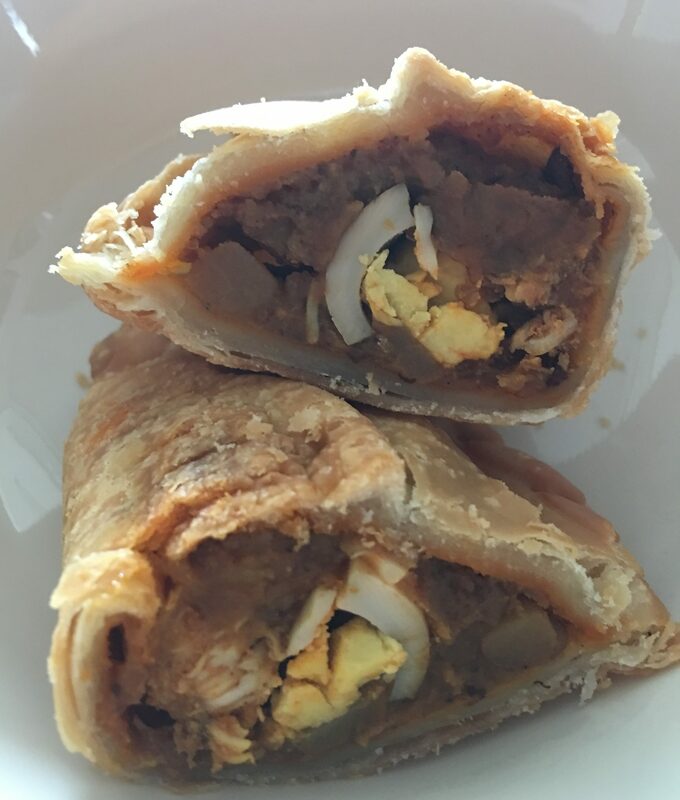 They definitely flake and the curry and potatoes inside are nice and flavorful. Let’s not forget about Genie (157, right) . 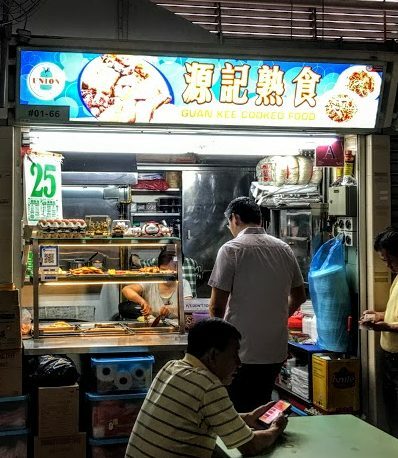 They just opened with Puffs and Kueh. This one is interesting for sure. Especially when you open it up. 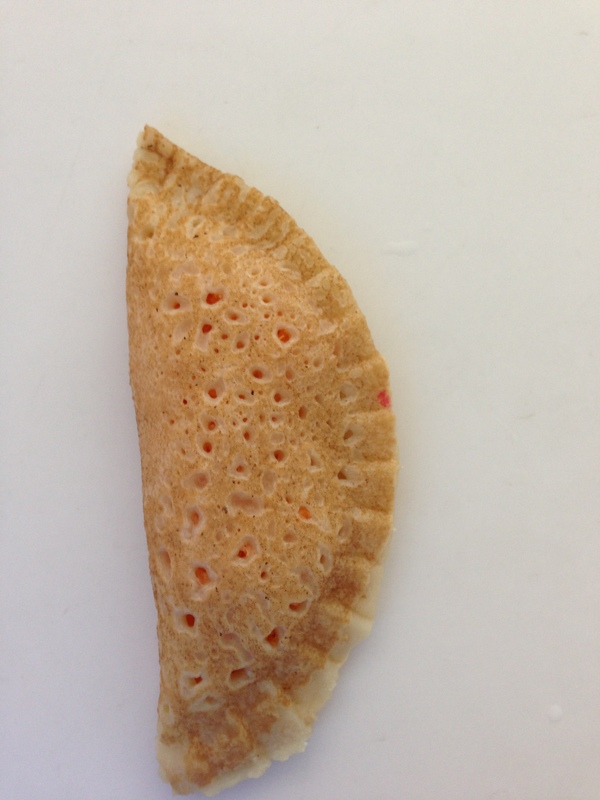 There is chicken and egg inside. Almost like a Curry Da Bao Puff. There are also a few bakeries at Old Airport and they all seem to be right next to each other. 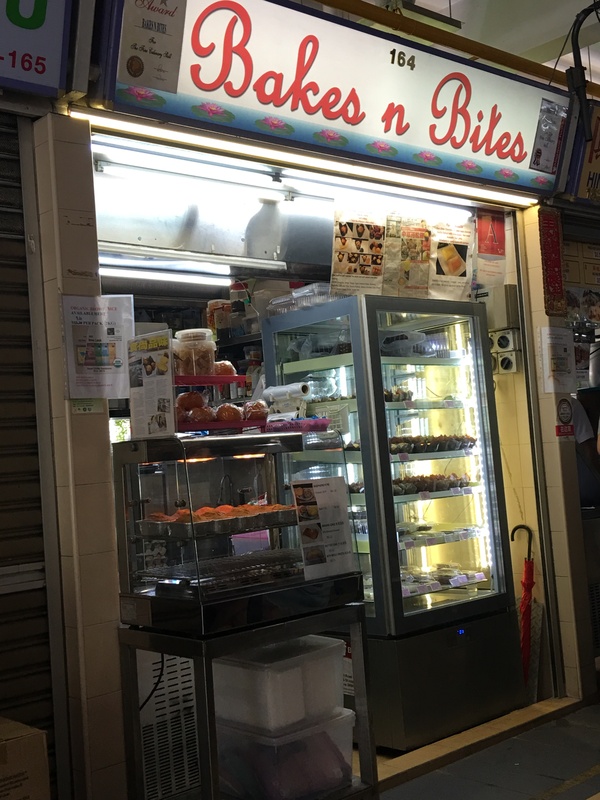 Bakes n Bites (164, right) is one of them. Xin Tian Di (160) is almost right next door. And right next door to them is 727 (159)(NOW CLOSED). 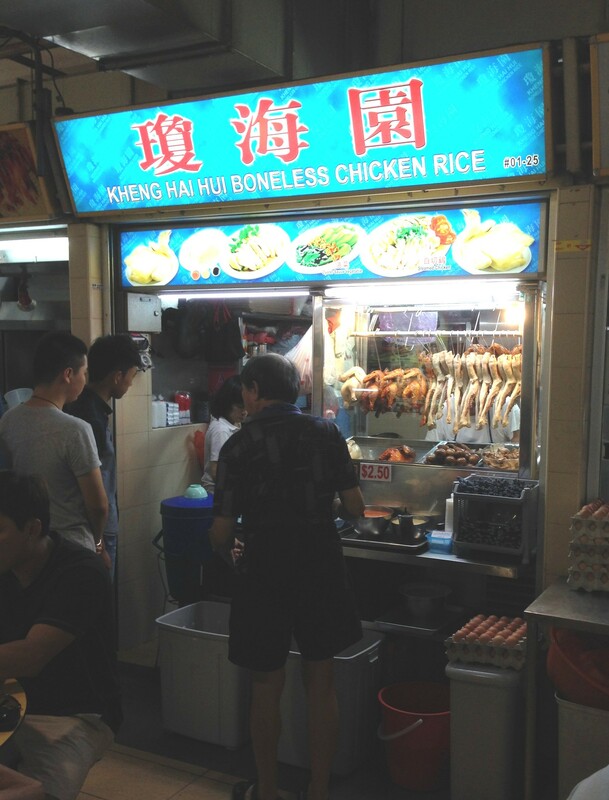 You would think that a great hawker centre like Old Airport Road would have great Chicken Rice. 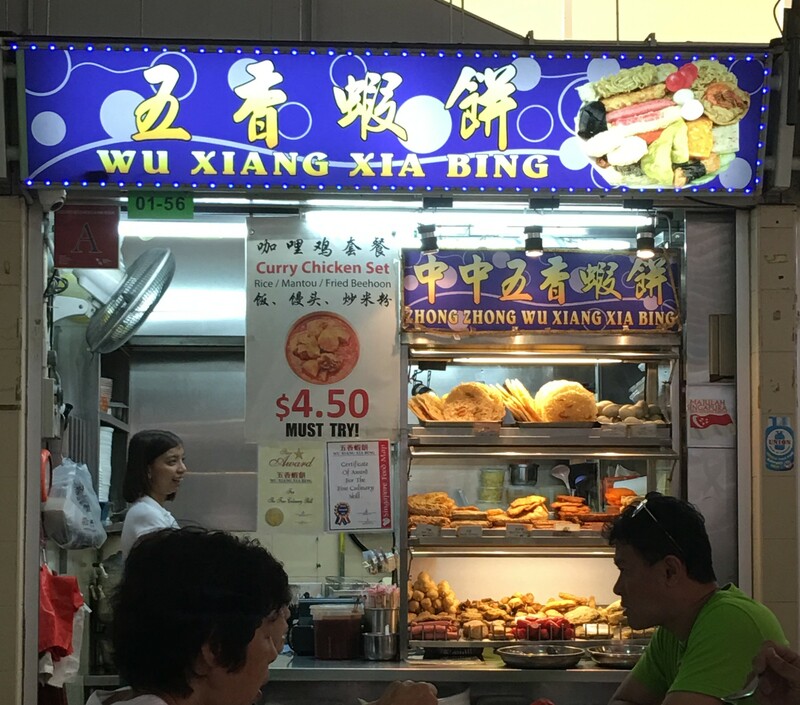 After all, it’s the national dish of Singapore. But, the selection is not that big and to be honest, it’s average. Kheng Hai Hui (25, left) Boneless Chicken Rice does a decent job. 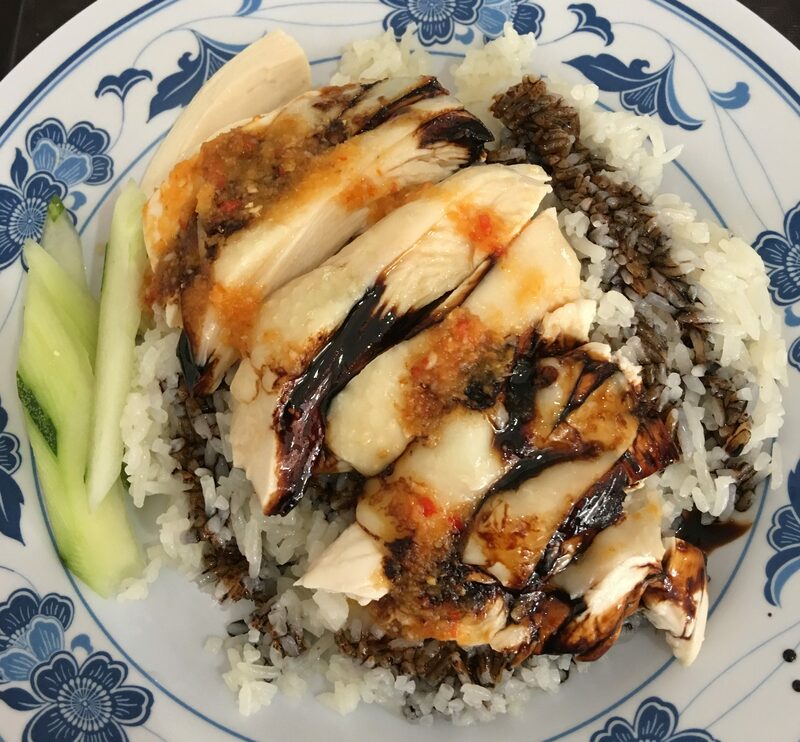 It is pretty much a standard Chicken Rice for a hawker centre, but that doesn’t mean it’s not great. The normal order here is $2.50, but go for the extra dollar and get the $3.50, you won’t regret it. You get a little more meat and it sticks to your bones a little more. You get quite a good deal for $3.50, it works out real well. 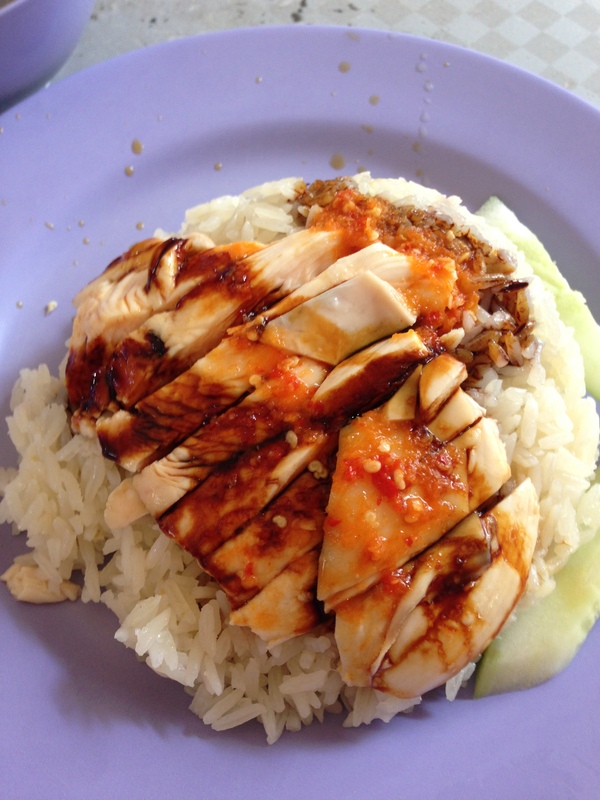 Now remember, everyone likes their Chicken Rice differently. Me, I don’t do the ginger, but I do the black sauce on the rice, add a bit of chili to the rice as well. Then I put chili on each piece of chicken as I eat it. That is what works for me. For some, they combine, add this, add that, it’s all good. Whatever you decide to do, if you like it, then enjoy! 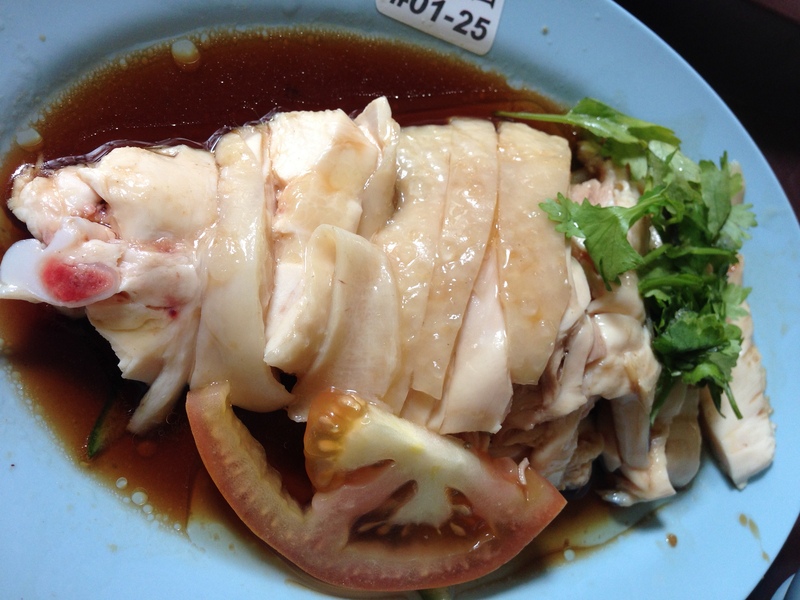 Take a look at the chicken, it is quite tender and nice. 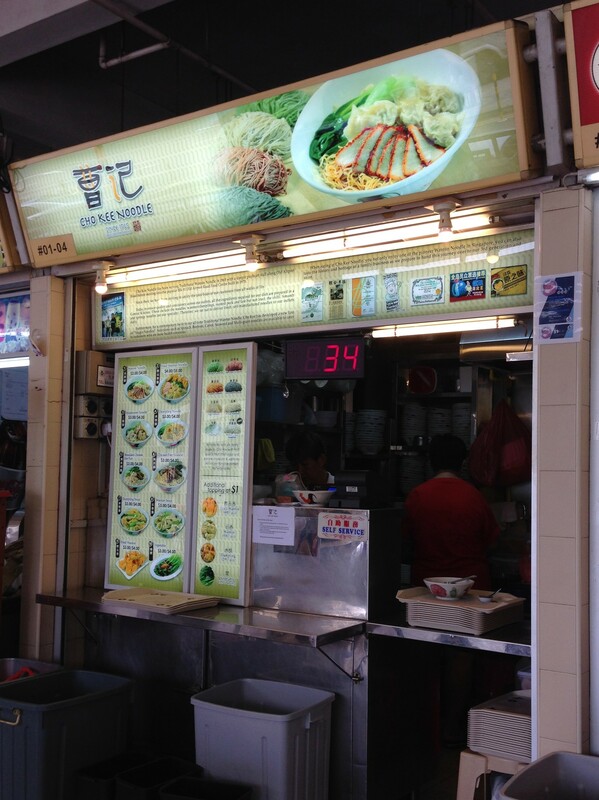 The quality is ok, so this is a good choice if you want Chicken Rice at Old Airport Road. Another choice is Xin Kee (105, middle right). It is a nice portion, decent tasting for sure. It does the job. There is also Weng Hua Yuan (119, middle right). Like above, it is quite average and does the job. 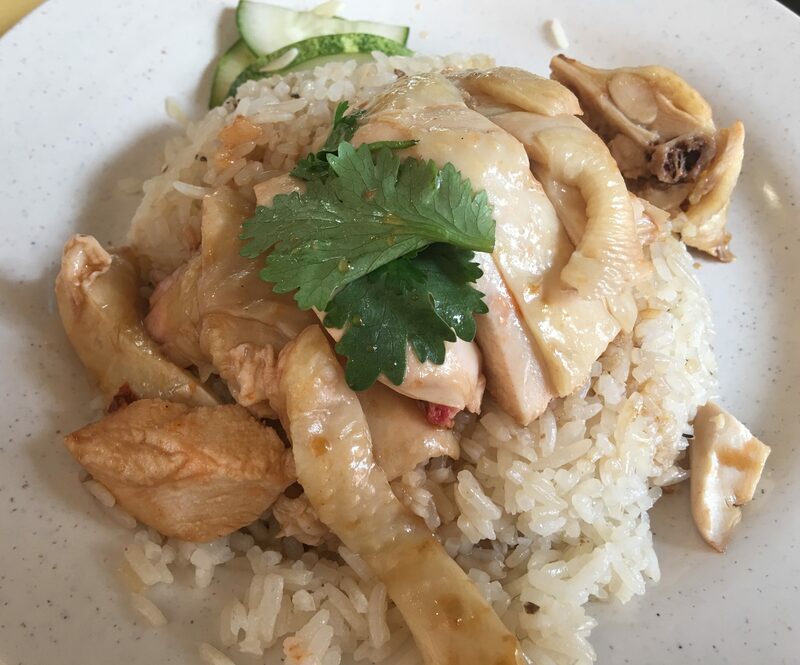 They serve a pretty standard Chicken Rice. Not great, not bad. For $3, you can’t ask for much more. 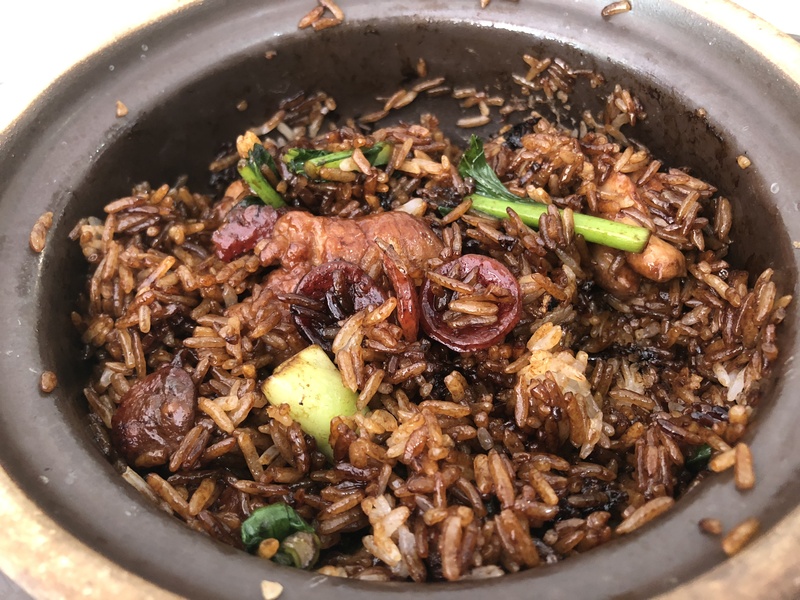 The rice is midly fragrant and the Chicken, while tender, lacks any big flavors. Just opened is Hua Kee (35, back left). 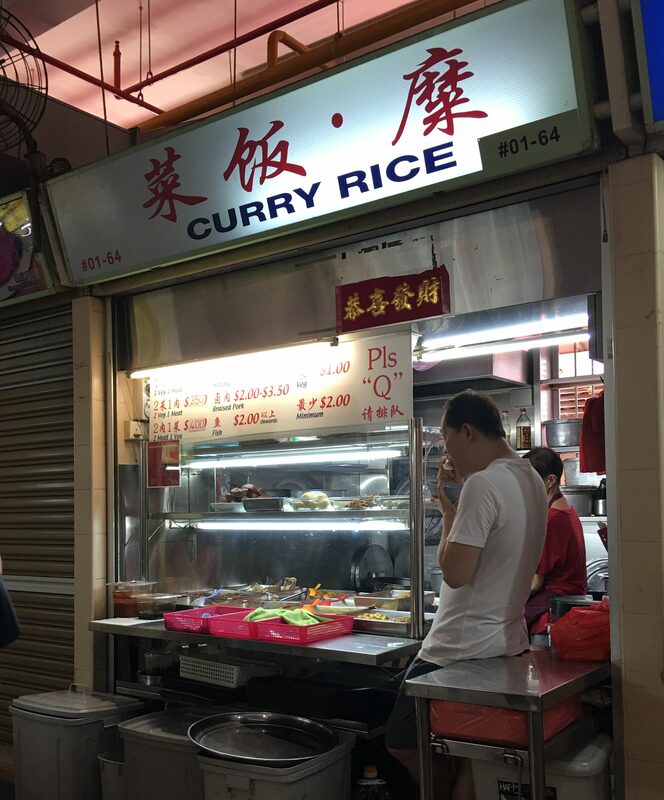 They offer Chicken Rice and Char Siew Rice. 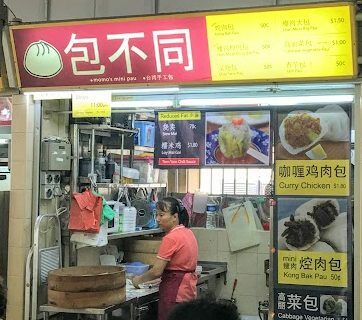 It only opened in March 2018 and was offering a S$2 special per plate. 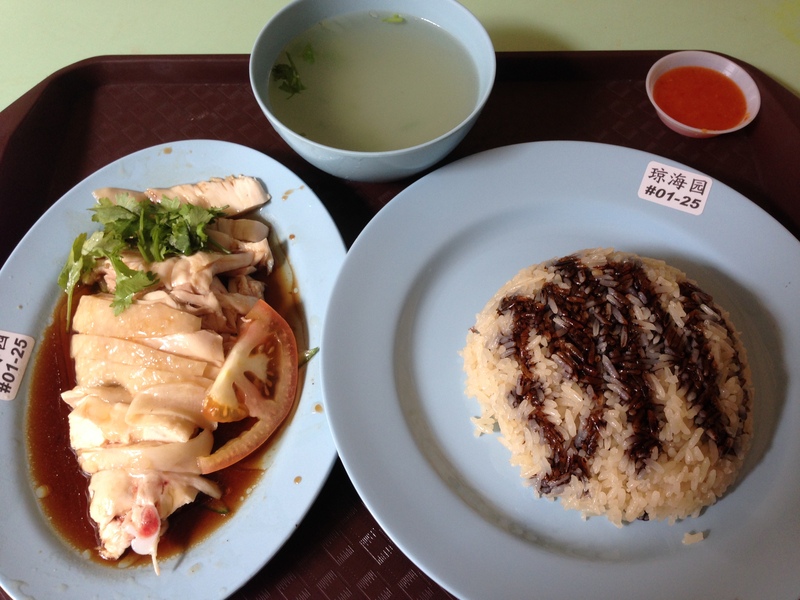 The Chicken Rice is nothing special, very average. Chicken is okay, the rice is a little dry. 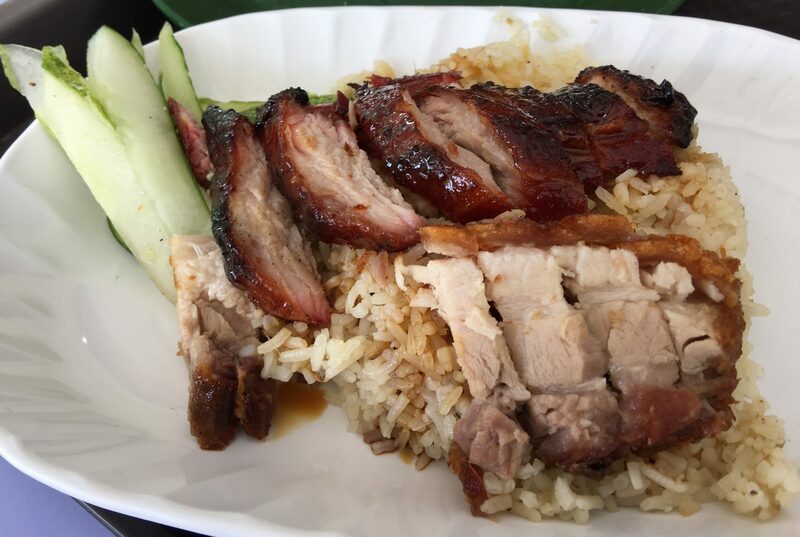 The Char Siew is tender and fatty, so it’s not bad. 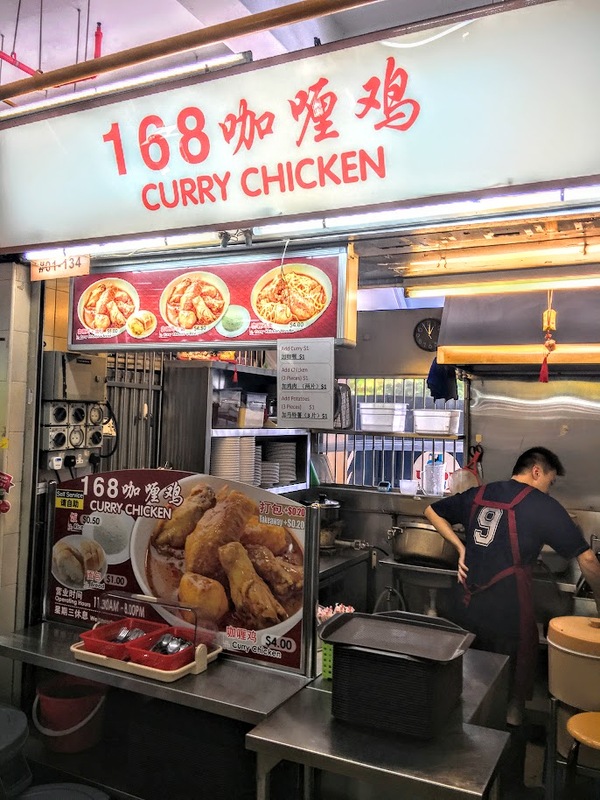 Another good Chicken staple found in Singapore is Curry Chicken. 168 Curry Chicken (134, middle right) gives you this option. Here is the Noodles. 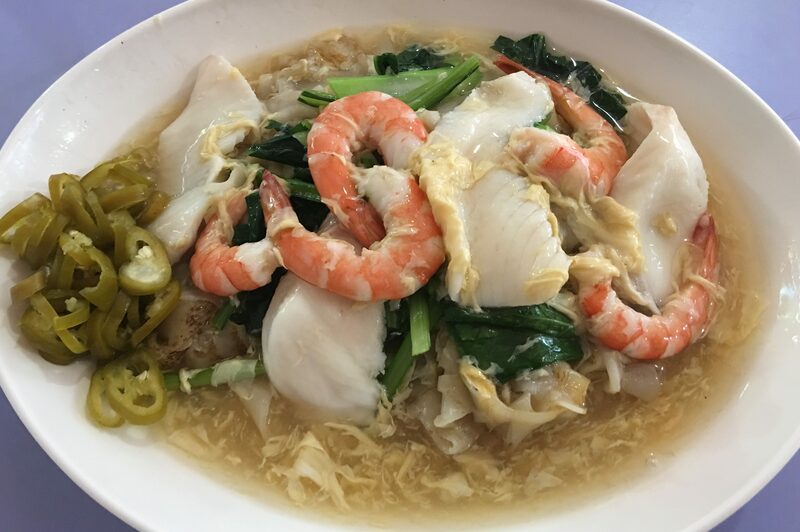 Not bad, it’s a little plain, but it’s ok.
Do you like Fish Soup or Sliced Fish Bee Hoon? 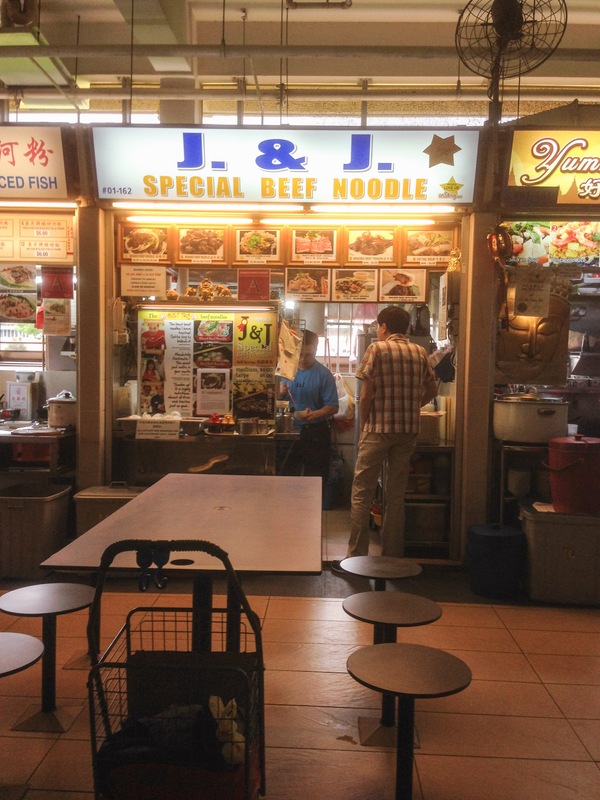 Old Airport Road has two stalls that will satisfy that craving. Here is the old stall. The broth here is flavorful, the fish fried right, the noodles perfect. 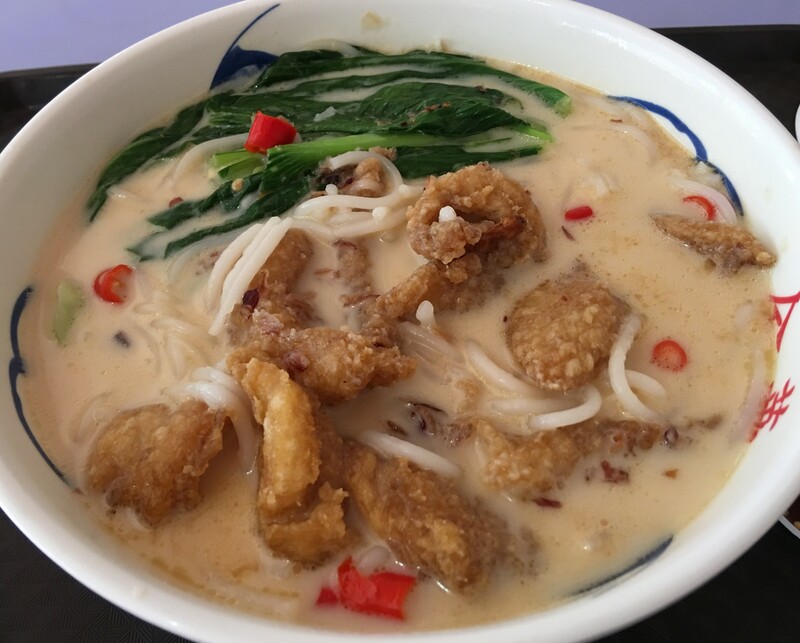 I go for Fried Fish with Thick Bee Hoon and I do not add milk. I don’t quite understand the obsession with putting milk in this dish, but people do it. It’s not for me though. Then I add a few pieces of chili padi to spice up the broth, but I take them out before they make it too spicy. Man, does that work for me! It just looks simple and hearty, and it is. It fills you up and leaves you satisfied. This year, I decided to try it with the milk. And you know what? It really does give it a deeper taste. I quite like it. Still looks so good to eat. 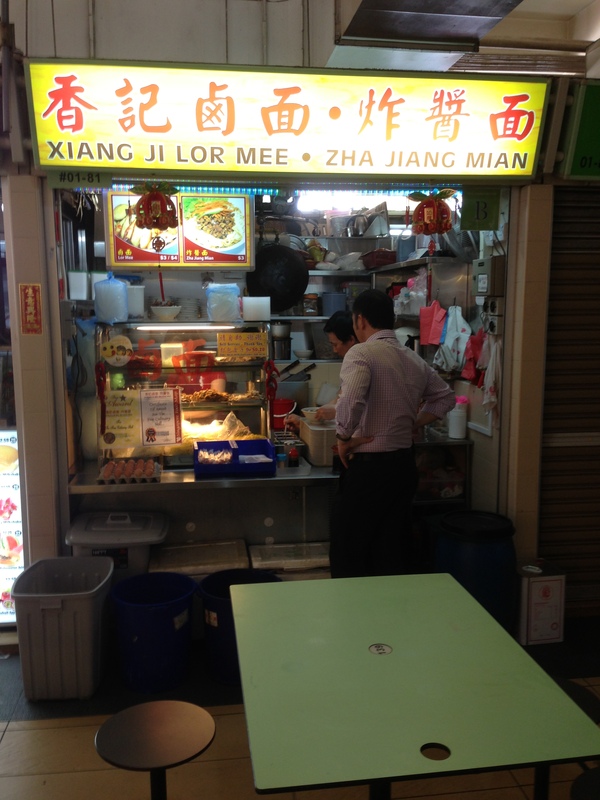 But there is also another one that is one stall away from Jin Hua too! 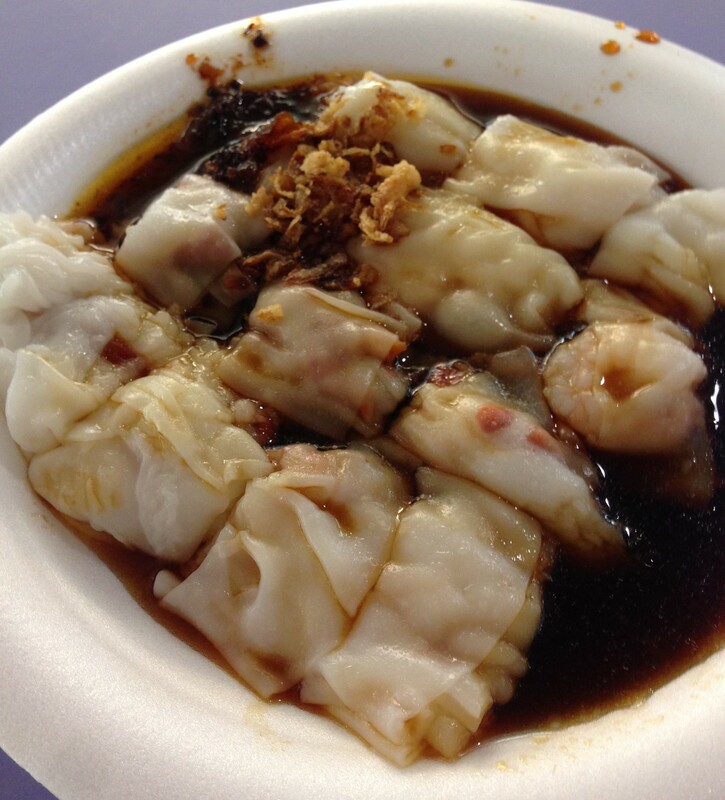 Now Hua Ji XO Fish Head Been Hoon has other items, and in fact, I see Hor Fun, which looks interesting to try. So one day I did try the Fish Slice Hor Fun. There’s a good amount of fish, and the slices are quite thick. The Hor Fun has a good Wok Hei as well. Unexpectedly good if you ask me. 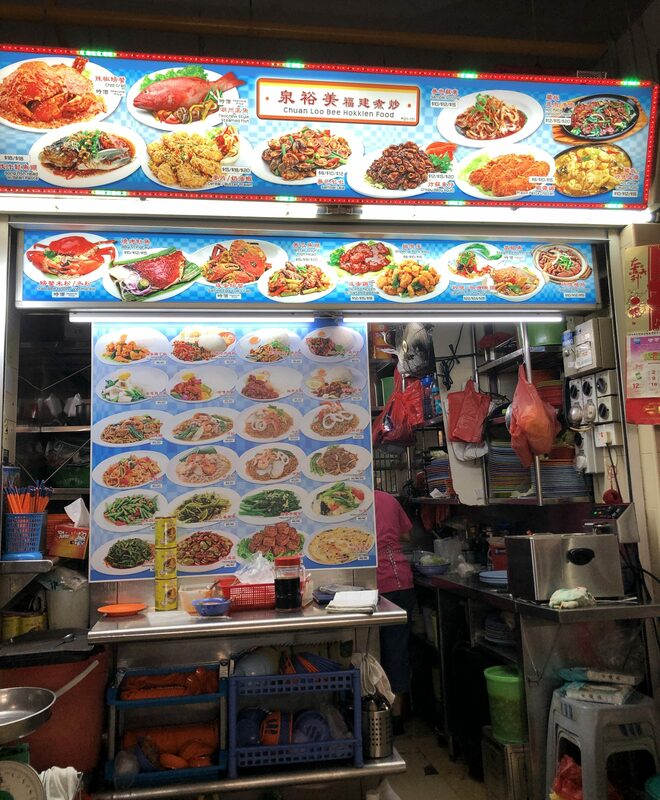 One stall I have also tried is Jun Yuan House of Fish (69, middle left). No milk to this version, but the soup is nice and the fish is also nicely done. You can’t go wrong here. And we almost forgot (92, middle left). Simplicity. 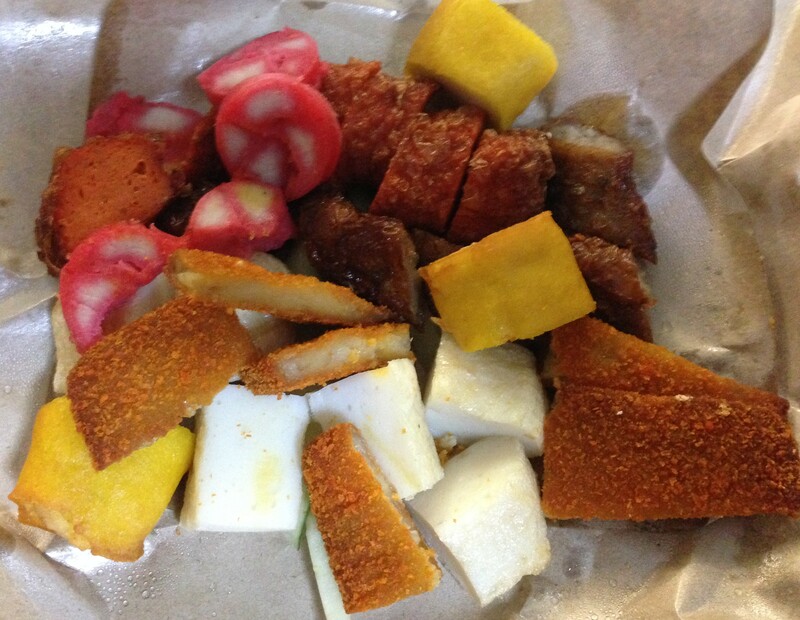 This is the special of Sliced Fish, Fried Fish and Fish Ball. Only if you need to eat. 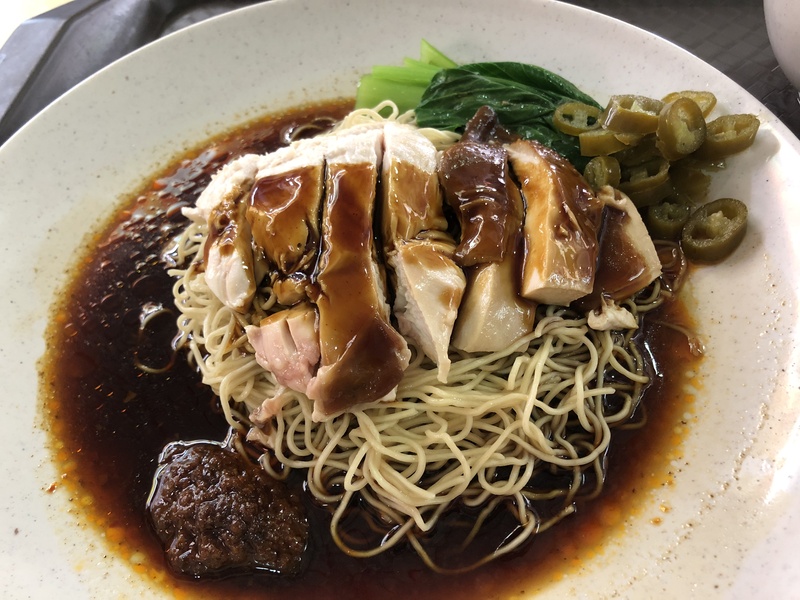 If you want more noodles, another Singaporean standard is Bak Chor Mee. At Old Airport Road, you have a two to choose from. 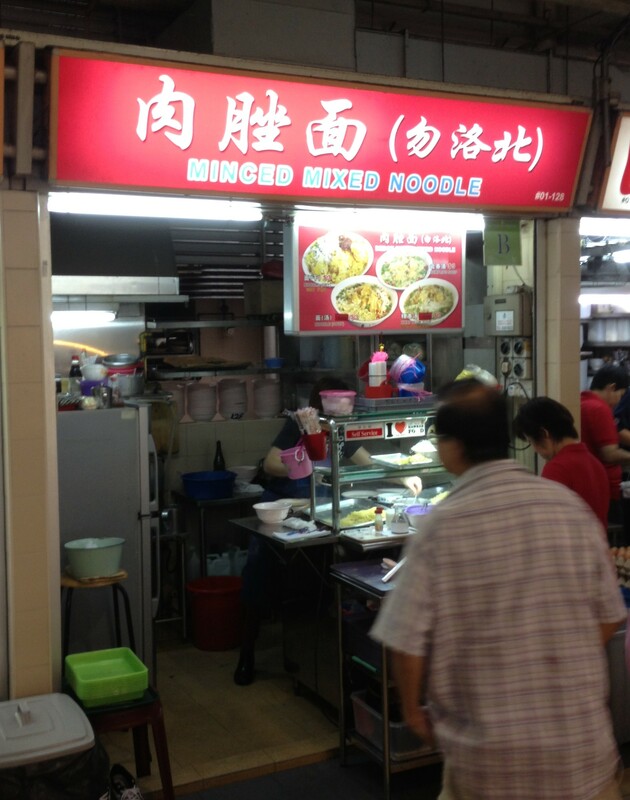 Bedok Minced Mixed Noodles (125, middle right) is the best of the bunch to me. 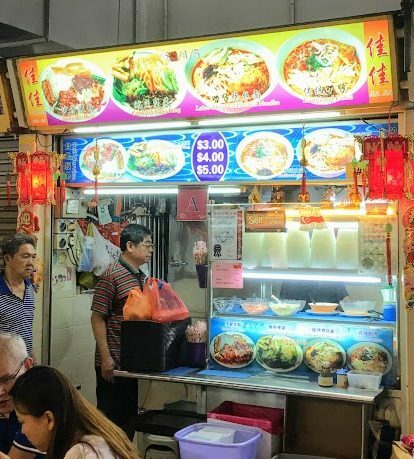 What is interesting about this stall is that the noodles are put in one bowl with the minced meat. Then dumplings are also given to you in soup. 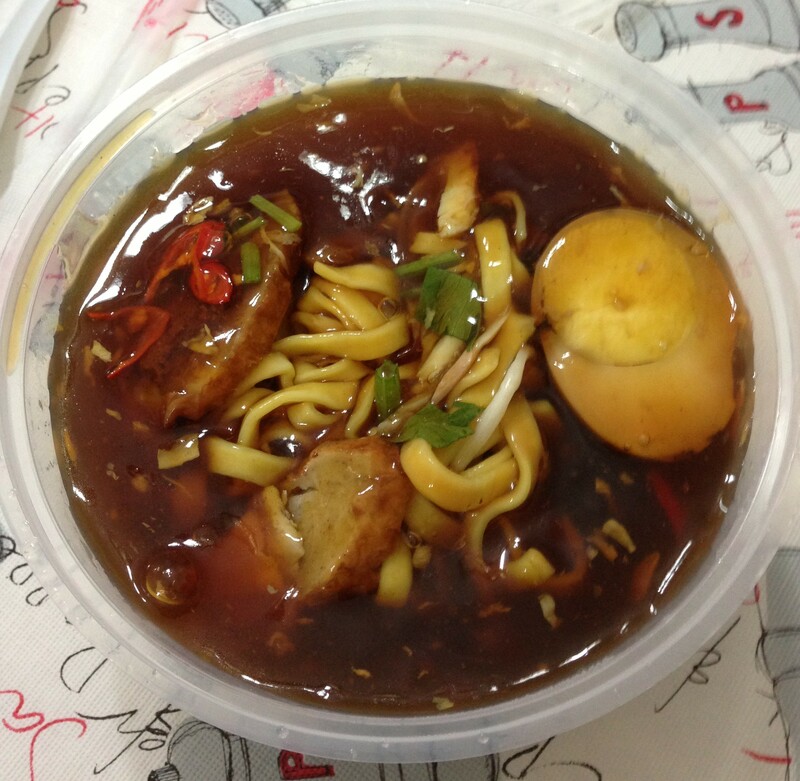 They also have the normal Bak Chor Mee, but I like this one from them. Newly opened in February 2018, this is a 24 hour noodle shop (17, left). 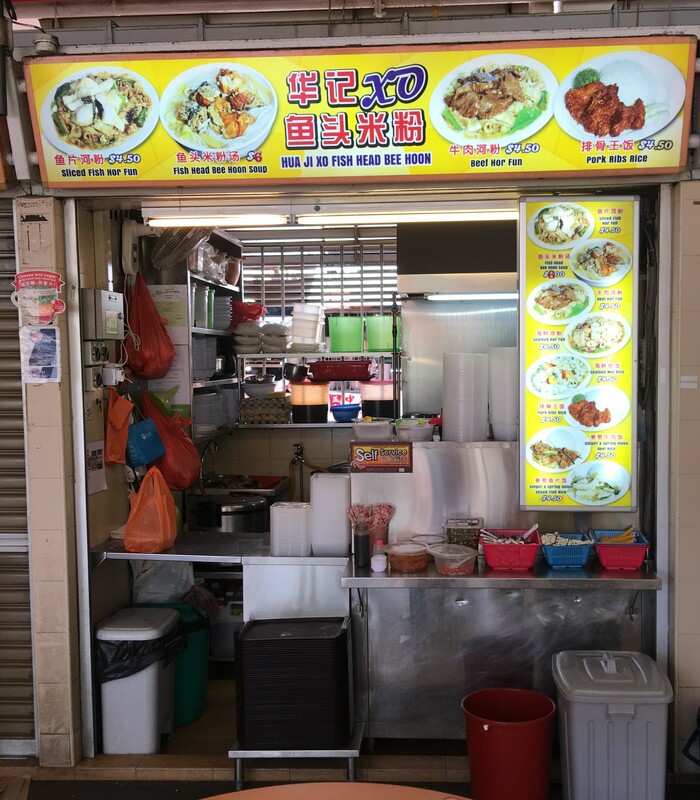 They have your Fishball Mee Pok, Laksa, and Mee Kia. 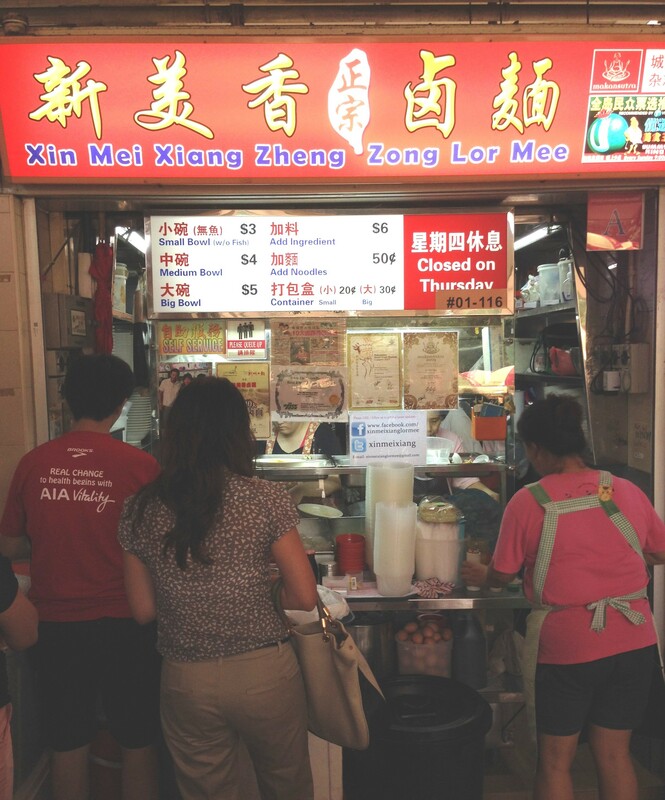 But they say their specialty is Mee Sua, which is Bak Chor Mee using Mee Sua instead of the usual Mee Pok or Mee Kia. It’s rather simple, the taste is not awesome, but it works. And if I get hungry at 3am, I can get something to eat! 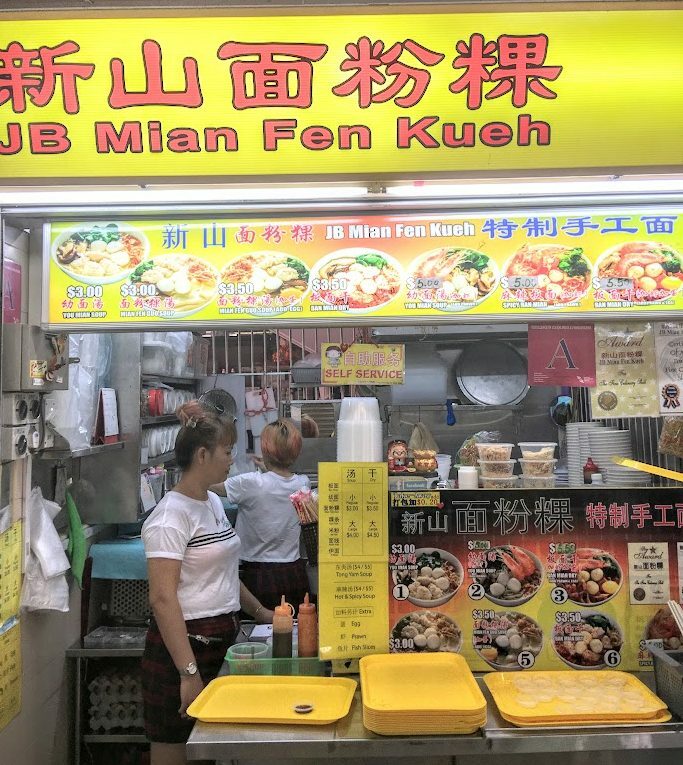 Tucked away, near Fatman and Ru Ji Fishball is JB Mian Fen Kueh (39, left). 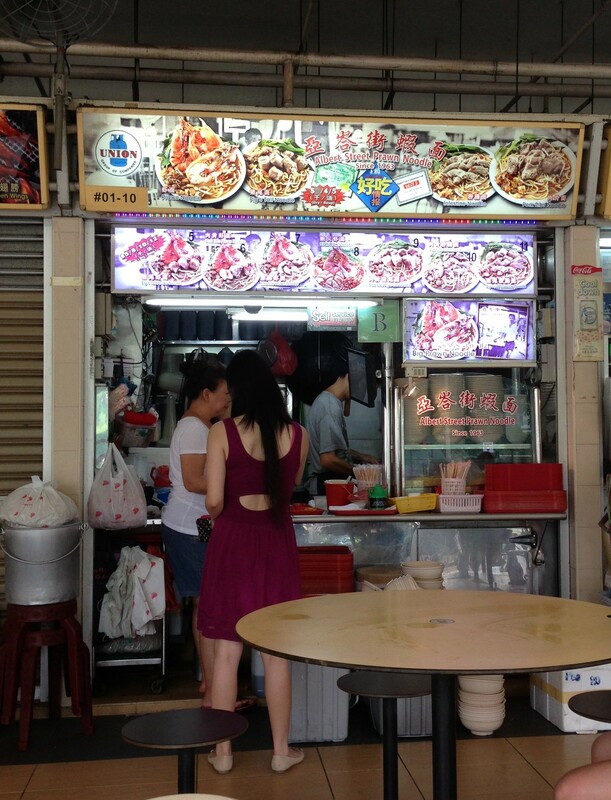 They specialize in Mee Hoon Kway and Ban Mian, both wet and dry. 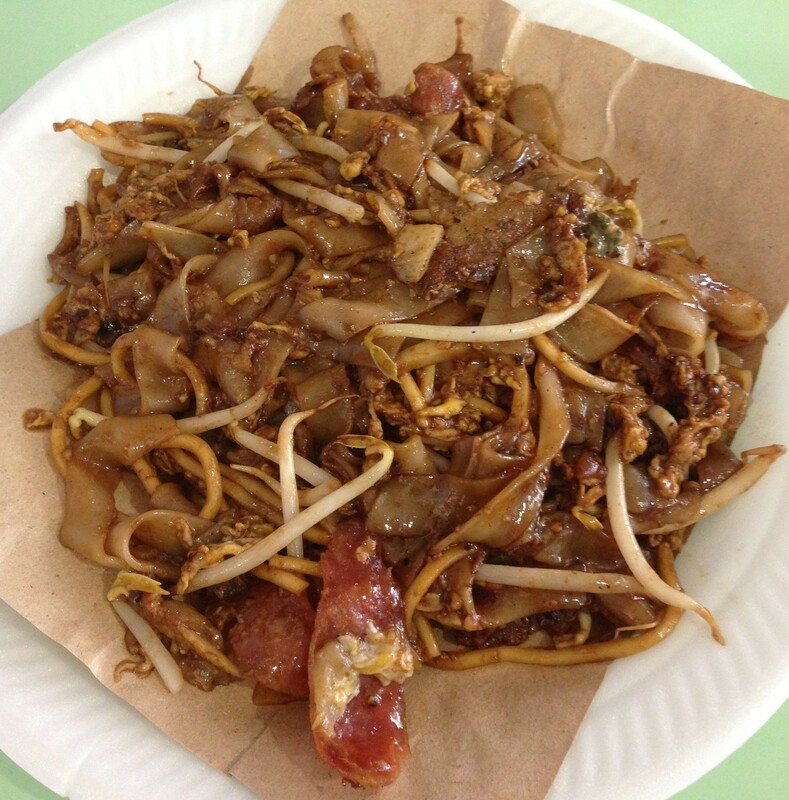 The best seller is the Mee Hoon Kway and you can tell that the Kway is homemade. It’s in quick thicker sheets, but the taste is there. And there are some fishballs in the mix, which is not the norm. A nice bowl of noodles. 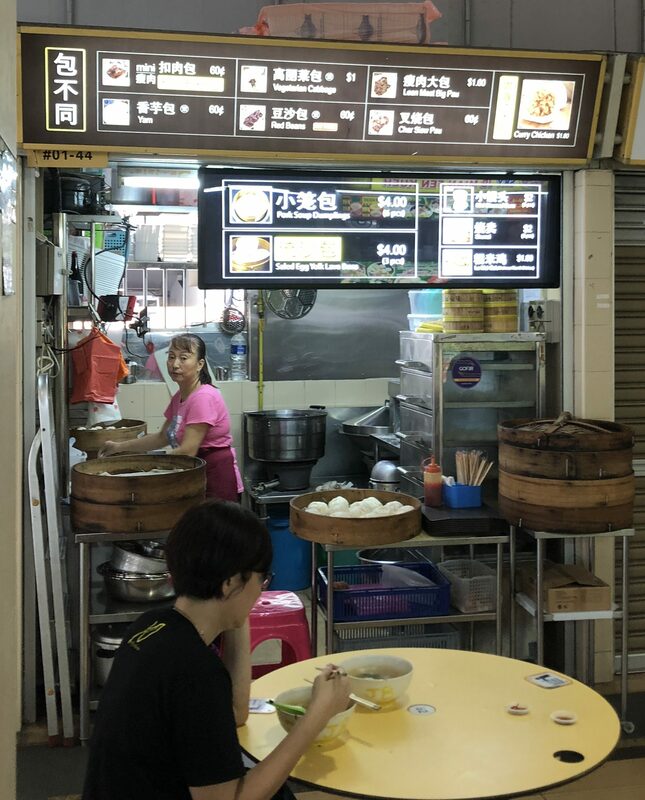 This newly opened stall in Feb. 2017 features Ban Mian and Mee Hoon Kway (30, left). 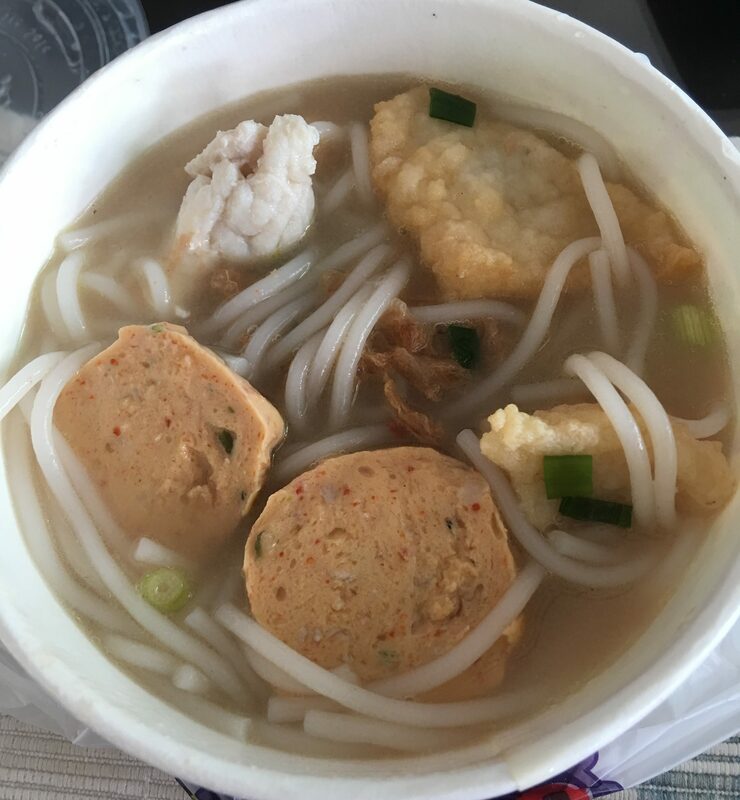 The Ban Mian is typical quality that you will find most anywhere. My biggest complaint here is that the auntie cracked the egg so hard it scrambled in my Ban Mian! It should be kept whole so you can eat the yolk! Now you also have QuiRong (01-51, middle left)(NOW CLOSED). It also has your standard Ban Mian. The interesting one here is that it has Sliced Fish Ban Mian. Interesting. Then there is also Meng Kee (102, middle left), right on the corner in the front. This draws a nice crowd as well too, and it only opens at 6:15pm. 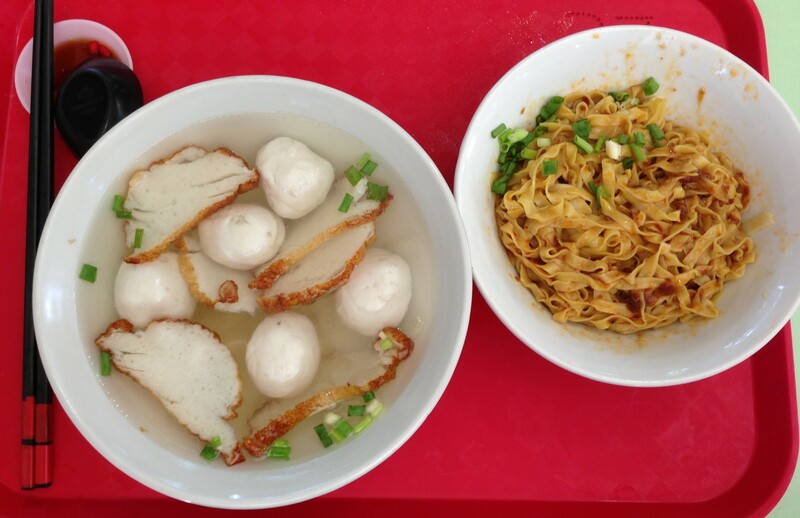 Here is their Teochew Fishball and Meat Dumpling with Mee Pok (in this case). 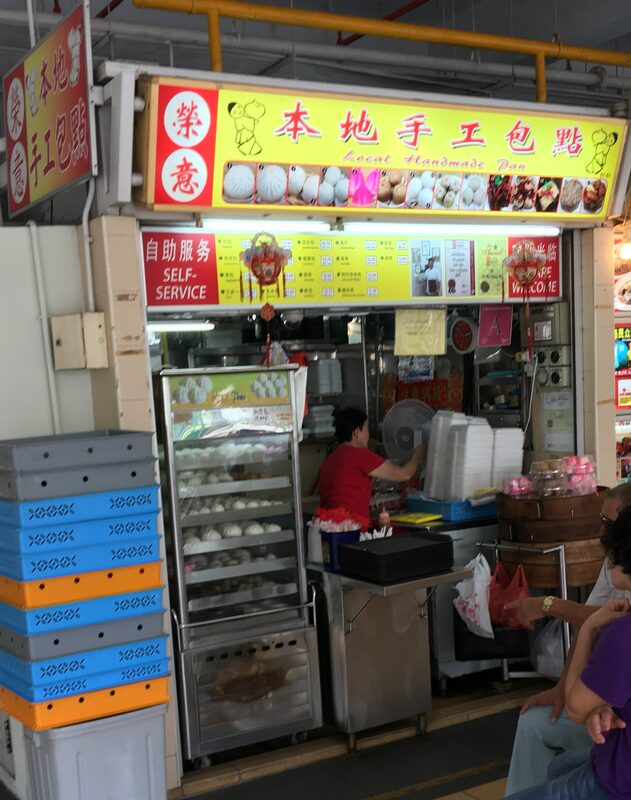 As with Teochew Fishballs, there is a meaty center. I am not quite sure on this for me, but there are people whole love it. Me, I’m on the fence. But, the taste is nice. 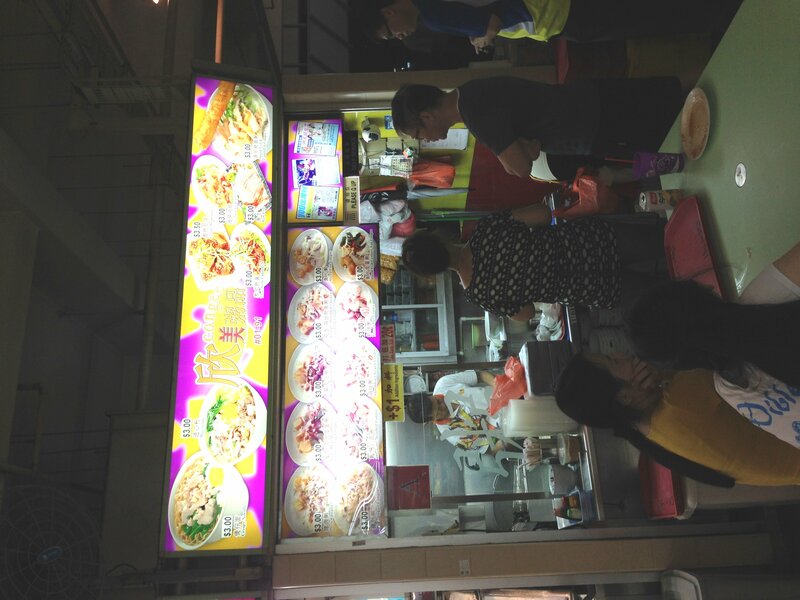 Then you have this stall which sells Laksa and Satay Bee Hoon among other things. 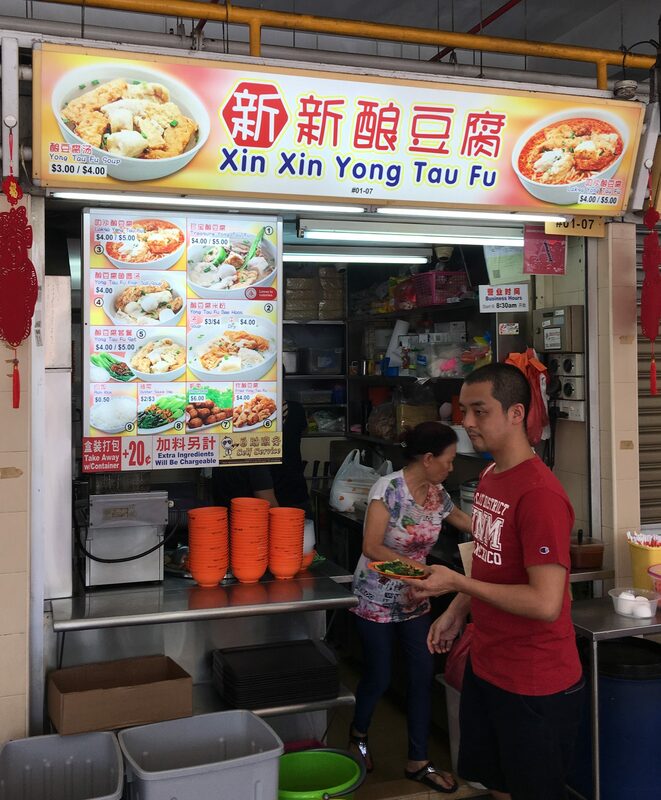 Another staple of Singapore hawker centres is Yong Tau Foo, or some other variation on the spelling. You have Choose-Your-Own style and Set styles. Both are represented at Old Airport Road. Wang Lai (68, middle left) is the old school traditional style. They open around 12-1 in the afternoon and offer a real good deal on the Choose-Your-Own style. Items are still relatively cheap. 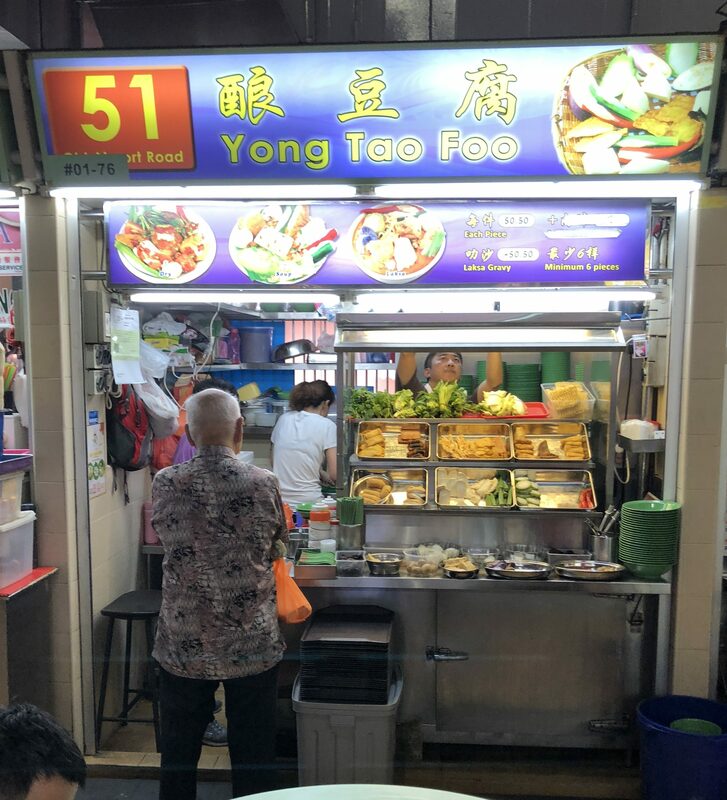 But the couple has retired and the stall has closed as of March 2018, leaving Old Airport Road without a Choose-Your-Own YTF. Xin Xin (7, right) also offers sets in the Yong Tau Foo fashion. Here I go for the dry version, where it’s all in one bowl with their red sweet sauce which has a kick of chili. The taste is ok for me. 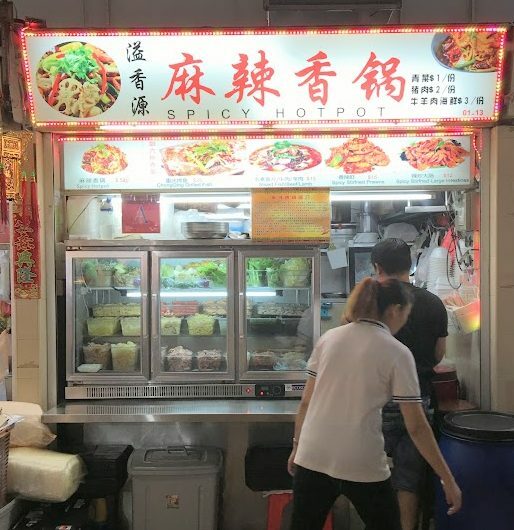 If you want to mix thing up, you too can join the Ma La HotPot craze that has swept Singapore, as in 2016 Spicy Hotpot opened at 13 (left). I can’t say that it’s me, but a lot of people sure love it. How about Beef? Or more specifically Beef Noodles. 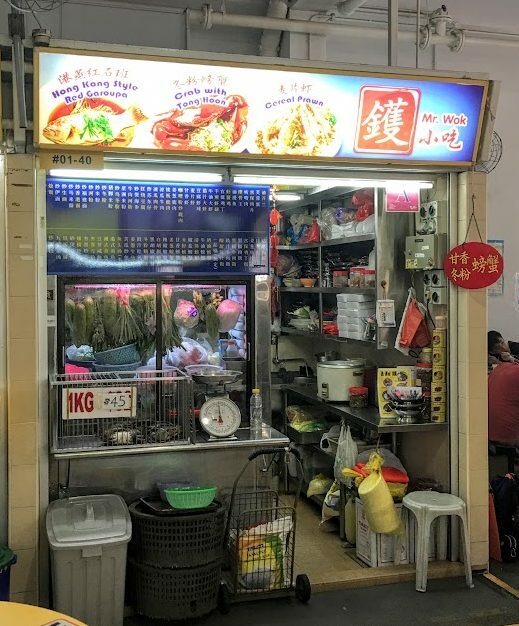 You don’t find a lot of beef in hawker centres, except for these kind of stalls. 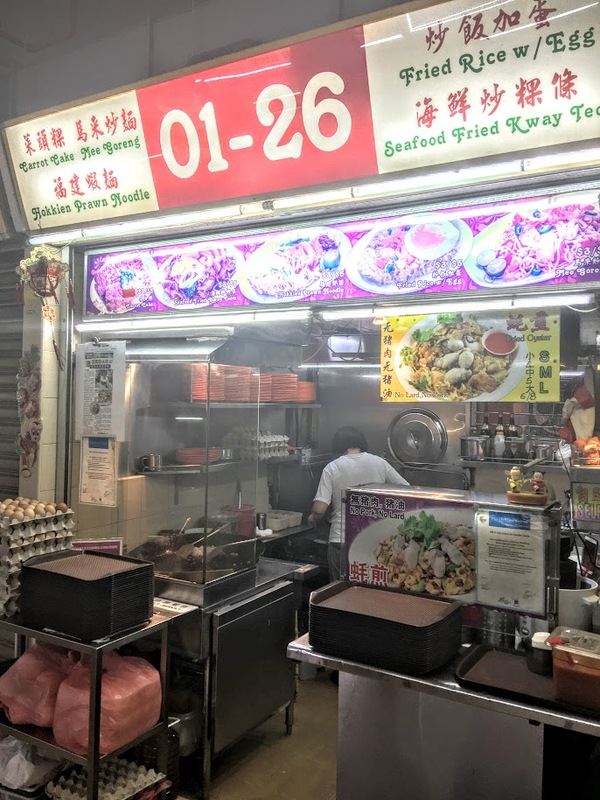 Just opened on January 31, 2017 is a branch of Hock Lam Popular Beef Kway Teow. (22, right). The original stall was set up in 1921 and passed down to two brothers, who are at war with each other. They each have a Hock Lam stall (Far East Square and then on Canal Road). 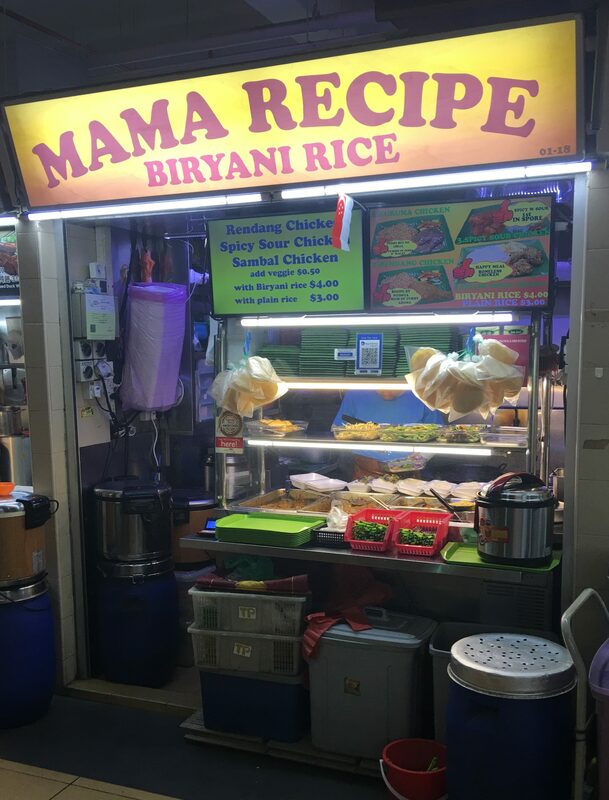 This stall is set up by Francis Tan, who set up the Canal Road stall, for his son. There were a lot of people queuing who remember eating there since they were young. The menu is the same. This is number 6, the mix. Flavorful and nice. 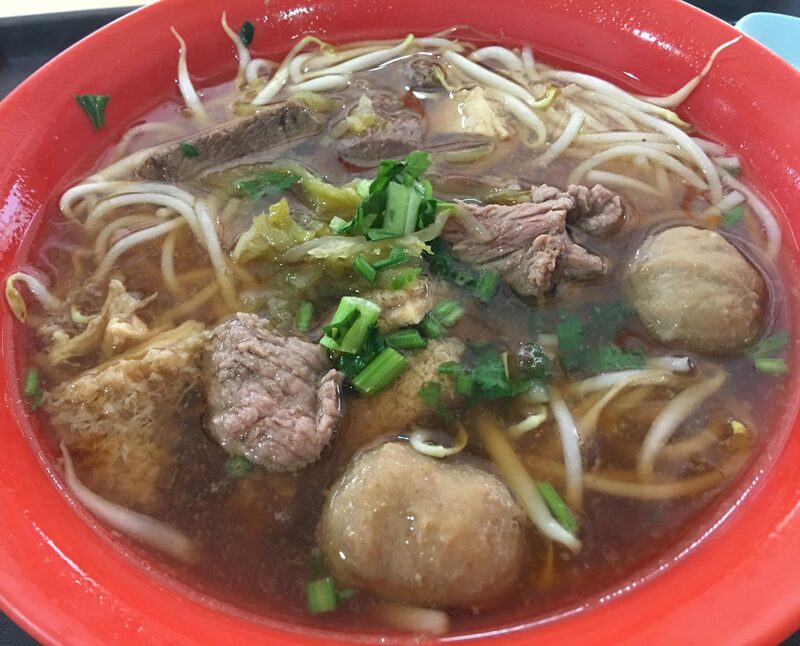 It’s a nice bowl of Beef Soup. There is also J&J (162, right). What’s special? Well they specialize in Braised Beef Noodles. The Beef is braised and is so tender and soft. 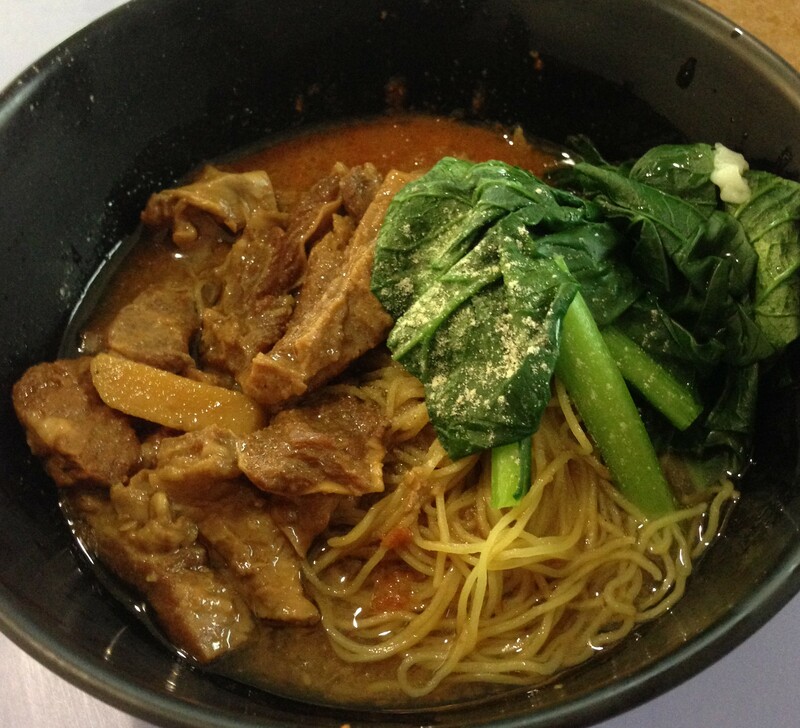 Unlike normal Beef Noodle stalls where they use fresh flank or meatballs or tendons. This is slices of braised beef. Stir it up and you will find Pho type noodles in there. The sauce is quite nice and the beef is so tender. Quite a different Beef Noodle experience. 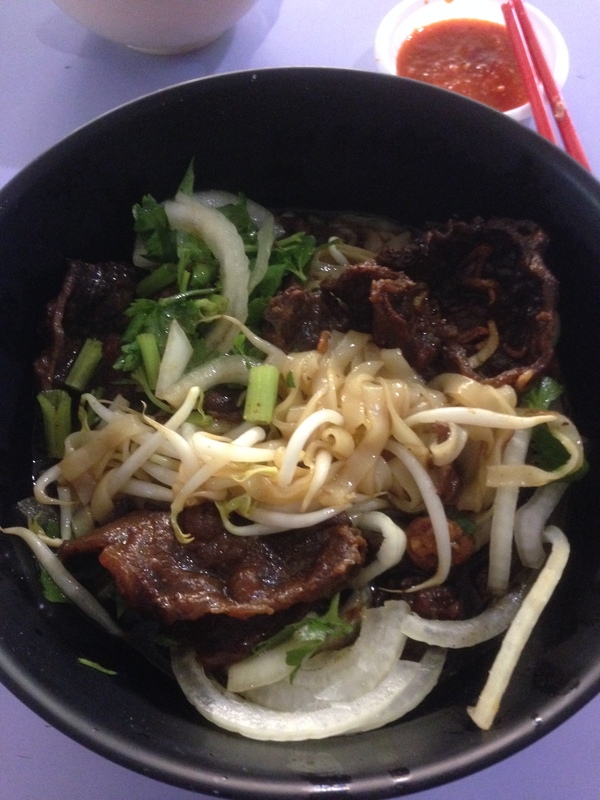 Then they also have another specialty, their Hong Kong style Beef Brisket Noodles. This one is awesome. The brisket is tender, the noodles are the HK style egg noodles and the gravy is delicious. 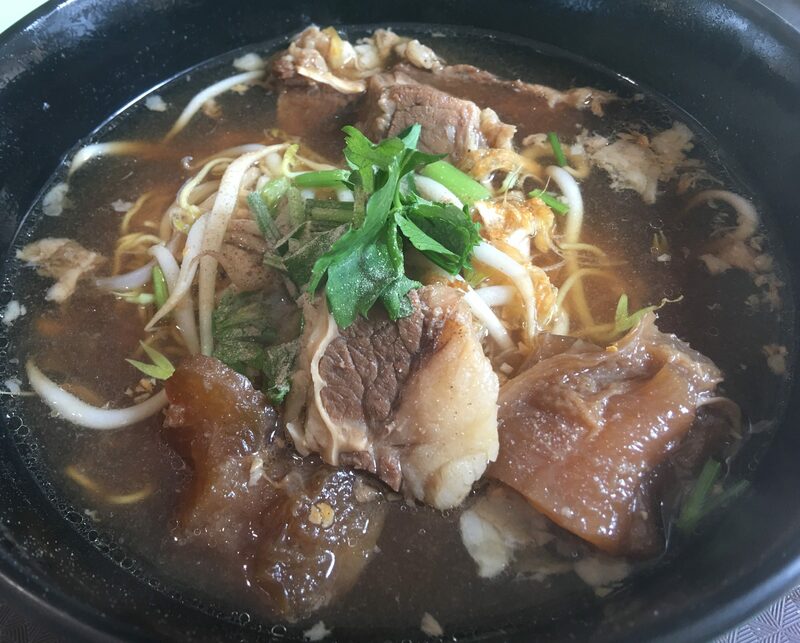 A real good representation of HK style Beef Brisket Noodles. 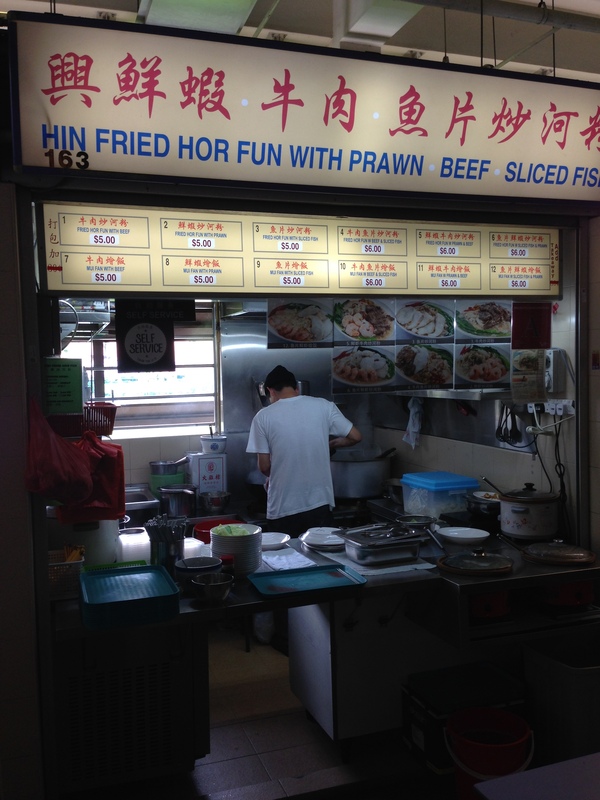 Right next to J&J is Hin Fried Hor Fun (163, right). 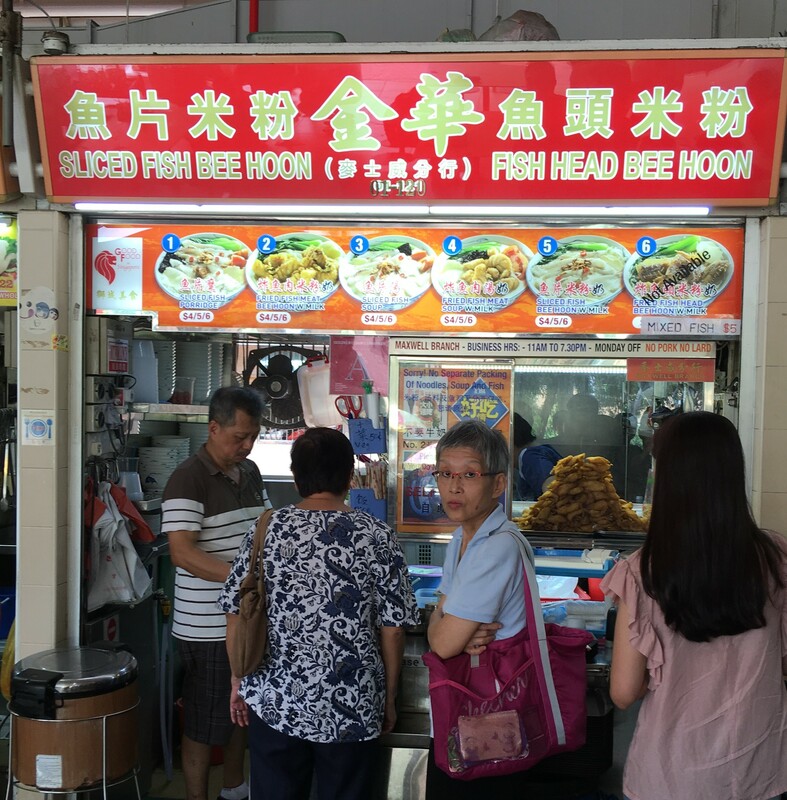 This stall specializes in Fried Hor Fun with Beef or Fish or Prawns. 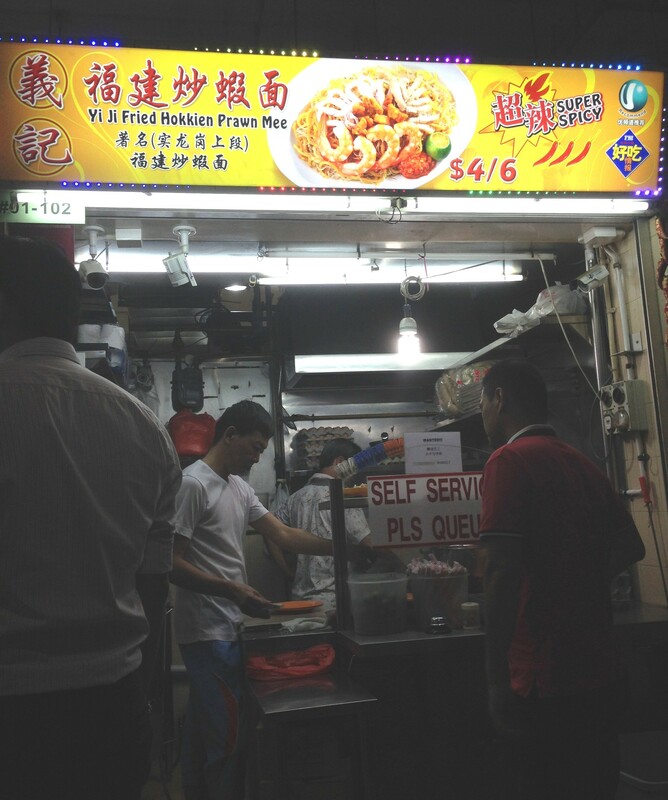 The uncle here takes once fried Hor Fun, and then fries it again in a wok. 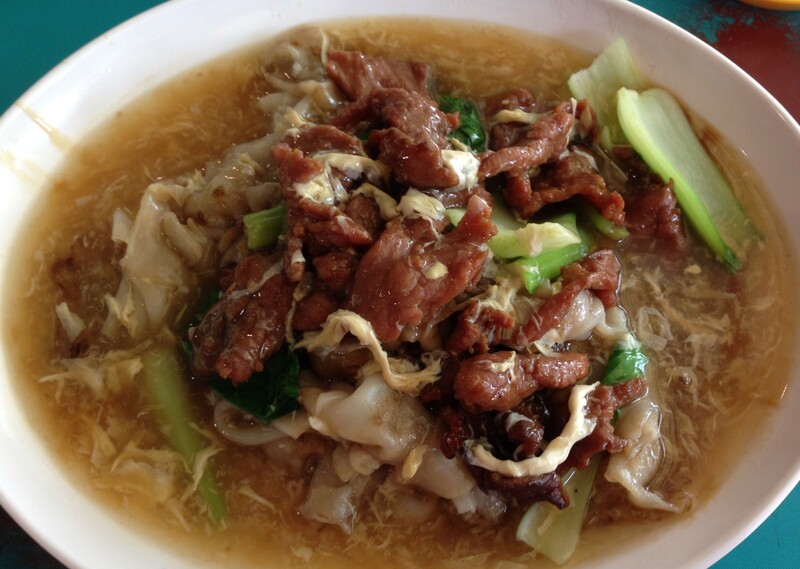 He then tops it with tender slices of beef and a beef broth with egg sauce giving one a very fragrant and tasty meal. They also make a nice Seafood Hor Fun. 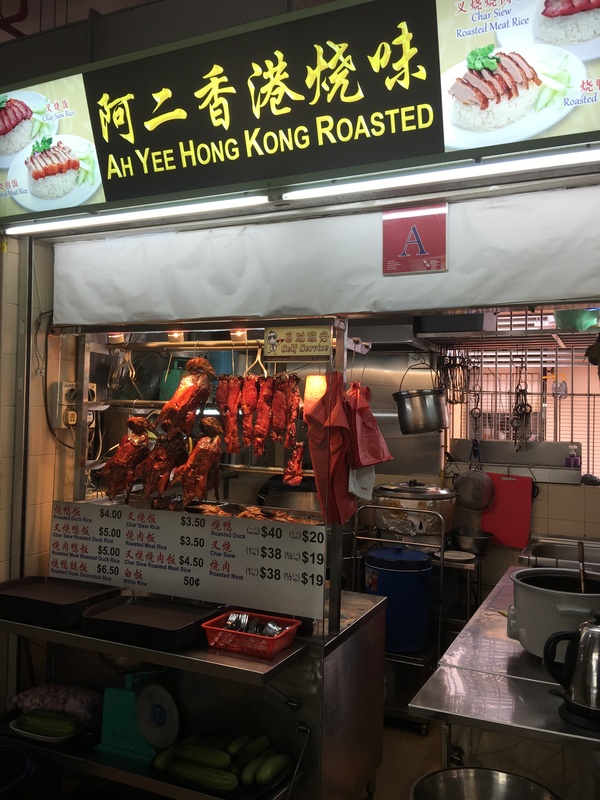 Roasted Meats are usually a big part of any hawker centre, but Old Airport Road used to only have one stall that specializes in it. Now there are a few. 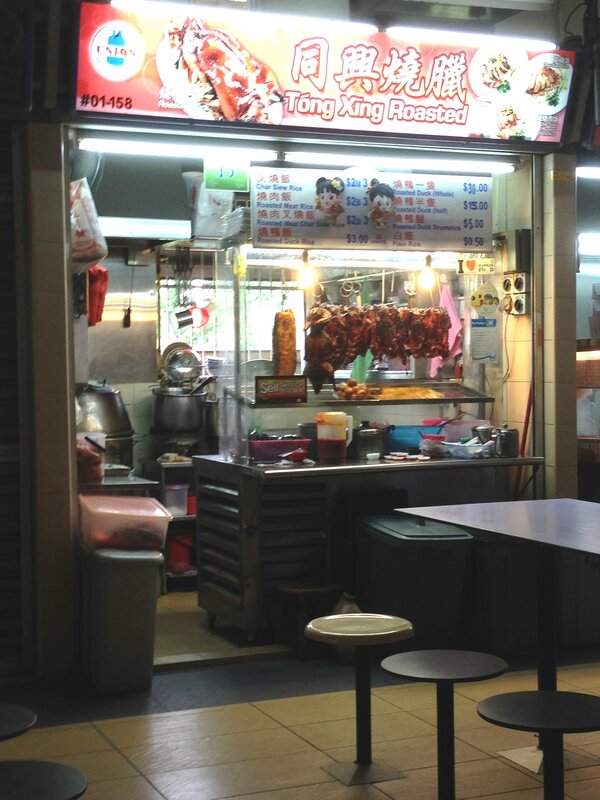 The only one for awhile was Tong Xing (158, right) and is what you would call your typical Roast Meats stall. What’s the criteria for good Roast Meats? A little bit of fat and keeping the meats juicy. Tong Xing does a decent job of that. 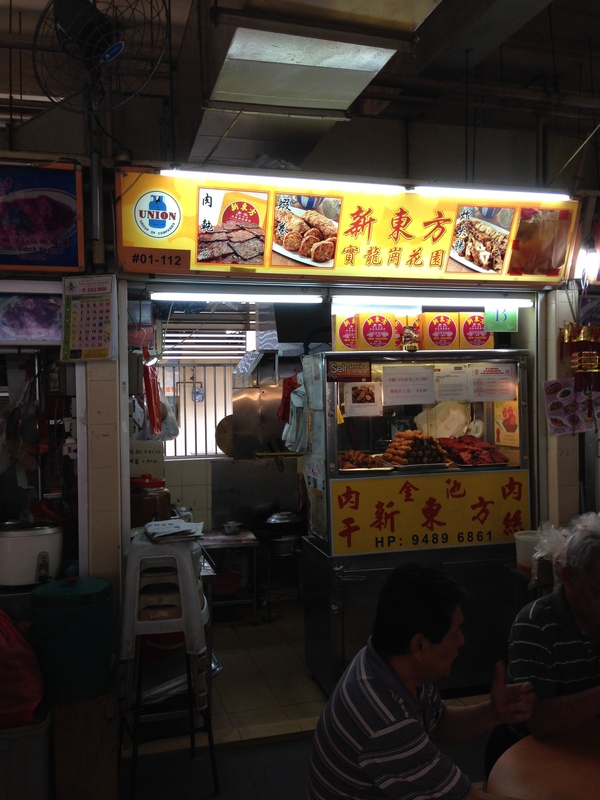 The Siew Bak is quite nice here, and the Char Siew is a little more fatty than normal Singapore roast meat stalls. My typical Roast Meats Stall meal. 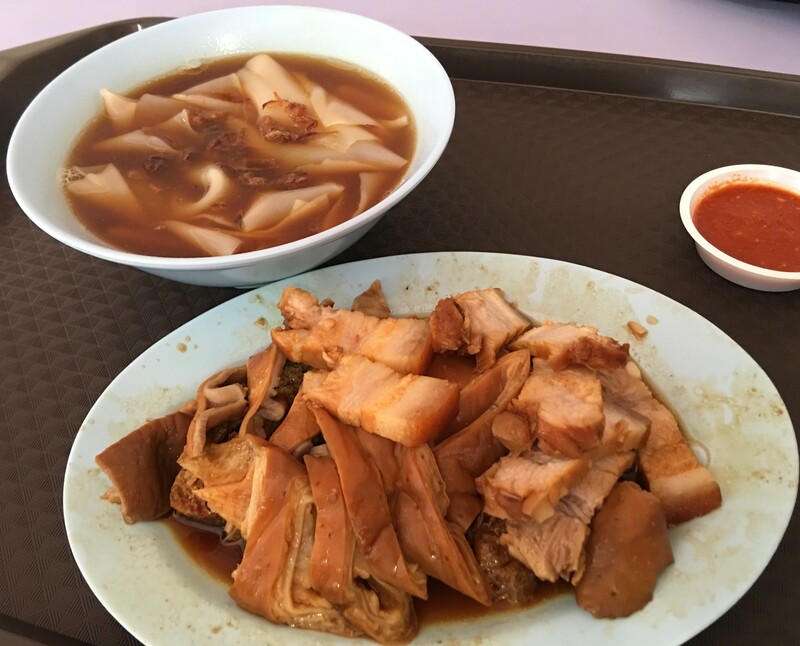 Char Siew and Siew Bak. I was not disappointed with this dish. I haven’t tried the Roast Duck, but it looks nice and juicy. I think it would also be a decent choice here. Then there is Roast Paradise, which opened in 2015. 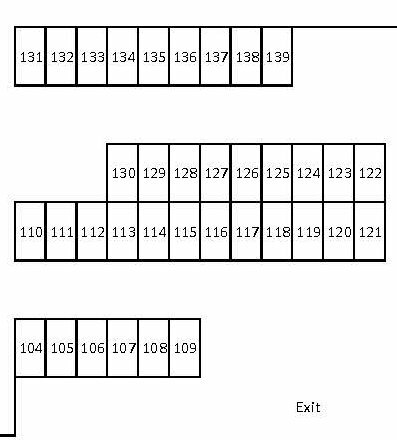 They are located at 121. 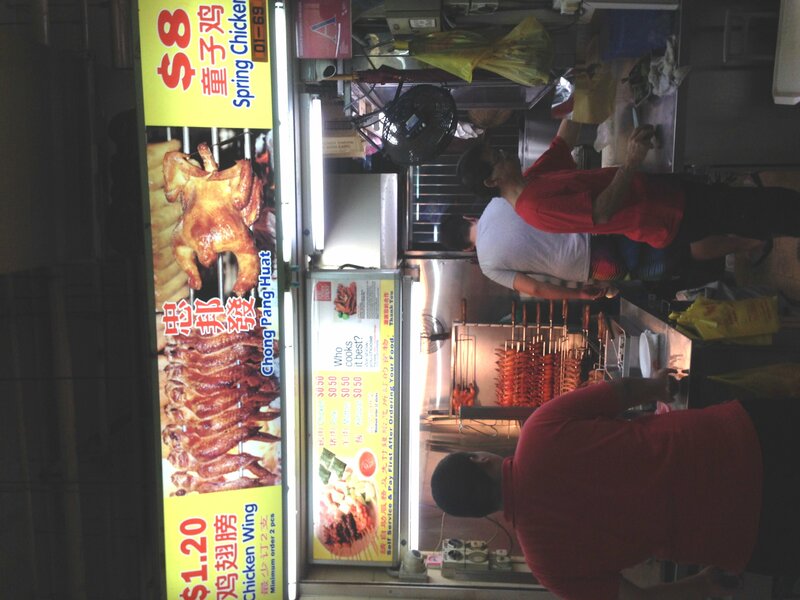 Look at the Char Siew hanging in the stall. 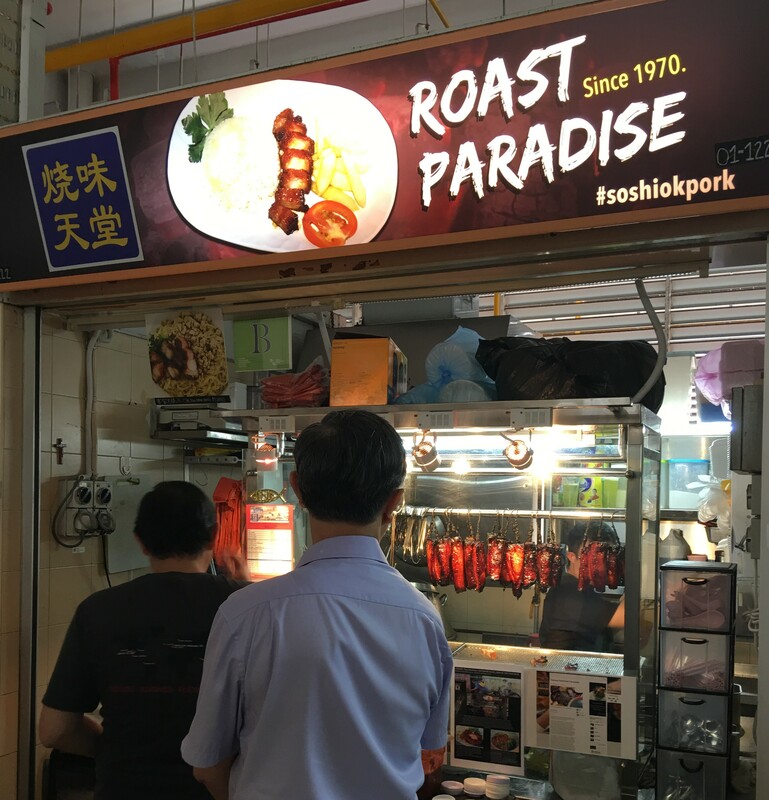 Roast Paradise says that their Char Siew is KL style, they have the oven right in the back. It is lean, fatty, savory and sweet all at the same time. 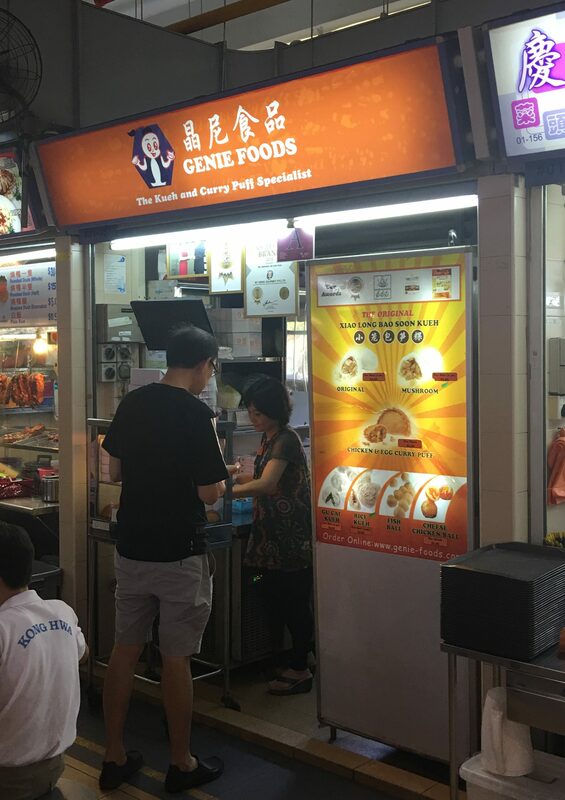 They sell it on Rice, or on Hakka Noodles, and you can order it by the kg. 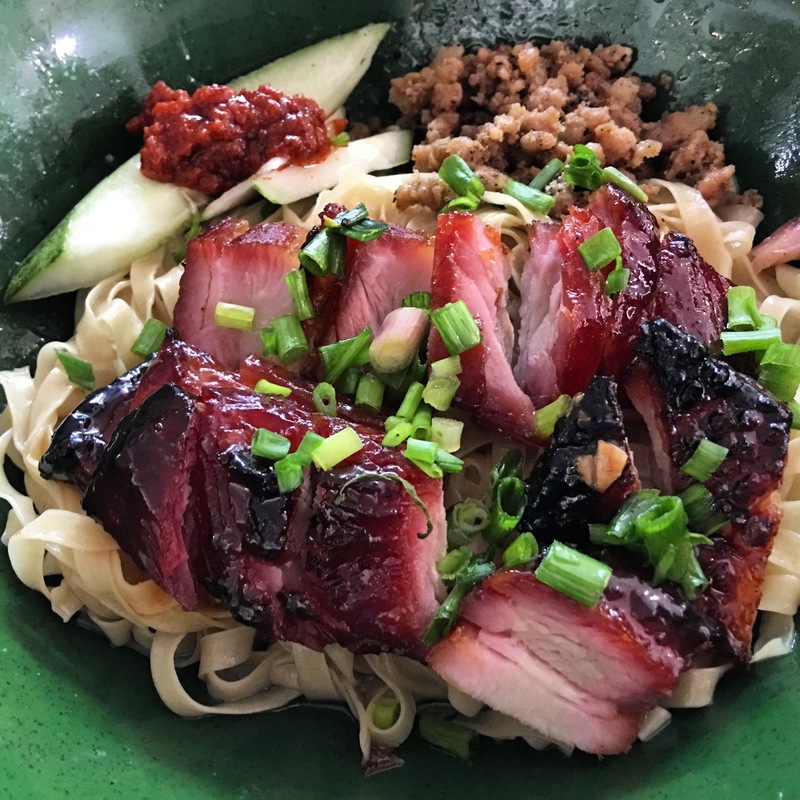 Here is their Char Siew Hakka Noodles. 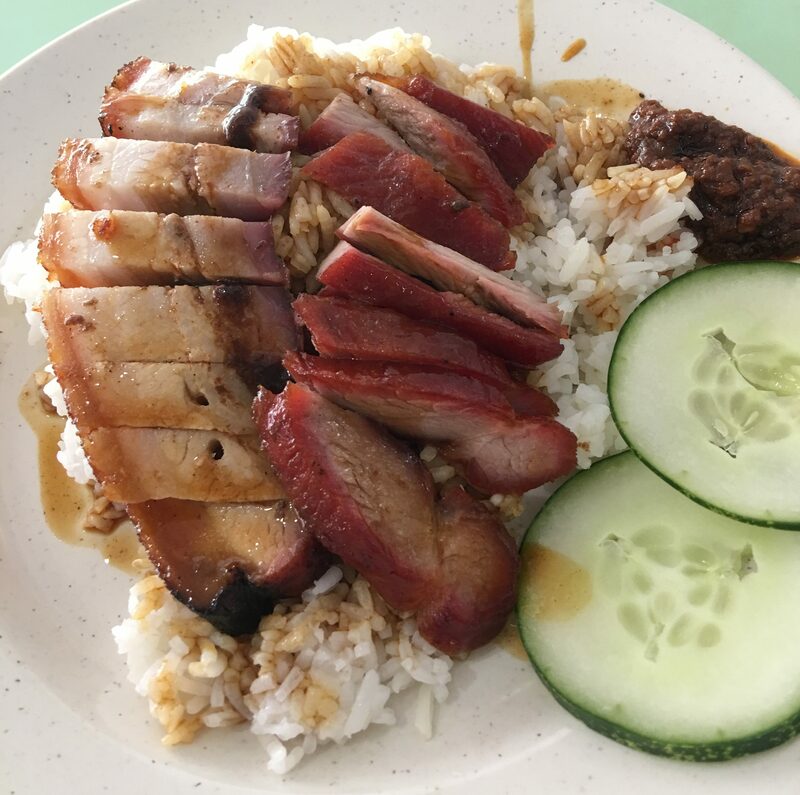 The Char Siew is lean and has some fat, you are asked if you want lean or fatty Char Siew when you order. 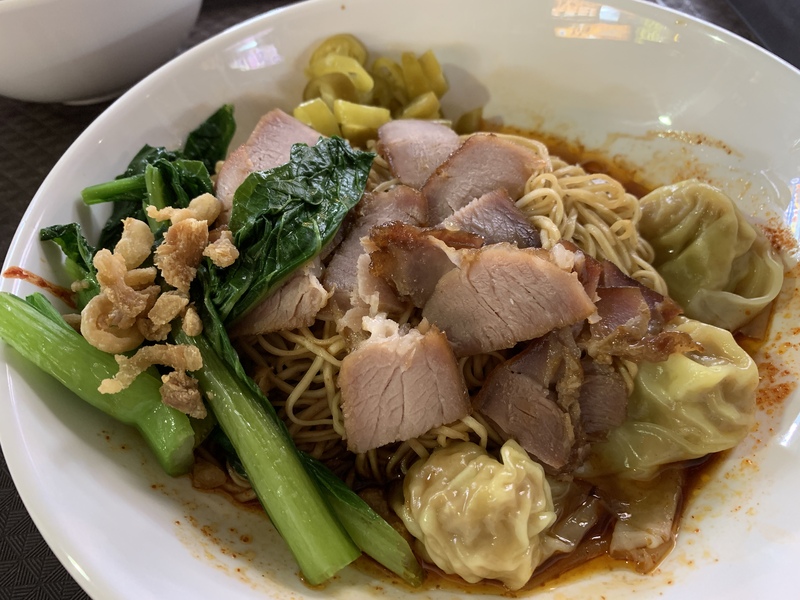 The noodles here are Mee Pok instead of the normal Mee Kia, and it plays nicely with the minced pork and sauce that goes with it to make Hakka Noodles. But the star is definitely the Char Siew, which is pretty awesome. 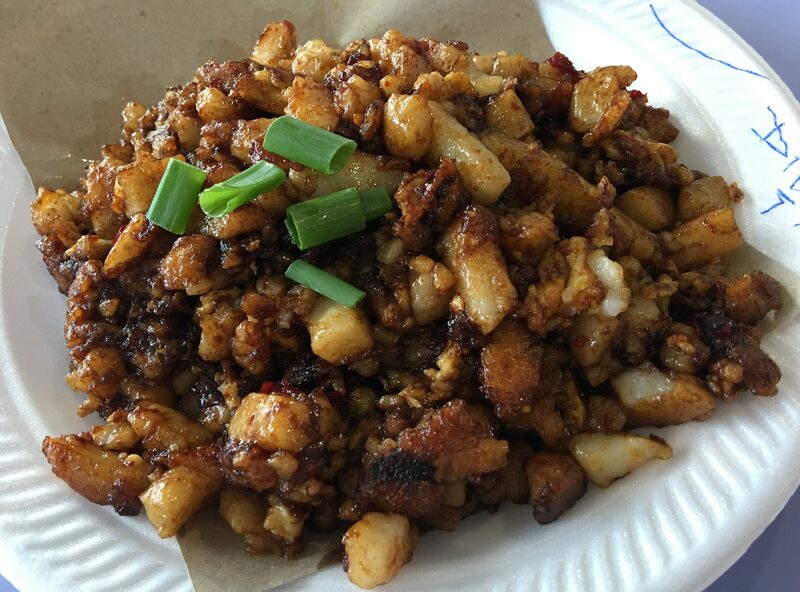 They also offer Siew Bak, which is also awesome. 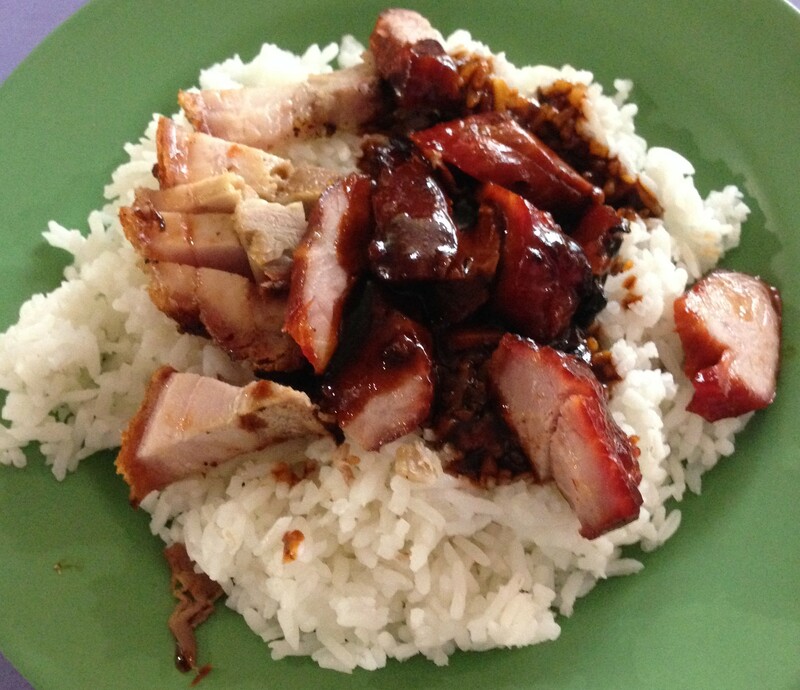 It’s also plated with rice, here is the Char Siew with the Siew Bak on rice. It is just as good on rice as in the noodles. It’s so good, you have to eat it again! The price list, definitely get there. 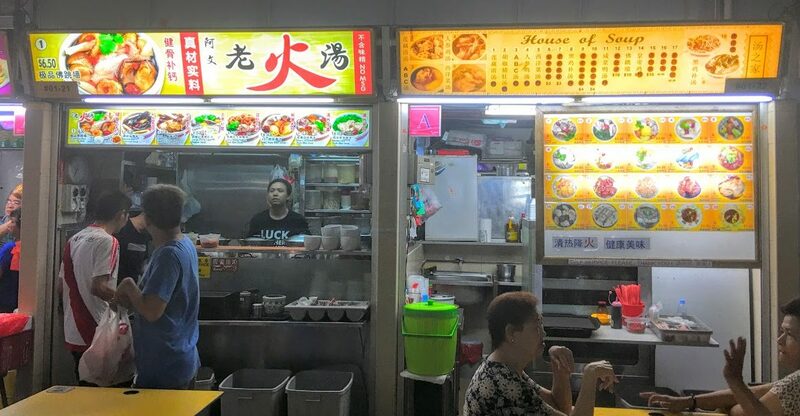 These guys do it right, they’re the part of the rising young Hawker stars in Singapore and deservedly so. They know have a second branch in Ang Mo Kio. There is also Ah Yee Hong Kong Roasted (left center, 77). In the afternoons when it’s quiet you can see the uncle preparing the meats for roasting. Quite interesting. The taste is your normal style. It seems a little higher in quality than some other food courts or coffee shops. It will definitely wet your whistle for Roasted Meats. 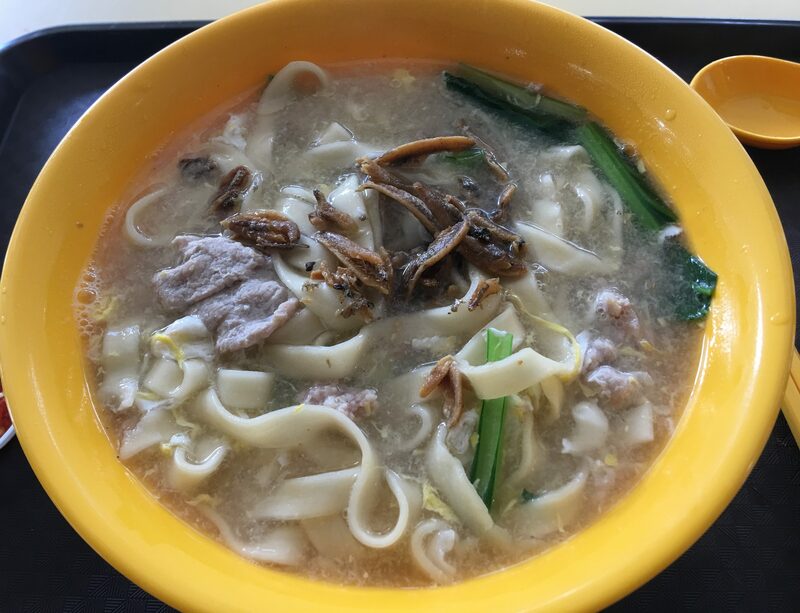 There is also Hougang Jing Jia Mutton Soup (123, middle right). This is located back towards the Blanco Court Kway Chap. And, as is the case with Mutton Soup, is quite fragrant once you get near. This is not for me, but there are good queues for it every day. 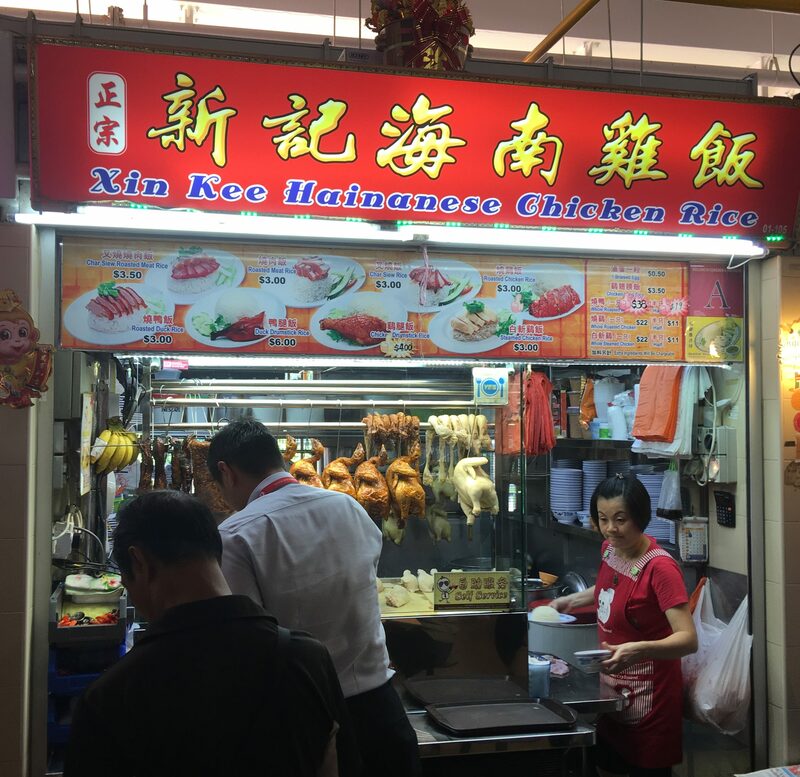 If you’re into Chicken Wings, there are a few stalls here that also can satisfy your craving for that. Chong Pang Huat (90, middle left) is a great choice for that craving. 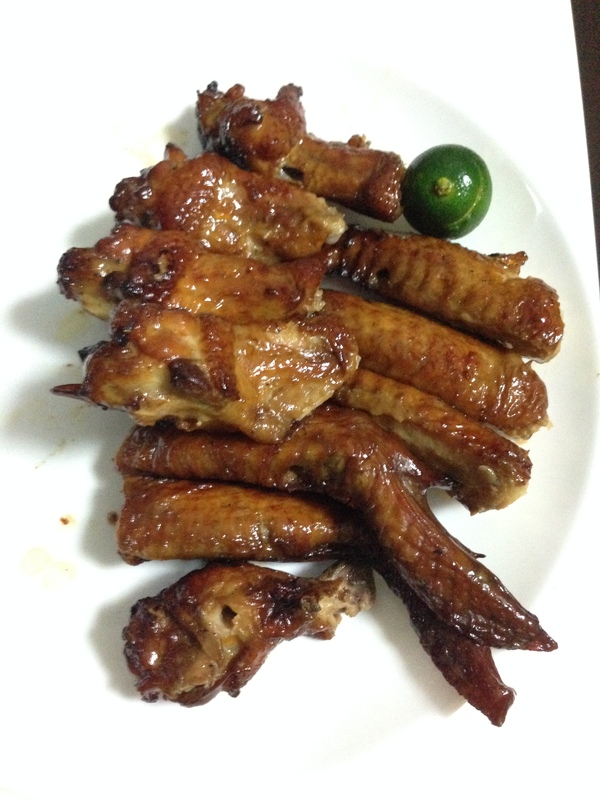 They also do Satay, but the Chicken Wings here are pretty good. I think they could be a little bigger, but they are roasted nicely and the marination is just right. They come out fresh, hot and crispy on the outside from the roasting. Sprinkle some lime and dip it in chili, yum! 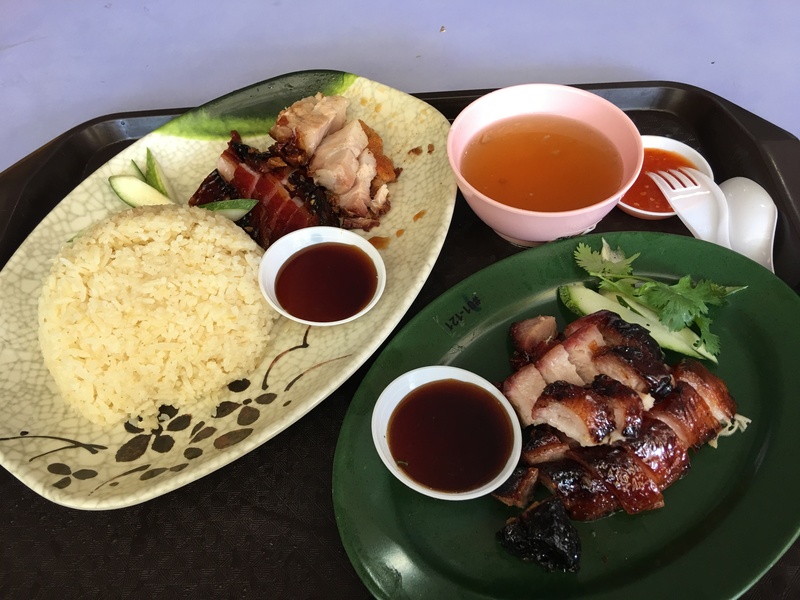 There is also Tong Kee Charcoal BBQ (24, left), which has been around for a long time. They also make a nice Chicken Wing which is done just right. Jia Long Mei Shi (55, middle left) also serves up the chicken wings and oysters as we mentioned above. Satay is also prevalent here, with Chuan Kee (85, middle left) being the master. The couple that run it have been around for a long time, providing succulent bits of meat on a stick. But be prepared to wait a long time for your order. And I do mean a long time, especially during peak hours. Order your satay first, then go around and take your time ordering other things. You can come back in about an hour to get your satay during these times. The Satay is juicy, a succulent. But to me, I don’t know that it’s worth the wait. 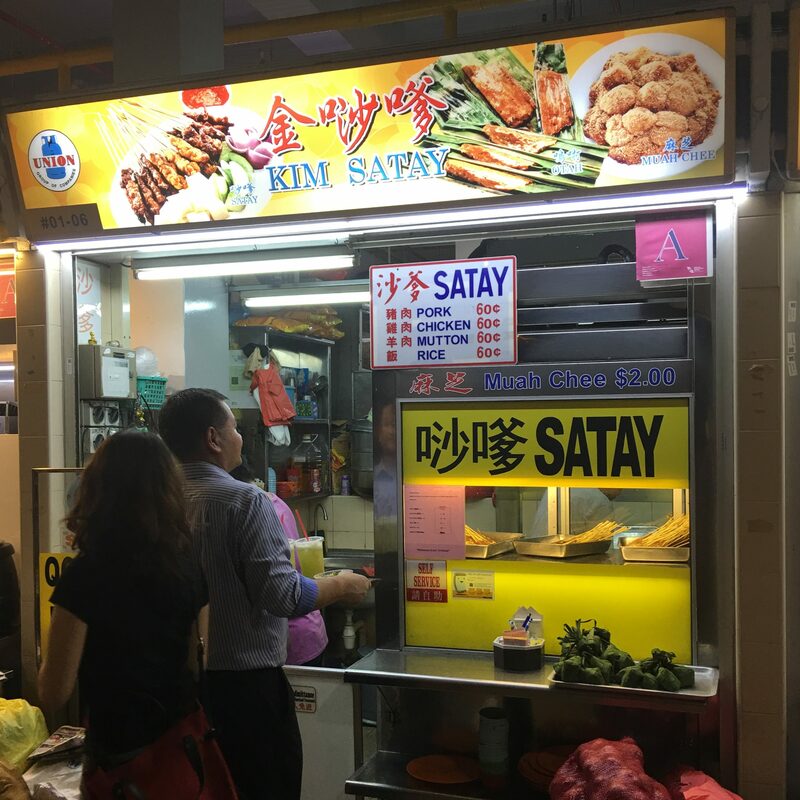 The other stalls that serve satay are also quite good at what they do. 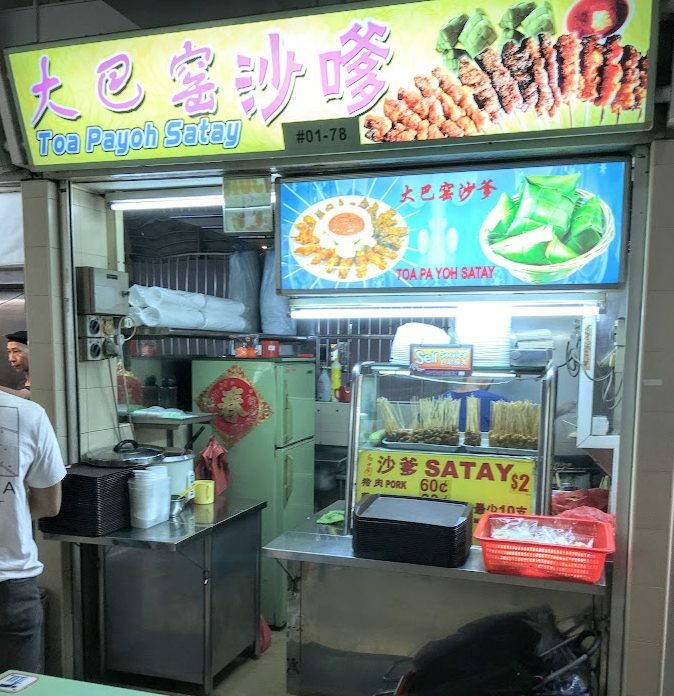 Toa Payoh Satay (78, middle left) Fu Dao (97, middle left) – do try the Black Pepper Satay here. 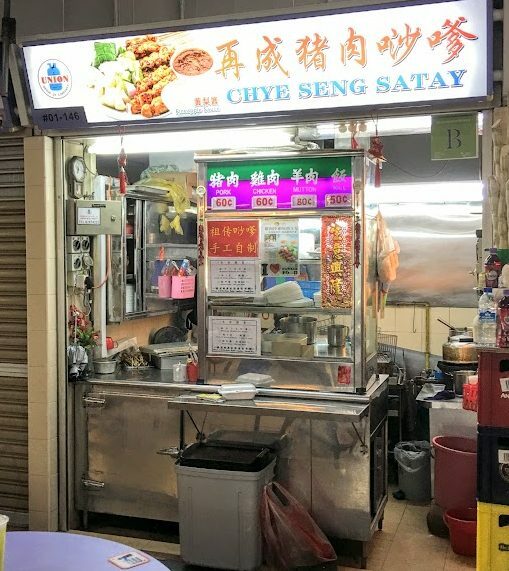 and Chye Seng (146, right) all serve decent Satay, so you can’t go wrong. If you want to try Satay Lok Lok, there’s a little stall in the back on the right side that provides this. 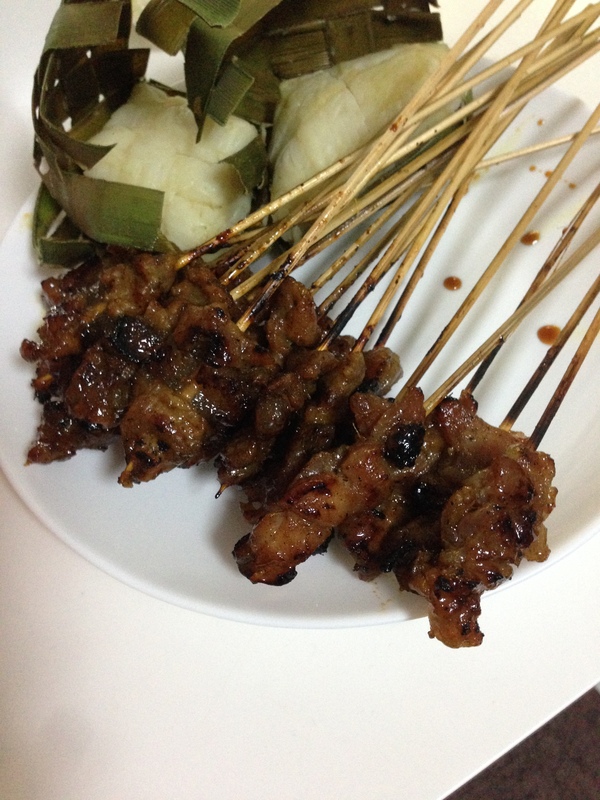 Hock Leng (141, right) serves this special style, where skewers of items are dipping in hot Satay sauce and then eaten. Worth the experience. You get a beeper to know when it’s ready. Get your Rice and mix it up! It’s really a nice bowl of rice! 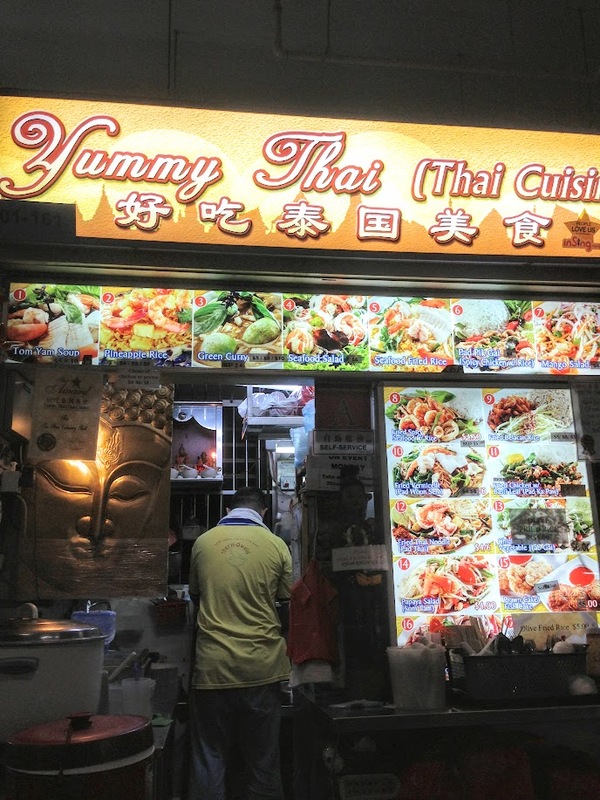 You also have a selection of ethnic foods at Old Airport Road. 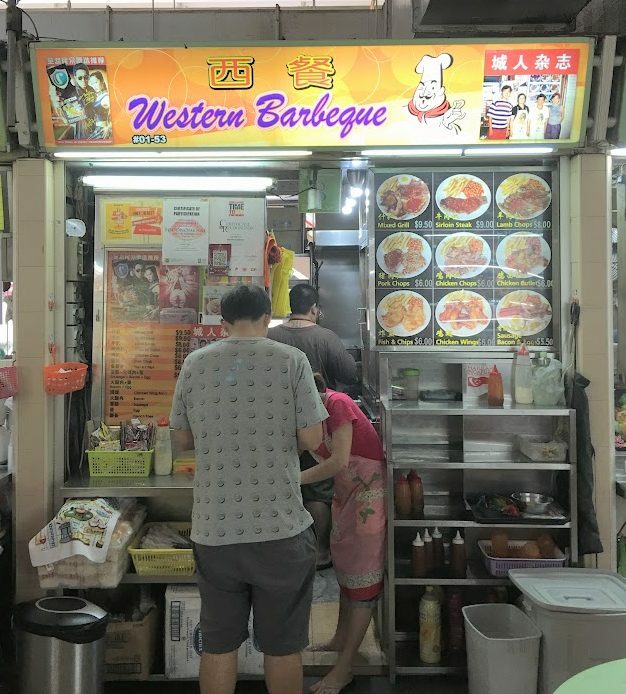 There are a number of Western stalls that serve Grilled Chops and Fish & Chips, etc. I usually don’t go to these stalls myself, as I think I can do it better, but people do love them. The pork was a little thin, but it was so crispy and the curry just nice. Very Japanese, more than Western. Thanks Mitsueki! 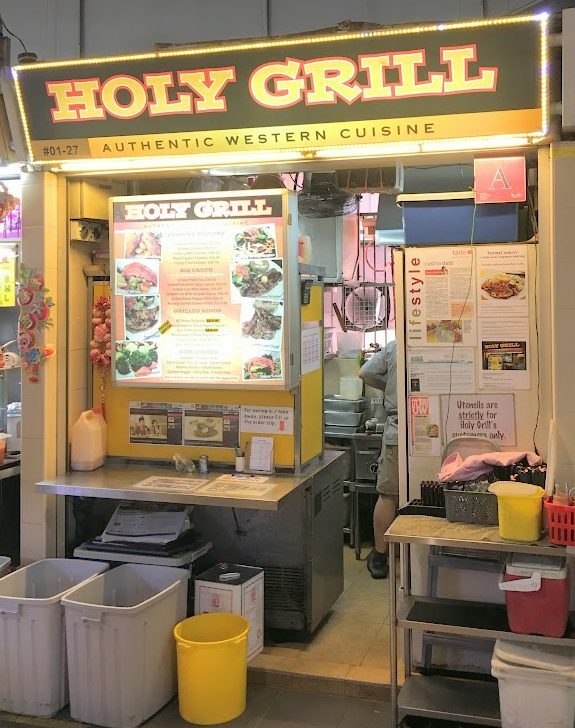 Other Western stalls are London Grill (8, left) Holy Grill (27, left) Western BBQ (53, middle left, which is EXTREMELY popular). Here the Chicken Chop is recommended. So what of the Chicken Chop? I don’t know, it’s western food, which I don’t really do. The taste was nice. I got it without the Garlic Sauce, which people say is amazing. Try it for yourself. There is now Salt, which replaced Momo (128, middle right). It looks like a lot of Western Chicken dishes. There are also a two pasta shops that do great business. I personally don’t understand it, but people love it. The one that has been around the longest is Pasta Manna (84, middle left). And Pasta Risotto (9, left) is also there and both have long queues of business. Japanese is represented by Victor’s (5, left) and Unkai (88 & 89, middle left). Both have set bento boxes and are priced decently. Victor’s is pretty standard, nothing special. 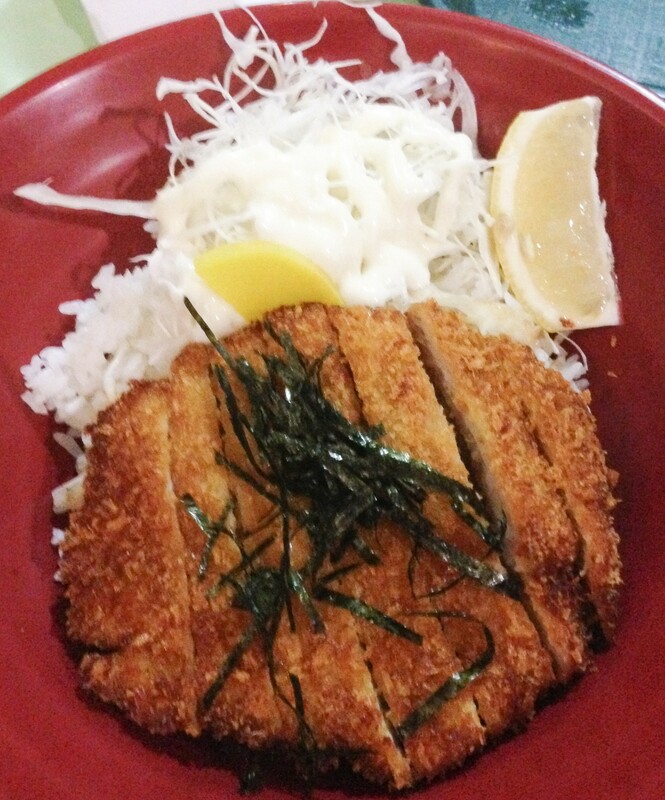 Here is their Tonkatsu, served with rice. The Katsu itself is too thin, and pretty standard. Only really hit this if you’re in the mood and can’t get to a Japanese restaurant. 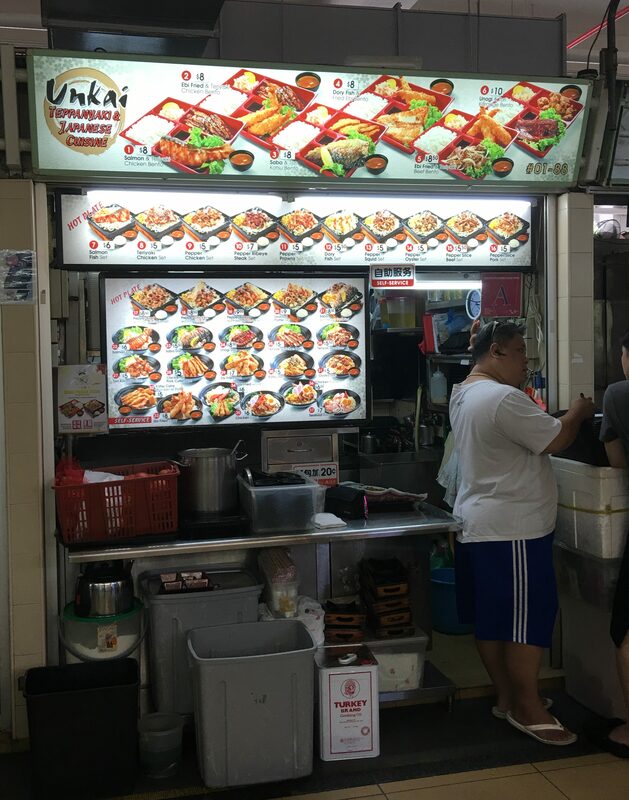 Here is Unkai’s stall, which has now expanded to two stalls. I have yet to try it though. 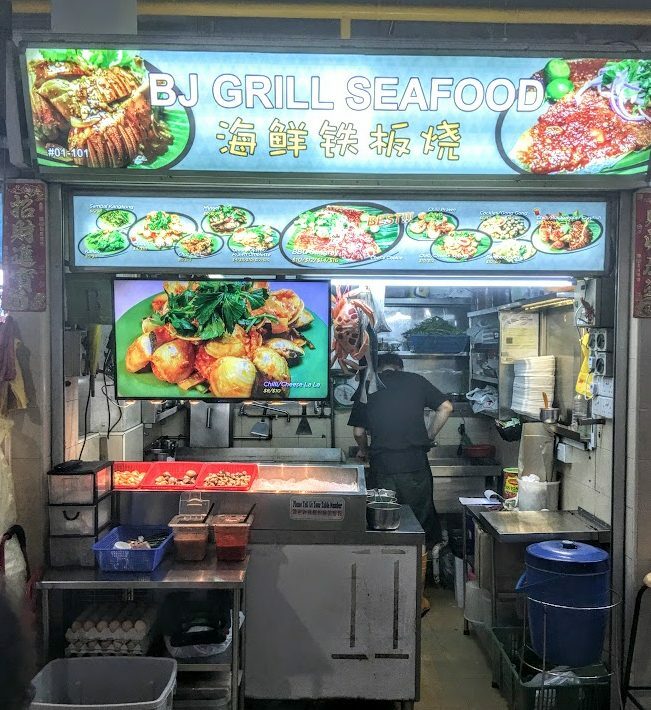 The side stall has a chiller of cooked seafood, so they do a different style, but same name. Yummy Thai (161, right) represents Thai food, and it provides one with a nice meal. You will get the simple items, but they are done quite nicely. Pad Thai is very fragrant and nicely done. 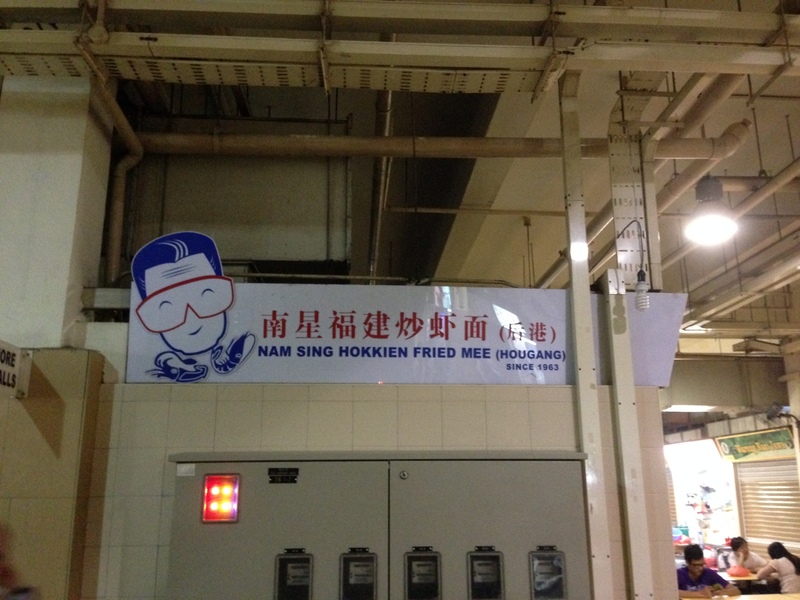 Fried fresh, the tastes are pretty authentic. The Mango salad is also quite nice. A good zip and zing, some good spices come out of it as well. Their Green Curry Chicken could use a little more chicken, but the tastes don’t disappoint. 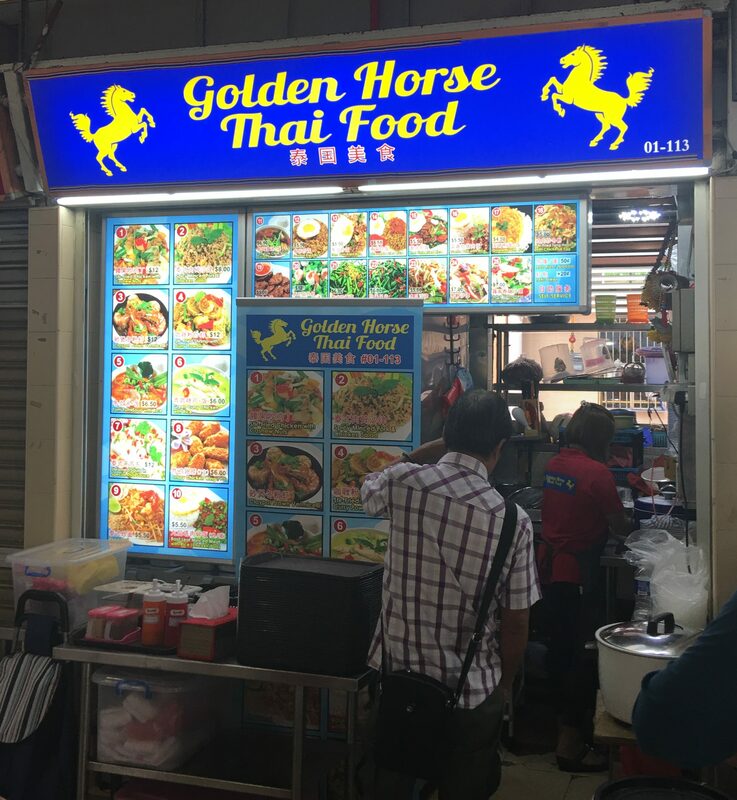 Golden Horse Thai Food replaced Maha Nahkon in June 2017, but I am not sure if it’s the same owner and rebranded or not. I’ll have to go and see. And it is not, it is a different group. Still Thai owned, but not the same. 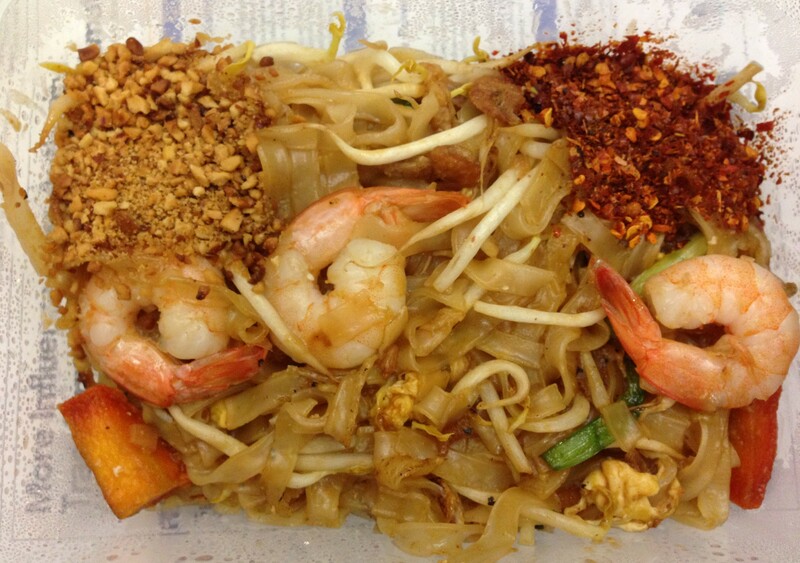 Here is their Pad Thai Different, less ingredients, but the taste is there. Not bad for a quick noodle. This is their Tom Yum Bak Chor Mee. This is the dry version. Looks innocent, but after a bit, the punch of chili kicks in and it’s awesome. Next up is their Braised Beef. You can have it on noodles (soup is better than dry) or with Rice. 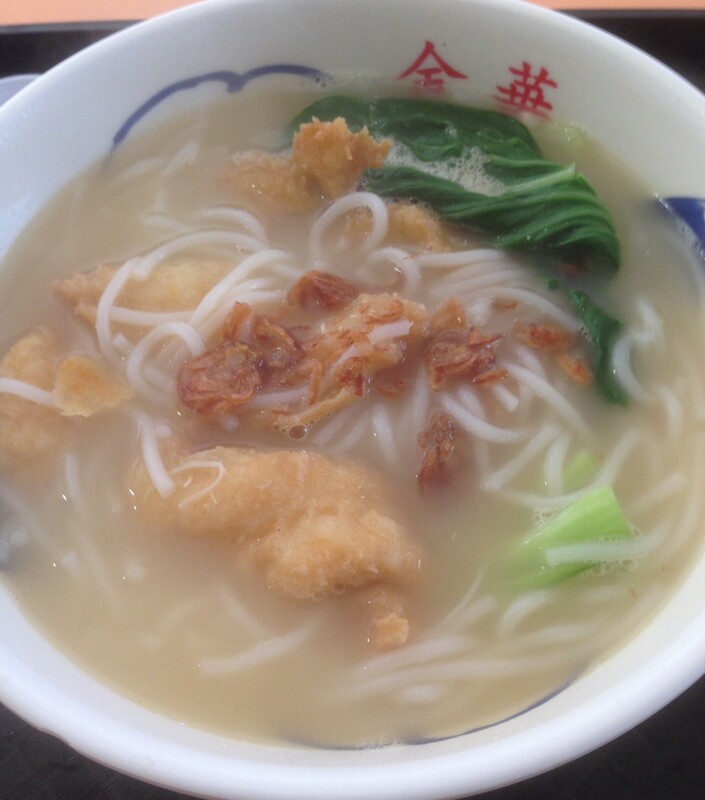 This is the soup noodle version. 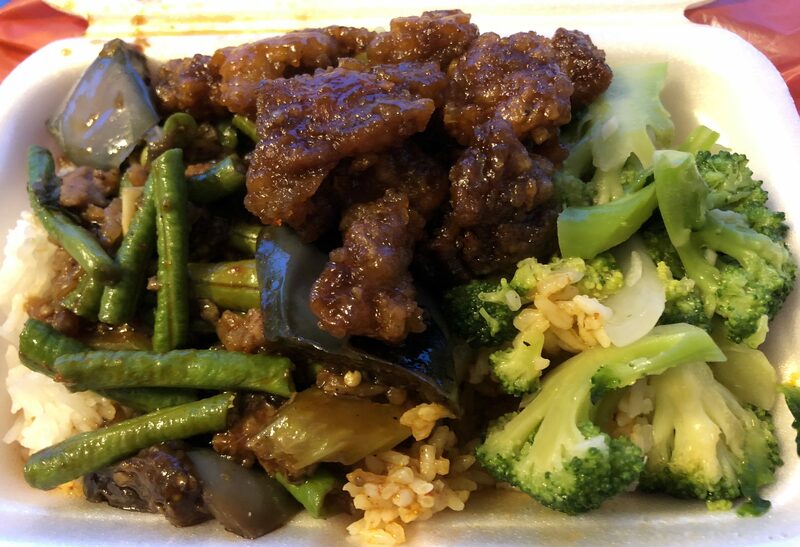 Tender beef and excellent taste – this is a winner. 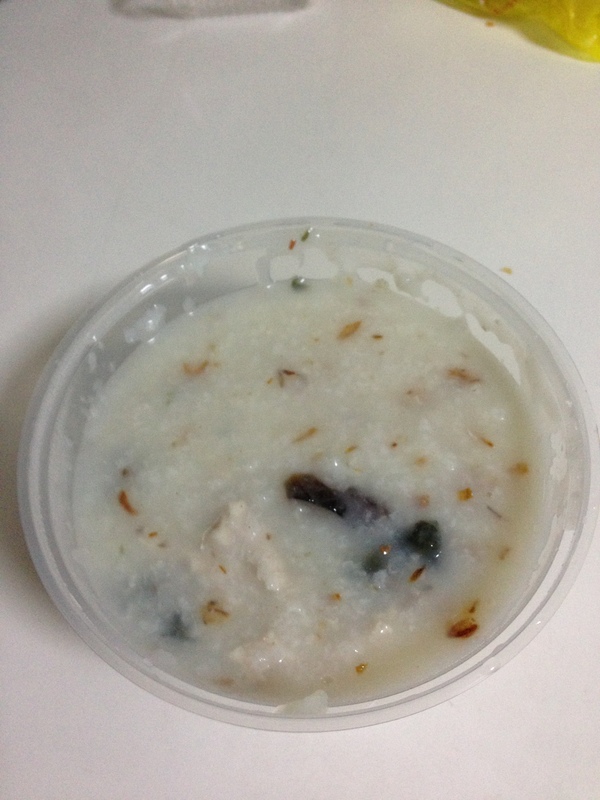 Speaking of an all day dish, Porridge or Congee, fills the stomach no matter the time. 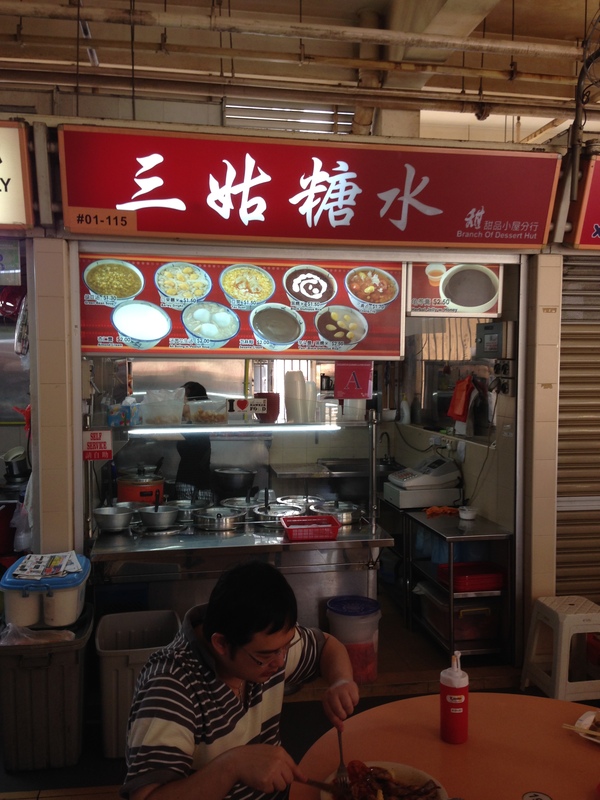 The best porridge here is from Seng Mei (91, middle left). While they are a chain, they have a few outlets, the porridge is quite nicely done. 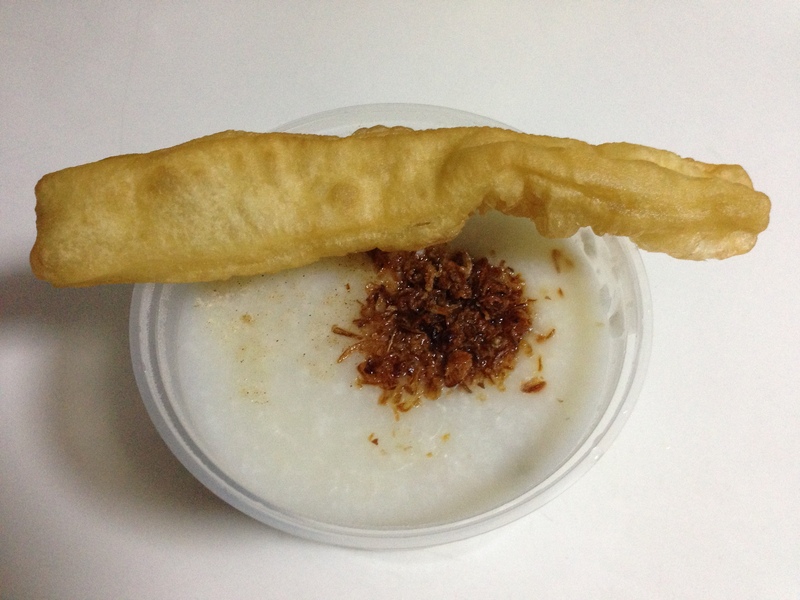 What I like about this stall is that the congee is creamy, tasty and it comes with half a stick of You Tiao. But the other thing I like is that they are not stingy with the ingredients. There are plenty of Century Egg and Pork Slices in this congee. 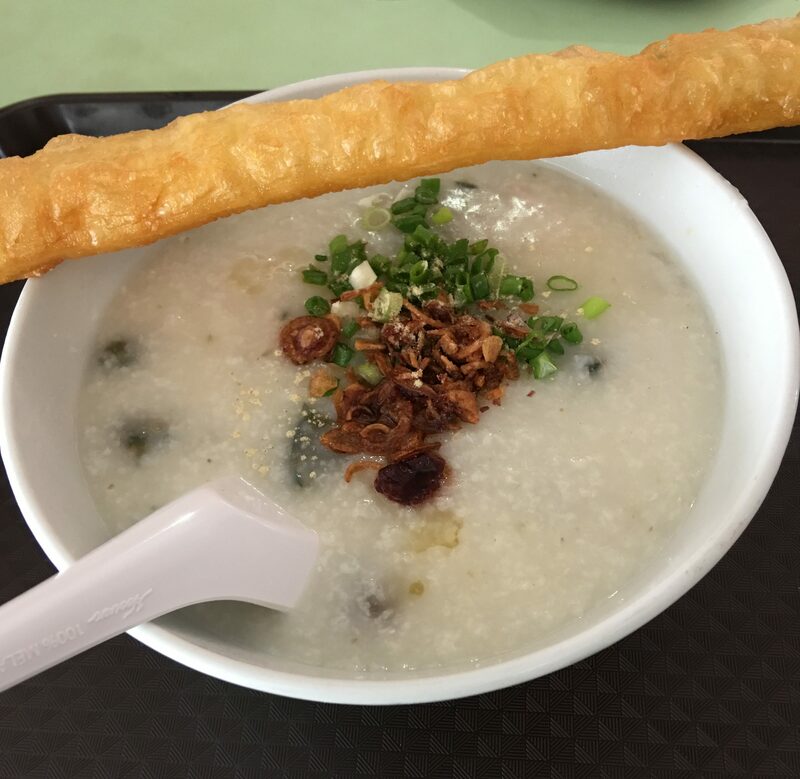 And it’s thick, Hong Kong style, that’s what is great congee or porridge. Not the watery kind. Here is the plated version to eat there. 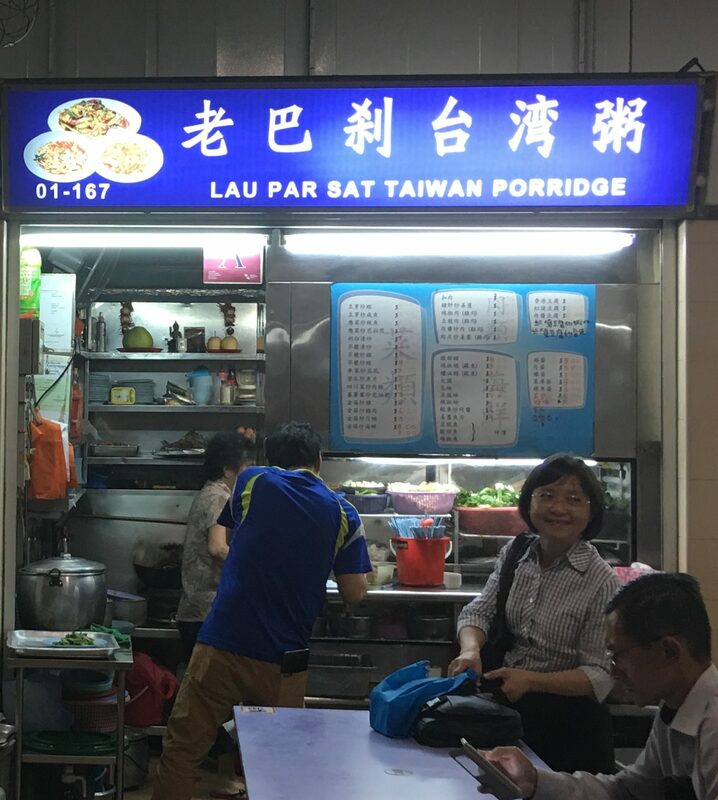 Taiwanese porridge is basically Rice Soup and Lau Pa Sat Taiwan Porridge (167, right) is a very popular stall at Old Airport Road. You can order you porridge and all the side dishes you want here. But if you can’t read Chinese, you might not be able to see what they have. But they will help you out though if you ask. They are only open in the evening. Joanna (73, center left) offers Frog Porridge, for those inclined for this. I haven’t tried it, but it could be worth a shot. 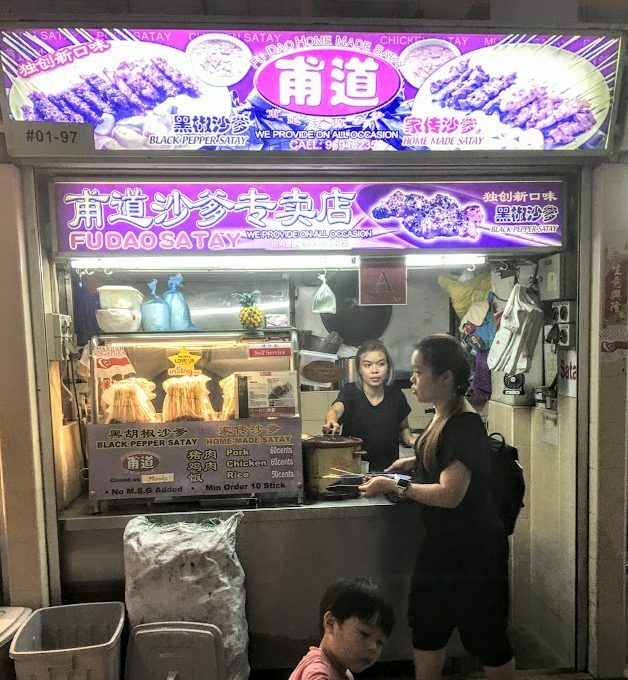 Frog Porridge is hugely popular in Singapore. 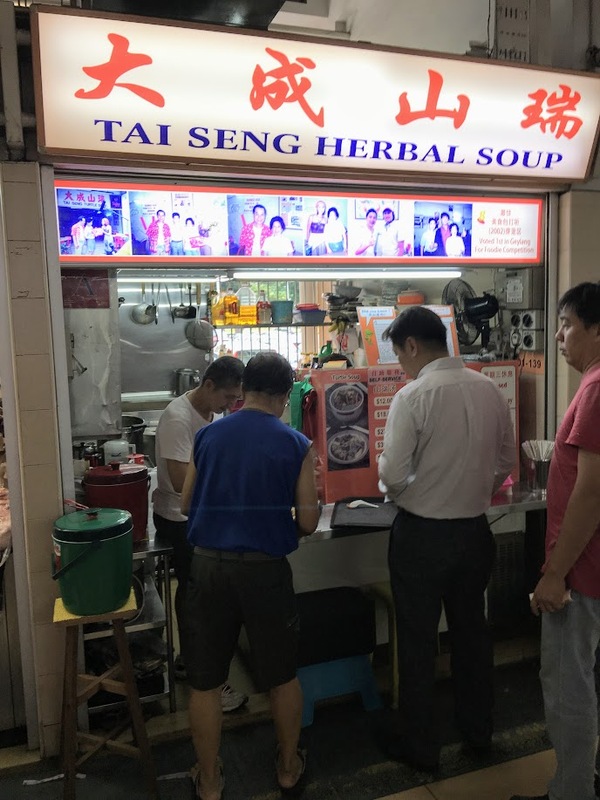 Soup can be gotten all day too, from two different adjoining stalls, Lao Da and House of Soup (21, 22 left) (House of Soup is NO LONGER IN OPERATION). They both offer a wide selection of soups (well, only one now). 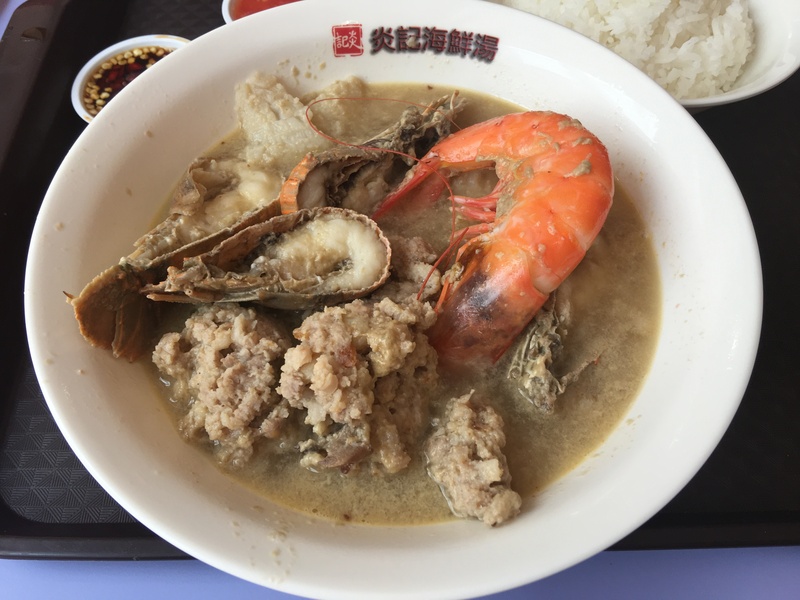 While this is the traditional soups, there is Seafood Soup also. Yan Ji (121, back middle right) has a branch here. 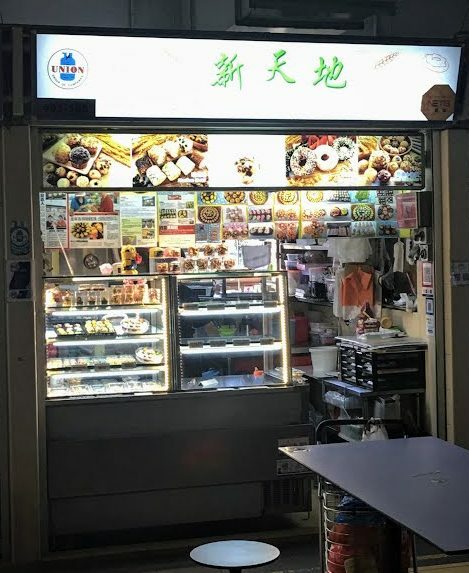 The original stall is in Woodlands. They have three main style of soups – Seafood, Fish and Crayfish. They come in a variety of sizes for you to choose from. This one is the Crayfish Soup, the smallest bowl is below, and costs $10. It contains Prawns, Fish Filet, 2 small crayfish (it’s usually one larger one) and meat patty. Rice is extra at $0.50. I have to say the soup is awesome. The taste just hits you and gives is a great taste. And the next best thing? 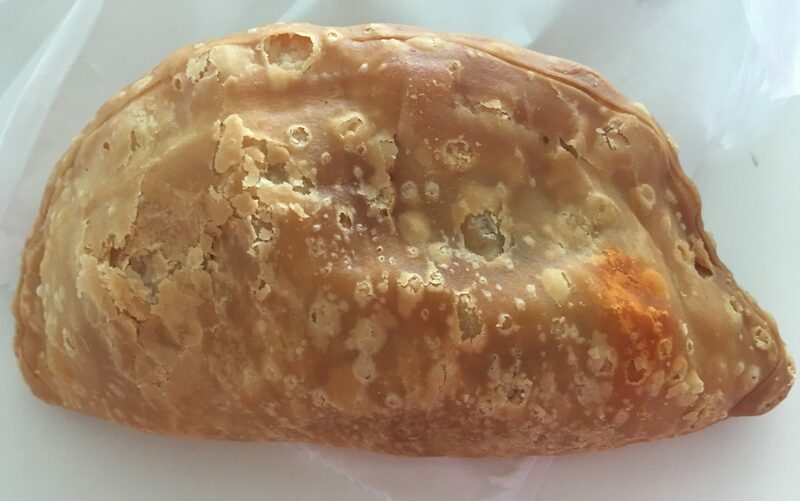 Not the seafood, but the meat patty that is broken up in the soup. That is awesome tasting! 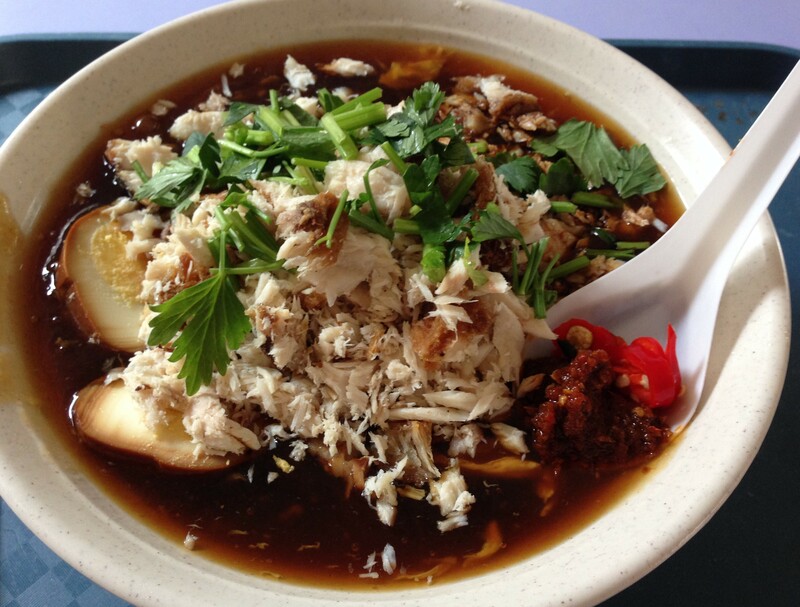 This is a good option to get while here, as long as you don’t mind hot soup in a hot hawker centre! This is seafood with Prawn, La La and Crayfish. This version is $10. It’s not bad, with it was a bit less soupy, but the taste is pretty good. All freshly made too. 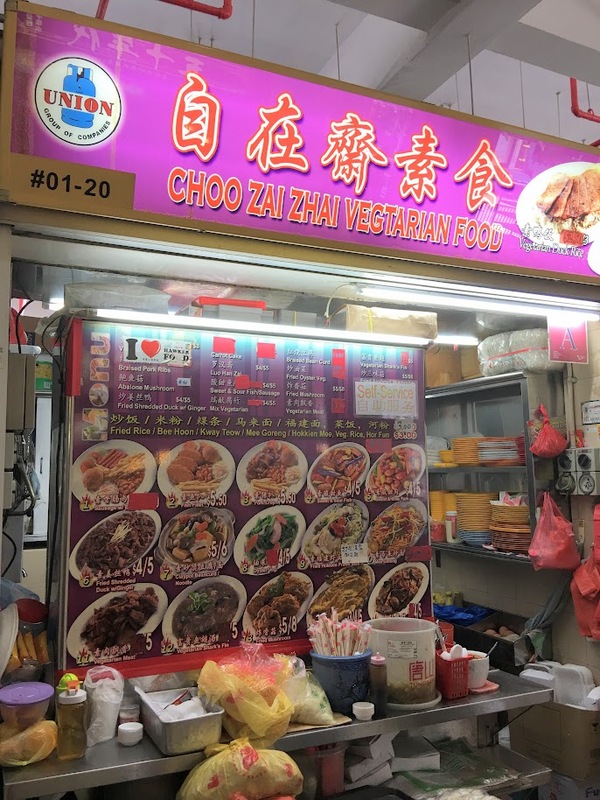 If you want Vegetarian Food, right next door is Choo Zai Zhai (20, right). They offer a nice selection. But be warned, on the first and fifteenth of the month, they are packed and the queues and wait times are very, very long, as they are the only vegetarian stall at Old Airport Road. 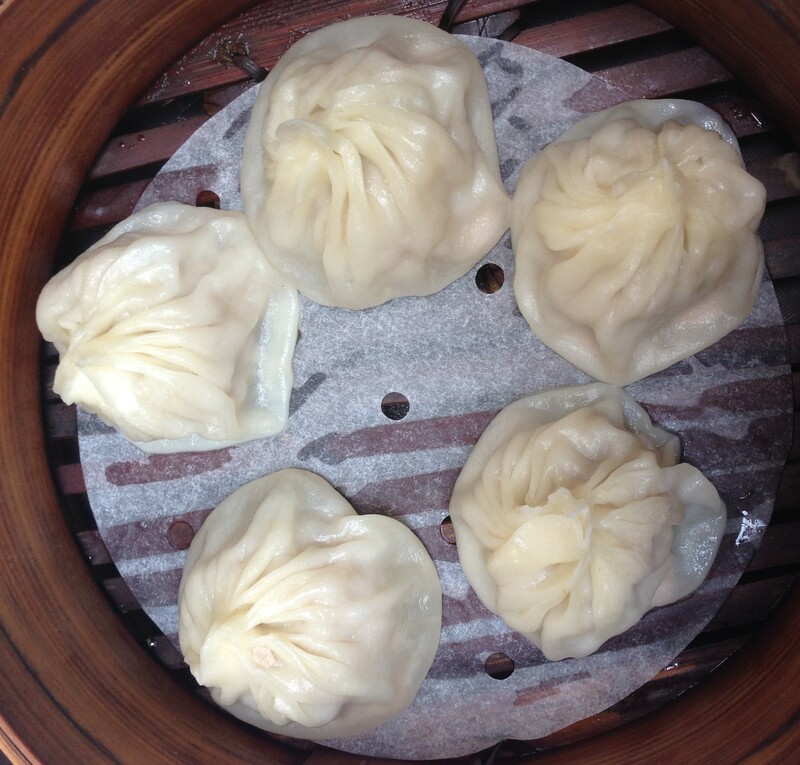 So of course, there is the Xiao Long Bao. Not a lot of soup for me, and the meat is ok. Pretty standard. But the Guo Tie is pretty good. Nicely fried on the bottom and not too oily, this one has a nicer flavor than the Xiao Long Bao. Watching them work is pretty cool. They make everything to order. So you can watch the lady pour the rice flour mixture, add in the meat or veggies that you want and then watch her scrape it onto the mat and roll it together. The finished product just looks awesome. 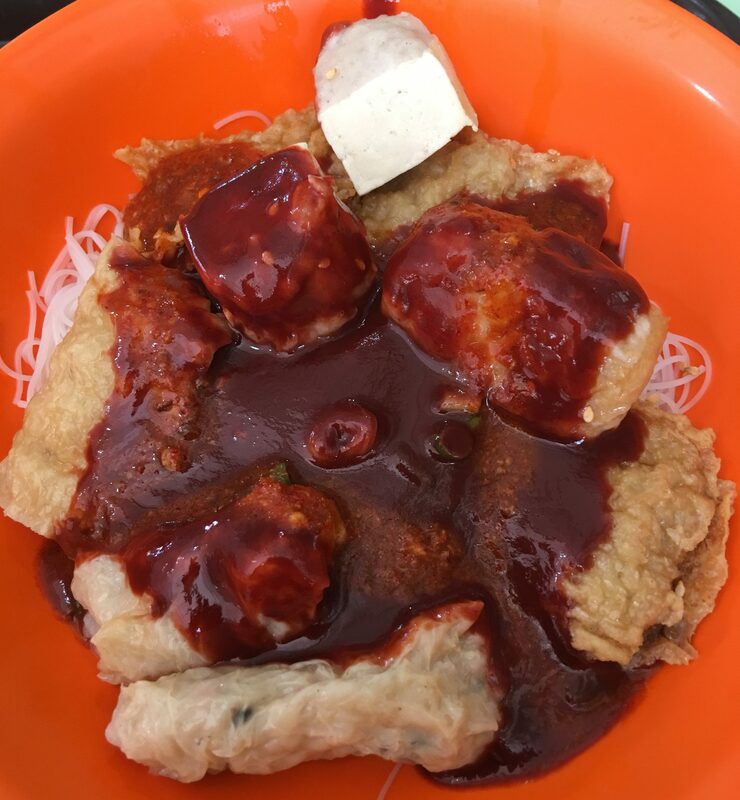 Delicate sheets of rice flour, the meats are nice and fresh and the sauce is wonderfully addictive. You’ll wish you had more rolls to dip it in. Definitely a hidden gem here. What do I wish Old Airport Road had, but doesn’t right now? 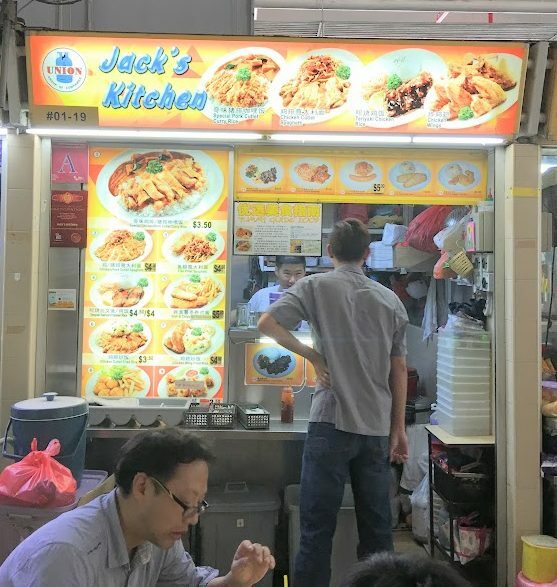 A real good Nasi Lemak stall for one. You can get the simple ones with Otah, and a Nasi Padang, but a Chinese-style Nasi Lemak would be nice. But, as I mentioned before, a Prata stall would be excellent to have here. There is so much here, you just have to make return trips to find out. Just be prepared to queue, but you will find it’s worth it. Take the Circle Line MRT and alight at Dakota to find the path to deliciousness. Thanks for your very comprehensive writeup! 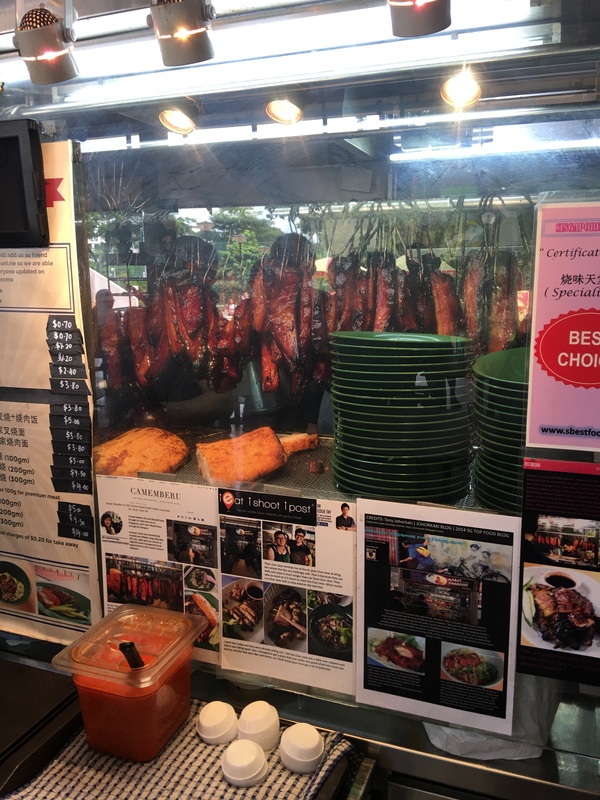 As a regular visitor to Singapore we always eat at this hawker market, I have just come across your website – and excellent review, well done. Very well done. You bothered to draw a schematic plan of the place to detail out the food stall locations. This is rare in food blogs. Wow very detailed information that you have shared! Thank you Jay! 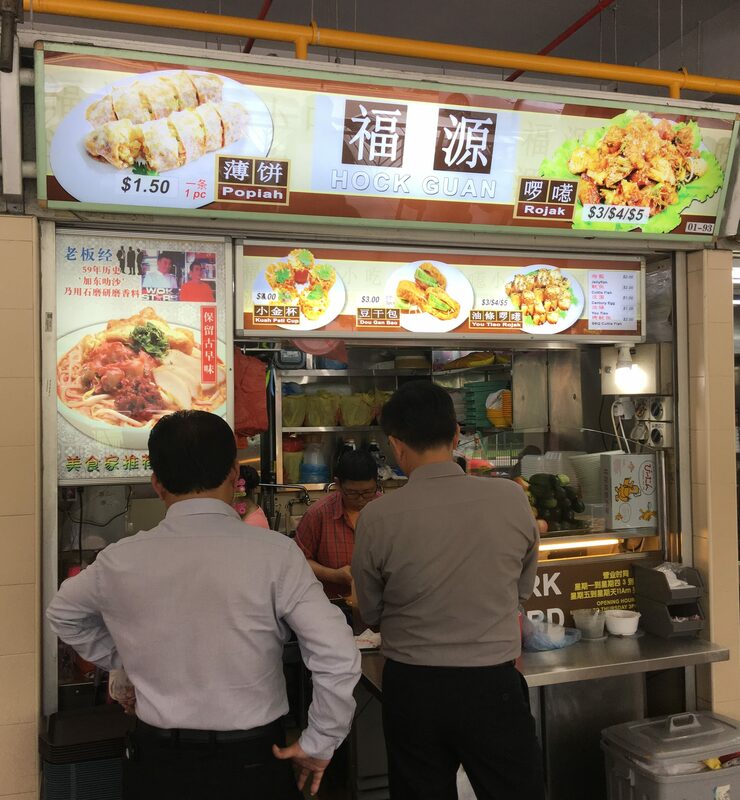 The official closing time for this food centre is 2am, however, do all the store really open until 2am. What is the average time they close? I’m not that much of a late night owl, so I don’t have a lot of late night experience there. But most of the stalls start to close by 9:30-10pm. You’ll be hard pressed to find most stalls open after 10pm. Hi, just to have a check. 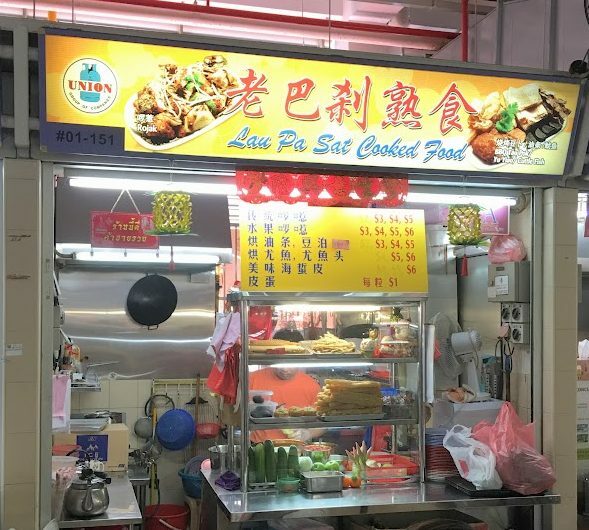 Is the Chinese Vegetarian food stall still open? I planned to bring a group of my friends over and one of them are vegetarian. Thanks! Still open as of last check. 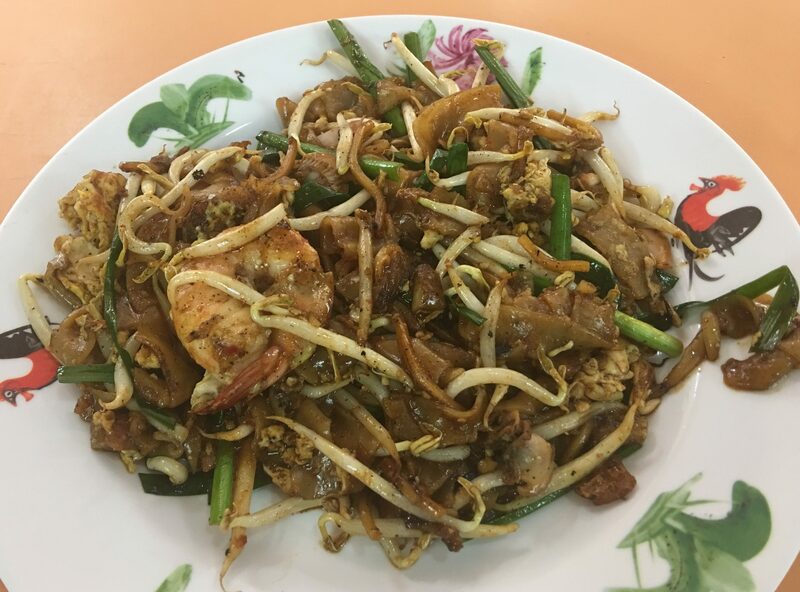 Stall number 20, by Lao Fu Zhi Char Kway Teow. 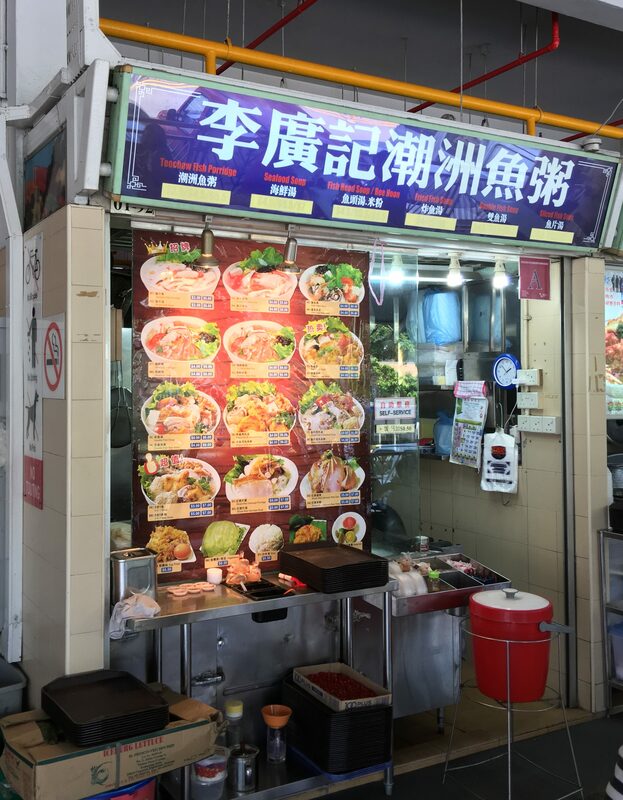 Sorry, what I meant is that the vegetarian stall is in the same grouping/area/block of stalls as Lao Fu Zhi, just in case you were wondering where the vegetarian stall was located. Awesome job for having this article! also, do give the western bbq a chance! 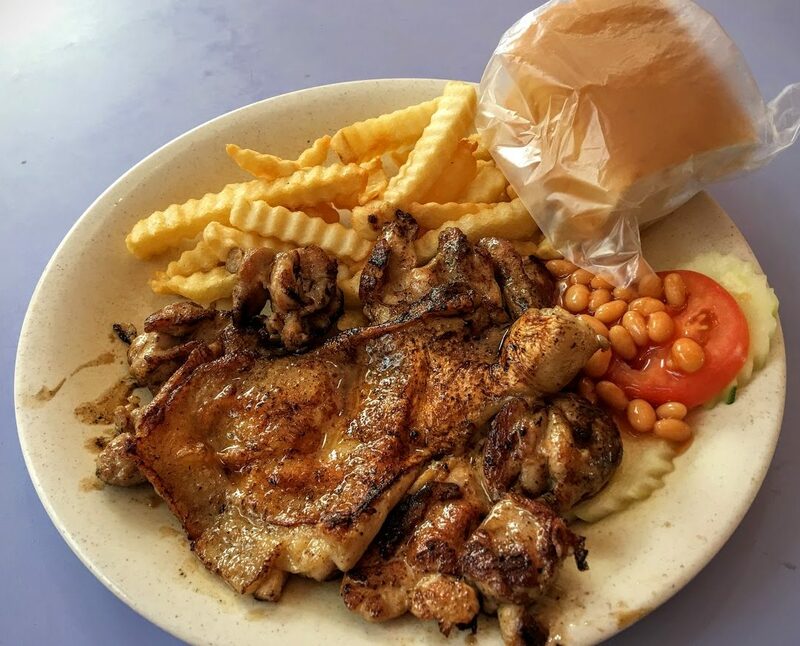 try their grilled chicken chop and ask for their special garlic sauce. it’s pretty good! 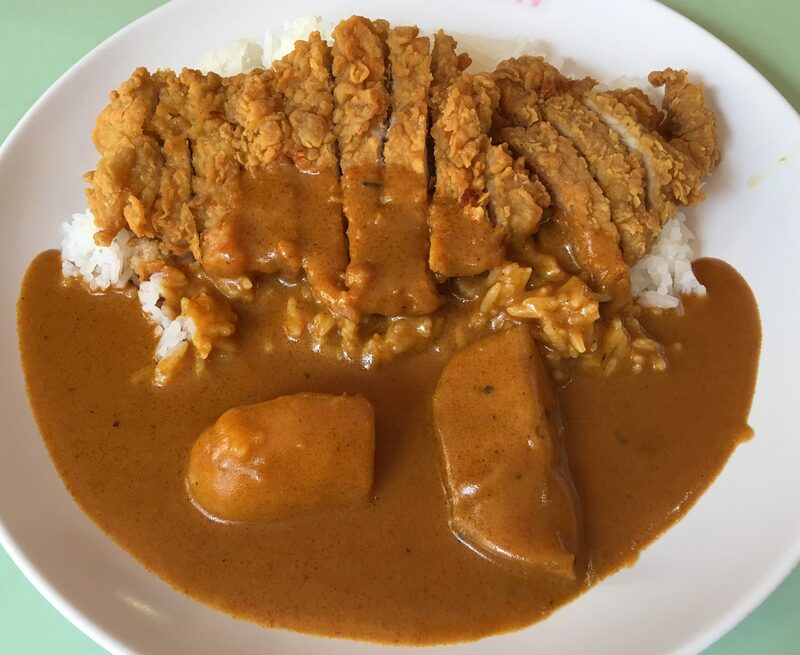 I tried the Pork Cutlet Curry Rice. Thanks for the recommendation! Have just tried the Pho Bo Tai today! Great soup! Ok I will try next time 🙂 Thanks. 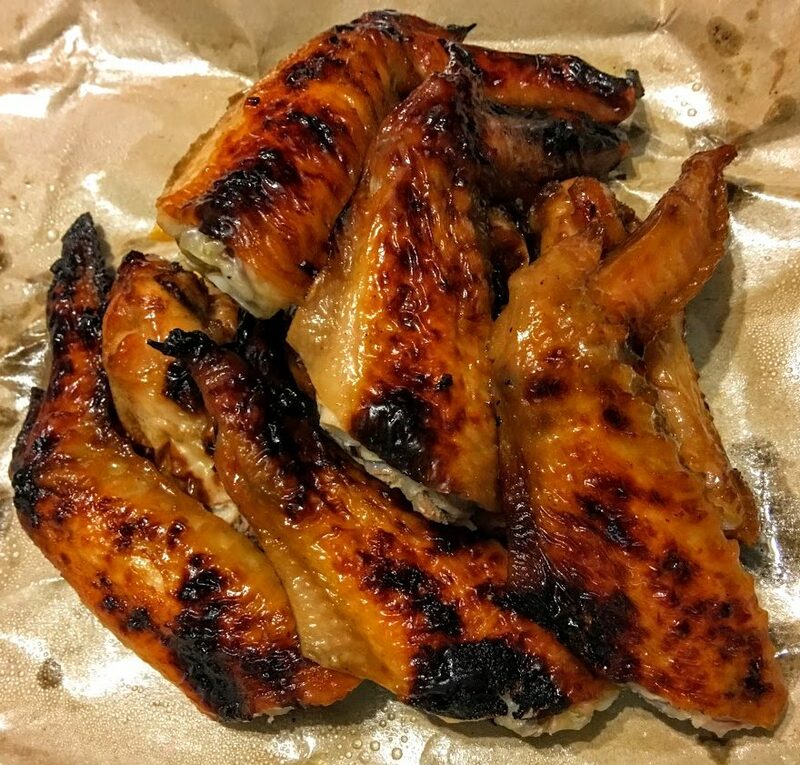 The bbq chicken wings at 01-24 is juicy n delicious.. has been around for 20+ years n still doing a roaring trade ..quite surprised it was not featured in ur post. what happened to roast paradise 01-122? It shifted stalls. It’s now facing front, directly behind where it used to be. I have had their set. Will post it in there soon, need to update it. Hello! Thanks for the detailed write up. By any chance you know if the stalls are opened on Mondays? Some are and some are not. It depends on the individual stall. Some have different off days as well. 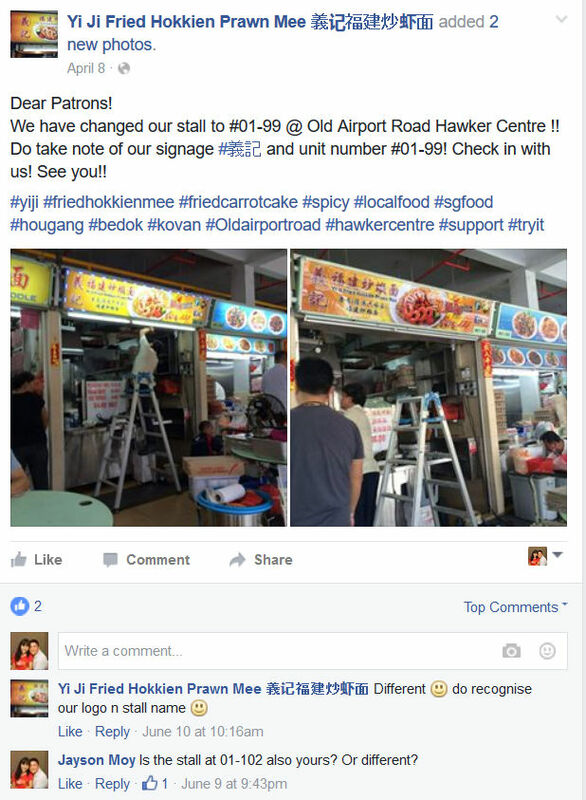 Is this hawker centre open during holidays like April 14? or on Saturdays? They are open every day, except perhaps around Chinese New Year and for their cleanings, which occur once every 3-4 months, but are announced. Fixed, thank you for the correction! Hmm. I used to stay nearby and had dinner here every other day. Miss those years. 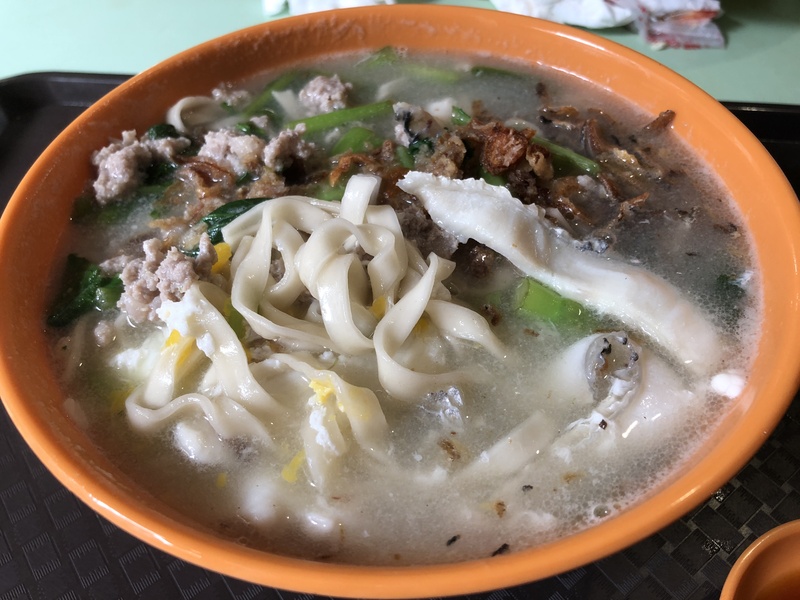 Just a note that Qiu Rong Ban Mian also serves very delicious home-cooked soups. 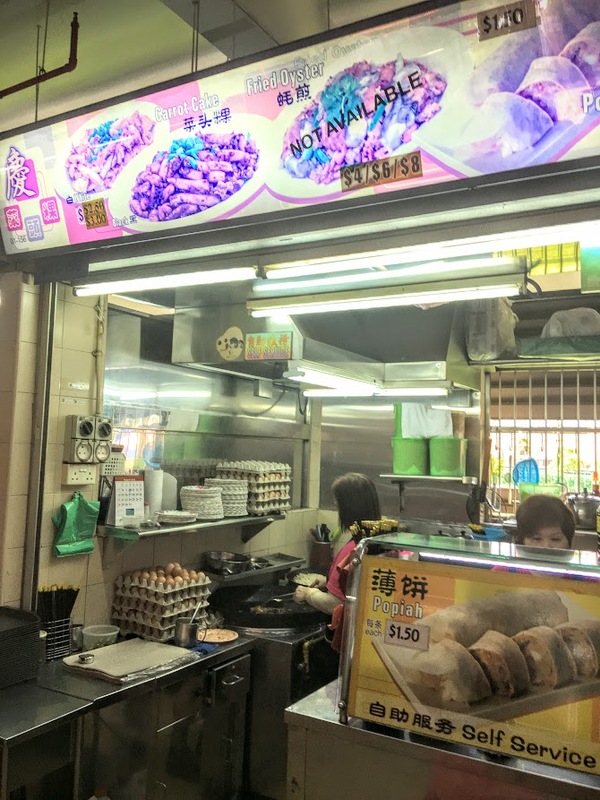 They have a long history of over 20 years from Roxy Square to Marine Parade and finally landed at OAHC due to renovations work at their previous location. Am very glad to find the stall recently via word of mouth! There are a couple of omissions I can think of; the sole herbal drink stall which has been around for many years. And the handmade soon kueh near to the Mattar Seafood stall. Thank you so much for the time and energy that you have dedicated into deciphering the mysteries of this hawker/food centre. Your effort is much appreciated, as it this will be my guide when I am in Singapore on the second week of February 2019.